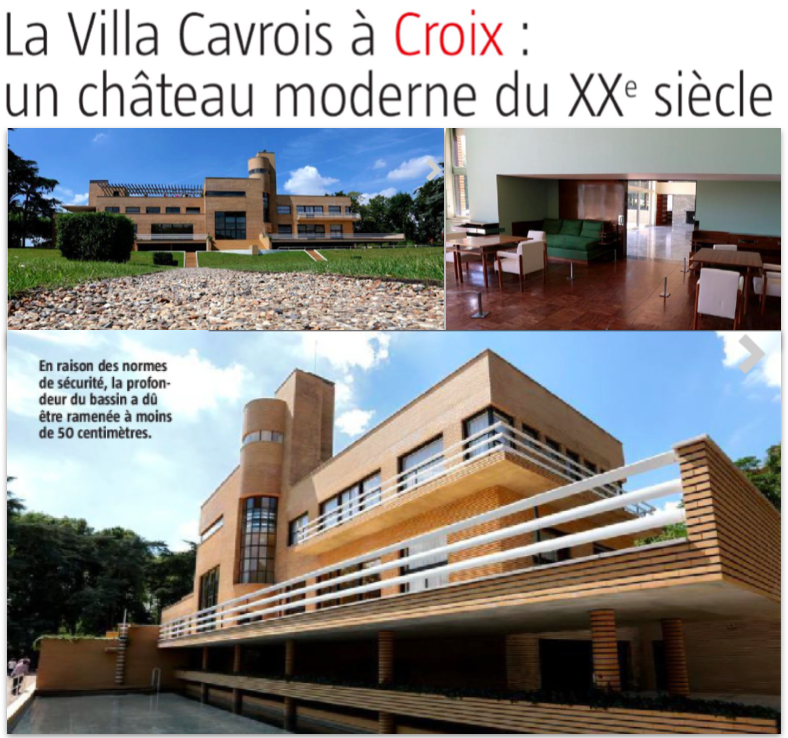 Built between 1929 and 1932, the villa was the resuit of an order placed by Paul Cavrois with the architect Robert Mallet-Stevens to house his family of seven children and his domestic servants. 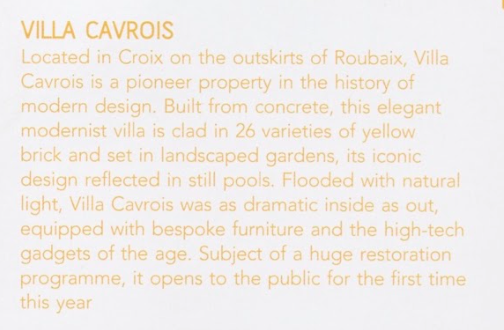 Covered in yellow facing bricks set on a concrète frame and double red brick walls, the villa was thought out as a total work of art comprising an exemplary case of homogenous construction between architecture, décoration and furniture. 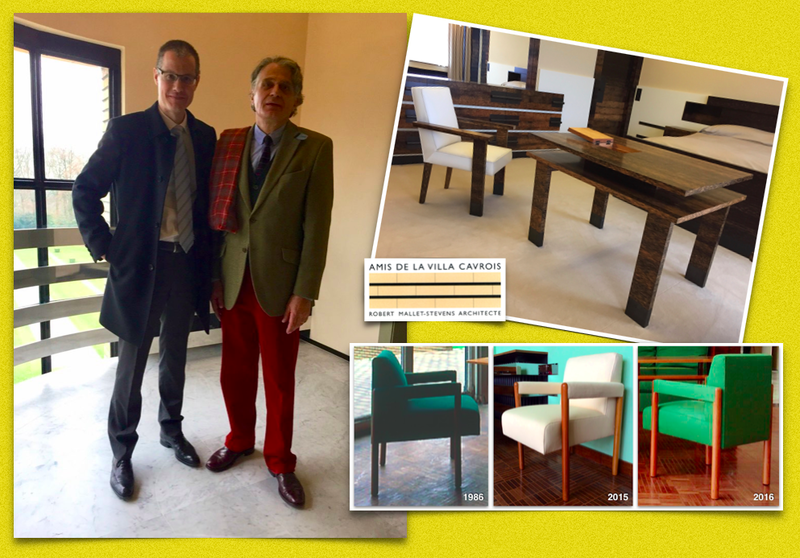 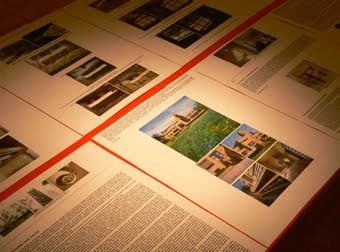 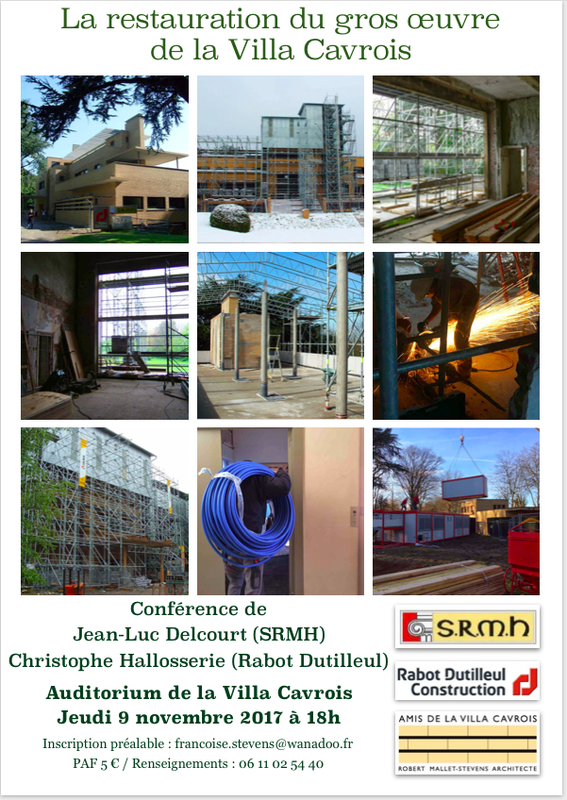 It is the architect's technical and aesthetic manifesto in terms of the care given to its materials and equipment. 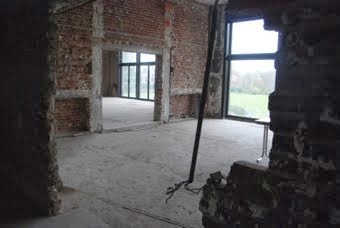 The villa was occupied by German troops between 1940 and 1944. 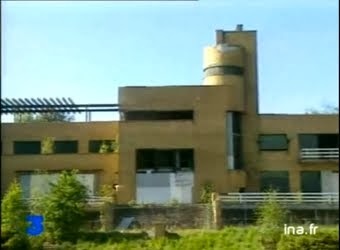 It was damaged at the end of the war. 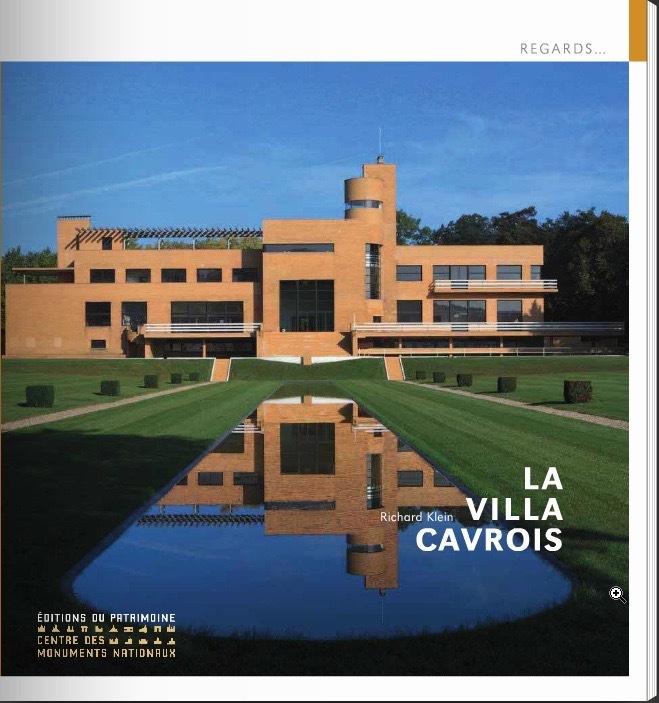 When he returned in 1947, Paul Cavrois called upon architect Pierre Barbe to add two apartments for his elder sons.The family lived in the villa until 1985. 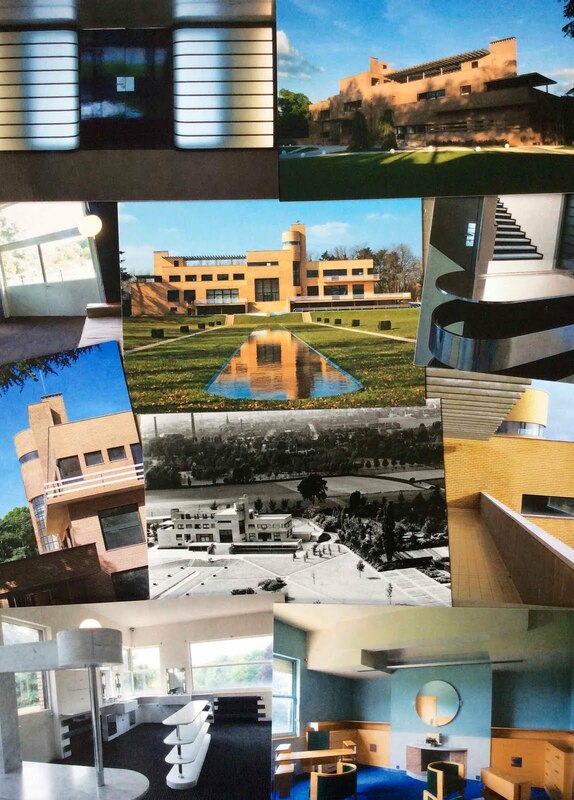 The following year, it was sold to a real estate firm that wanted to subdivide the park. 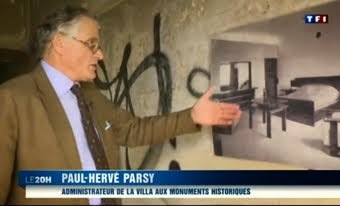 Despite its automatic classification as a historic monument in 1990, the villa was no longer maintained by its owner, who abandoned it to looters.The State bought the property, which was in serious danger, in 2001, and entrusted it to the Centre des Monuments Nationaux on 31 December 2008. 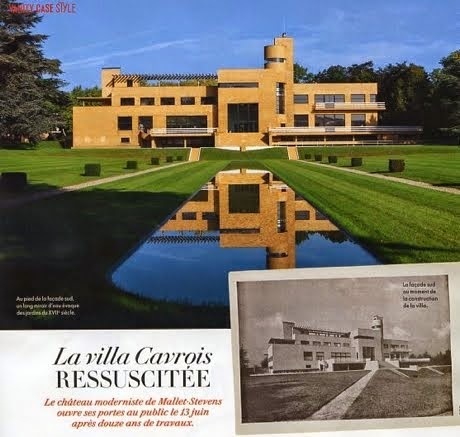 Starting in 2003, the State undertook a major restoration project for the villa in several phases, including reinforcement to the structures, restoration of the walls and roof, the garden, and the inside areas. 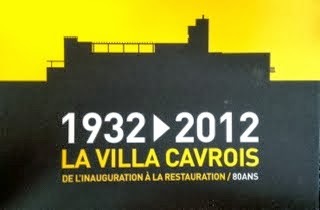 The restoration work sought to return the villa to its original historic condition as when it was inaugurated in l932. 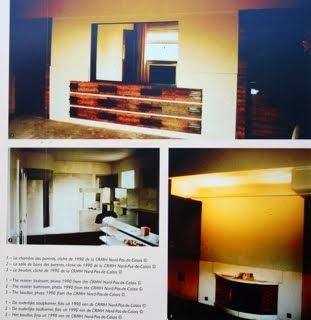 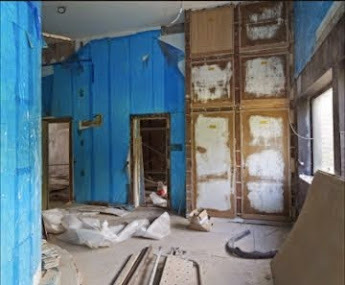 The initial volume of the rooms and decors were returned to their original state thanks to old photographs and archaeological traces of the building. 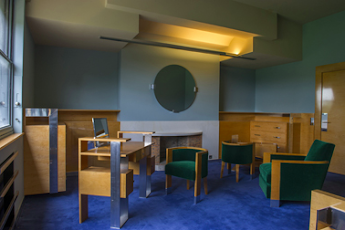 The lighting, the furnishings attached to the decorations, as well as the bookcases and benches have all been restored using the original materials. 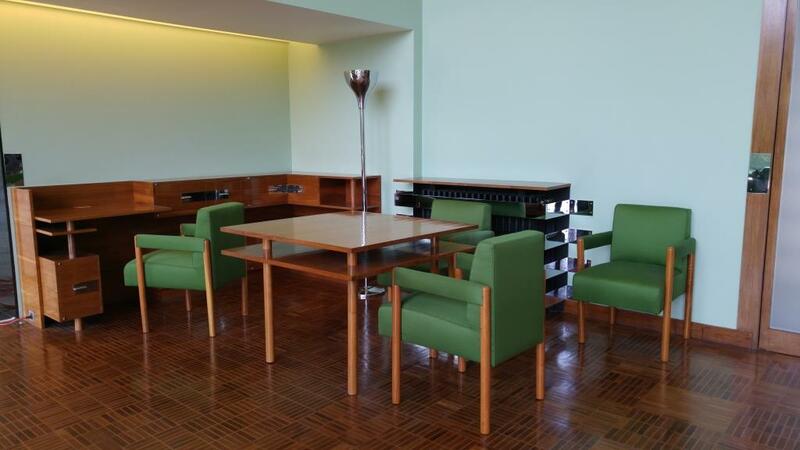 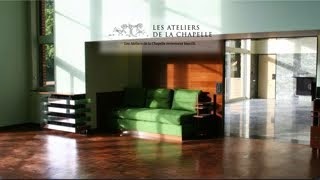 The parquet floorings, metal doorframes and marbles have been restored or returned. 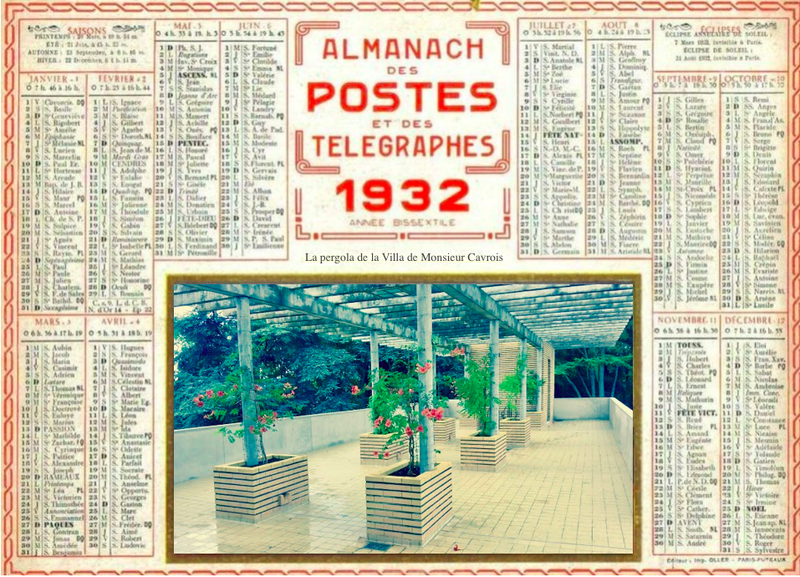 The restoration of the park has returned it to the original land's very subtle gradient with the precise layout of the alleyways, while replanting plant species identified from old photographs. 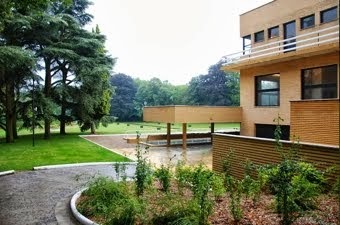 The reflecting pool, which had been filled in during the war, and the swimming pool have been restored to their original state. 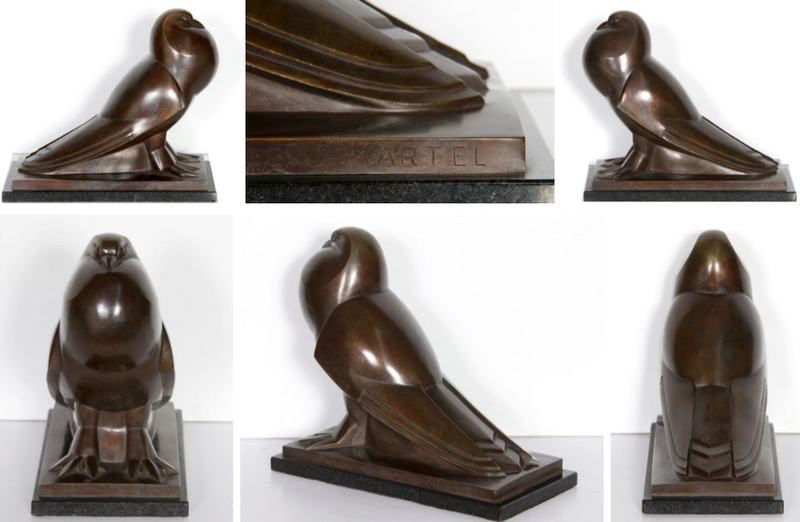 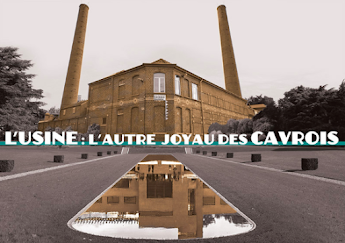 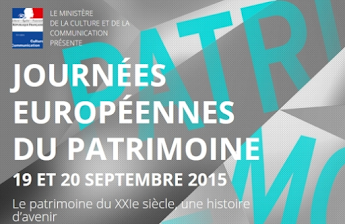 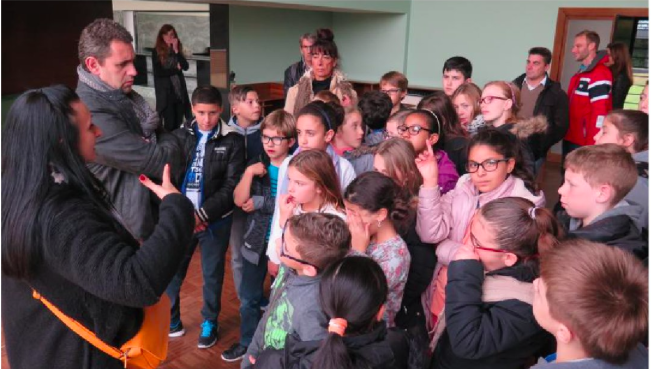 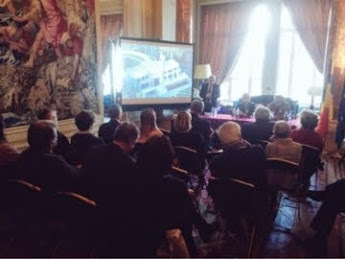 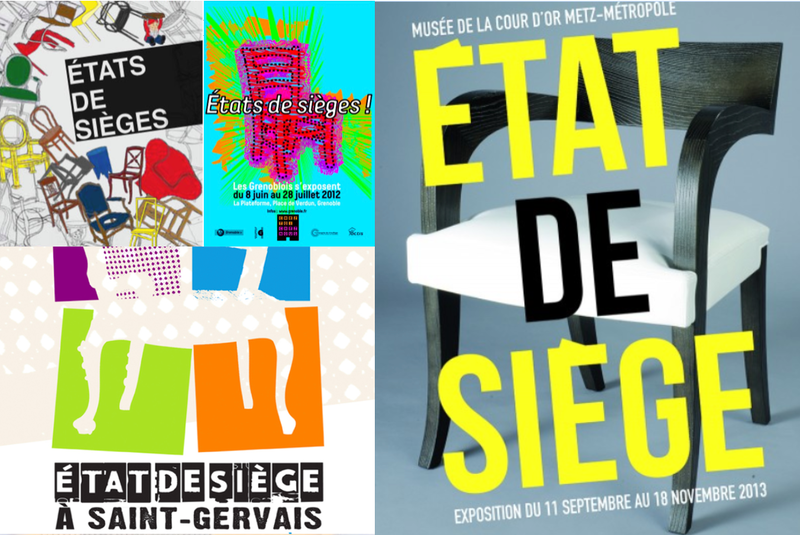 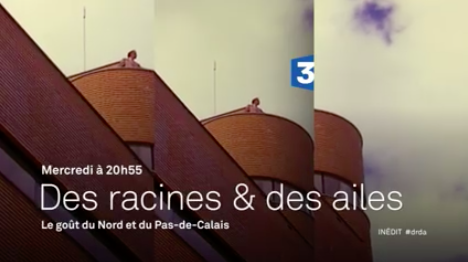 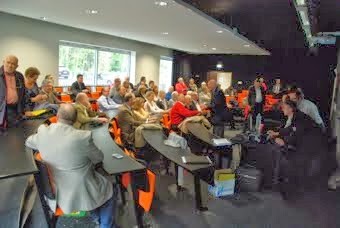 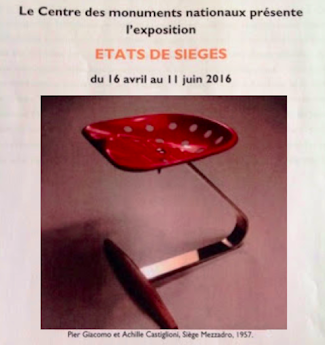 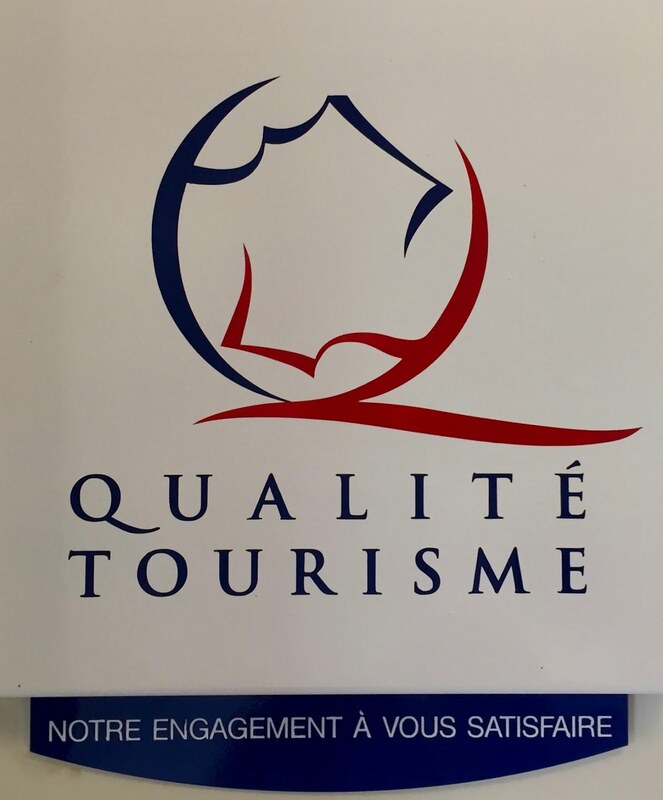 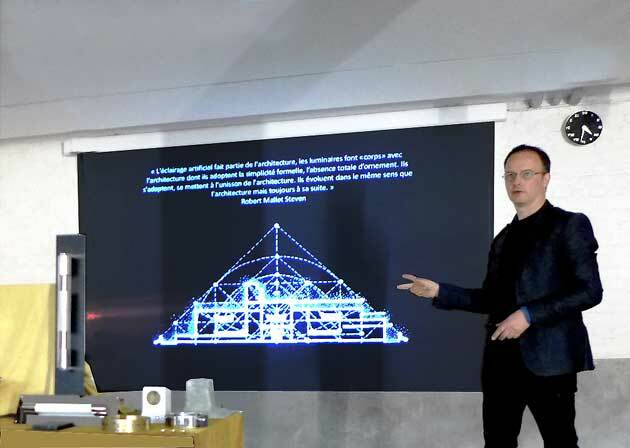 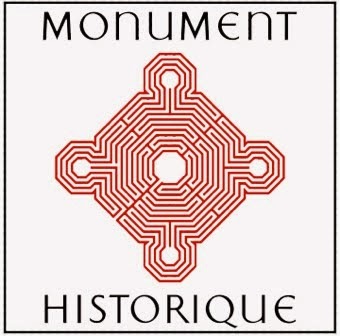 The restoration was carried out by the Direction Régionale des Affaires Culturelles du Nord-Pas-de-Calais and then by the Centre des Monuments Nationaux between 2009 and 2015. 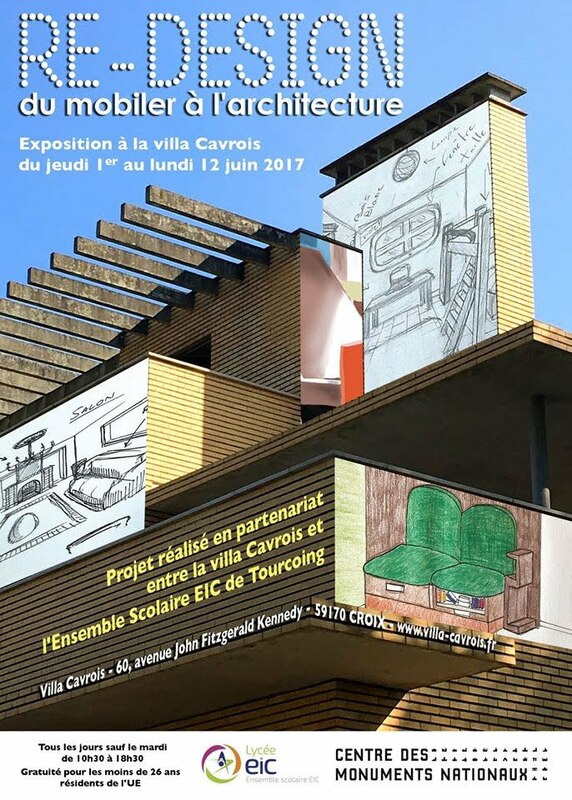 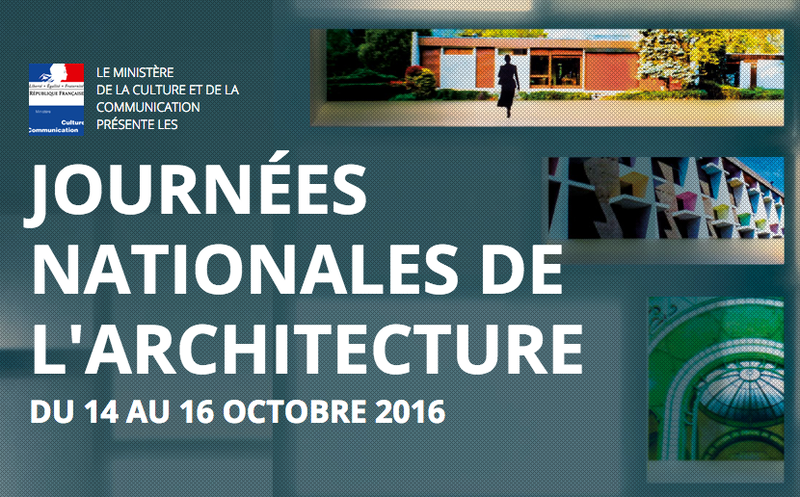 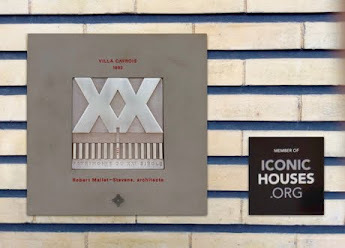 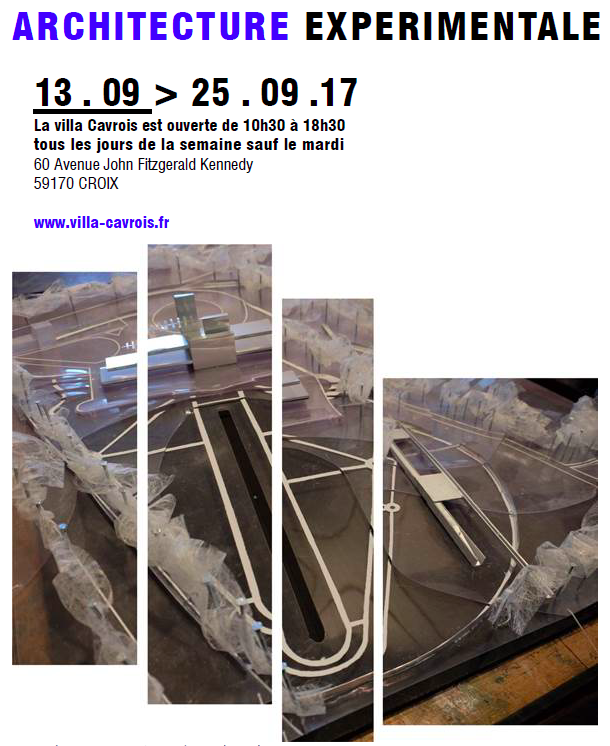 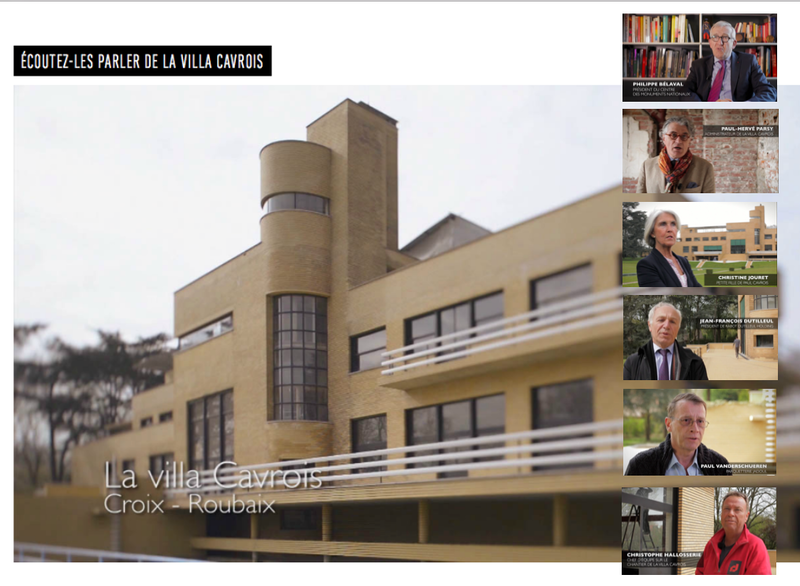 Since 2012, the villa has been part of a Worldwide conservation programme for emblematic houses of the 20th century," lconic Houses ". 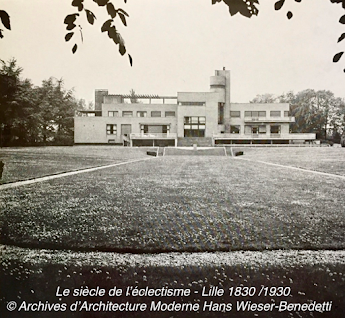 An architect born in Paris to a family of Belgian origin, he was influenced by the work of the Viennese architect Josef Hoffman, designer of the Stoclet Palace in Brussels. He was interested in the works of Frank Lloyd Wright and the Bauhaus movement in Germany, and worked with the artists of the Dutch De Stijl movement. 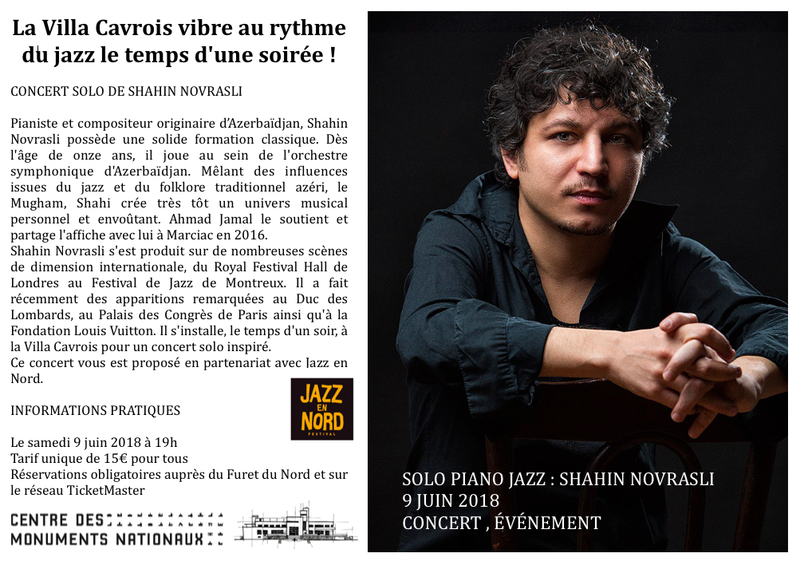 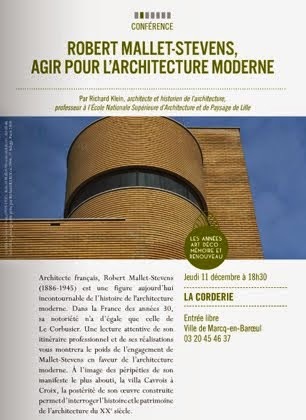 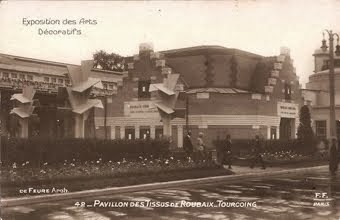 In 1929 he took part in the création of the review L'Architecture d'aujourd'hui and the Union des artistes modernes (Union of Modem Artists) for which he was named président. 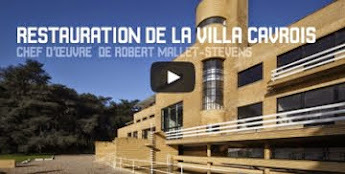 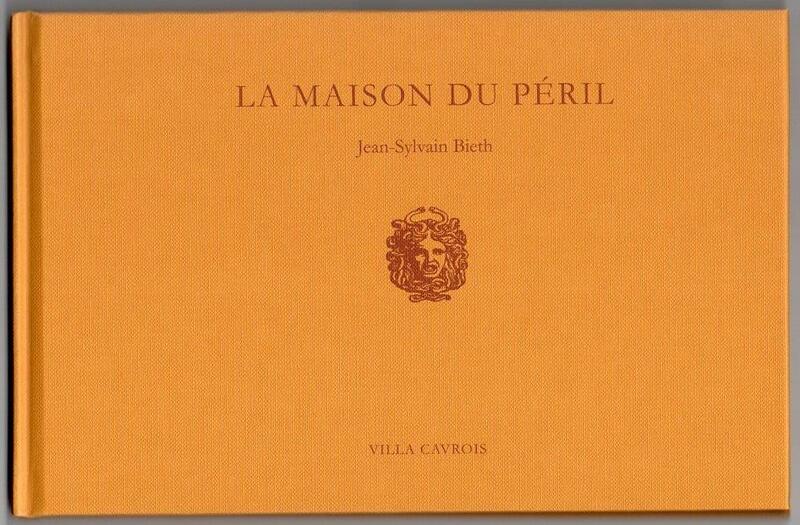 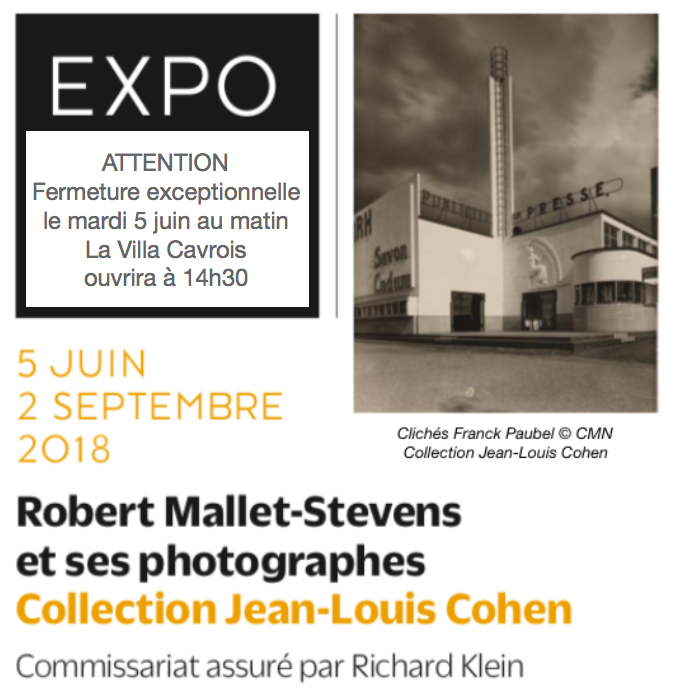 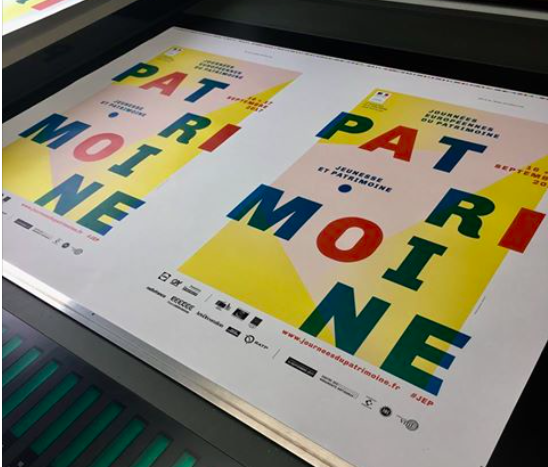 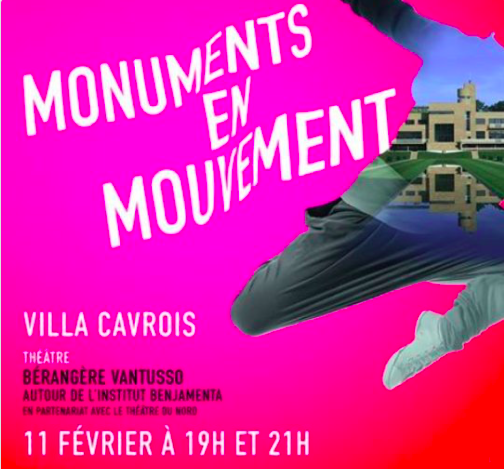 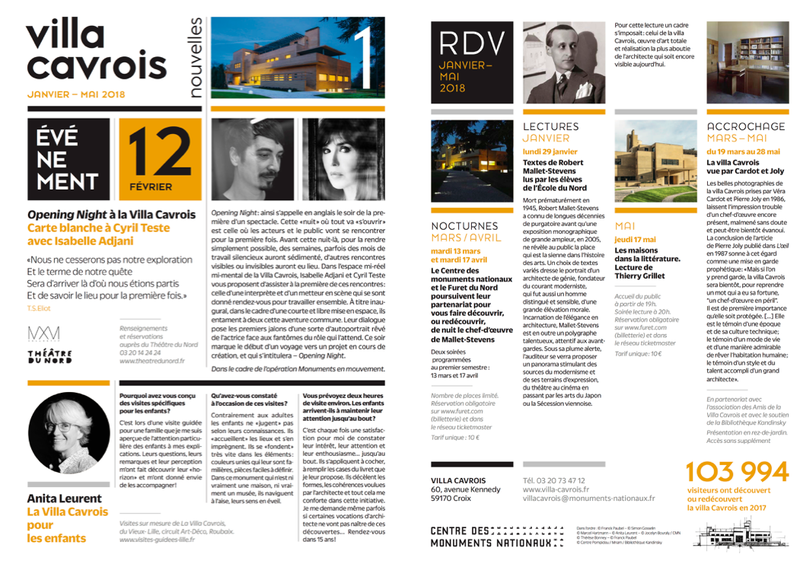 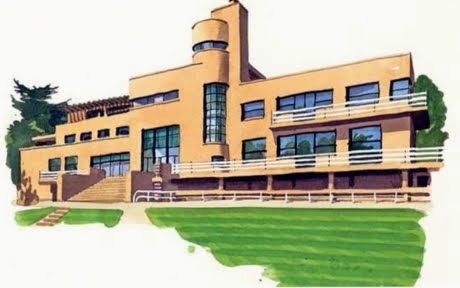 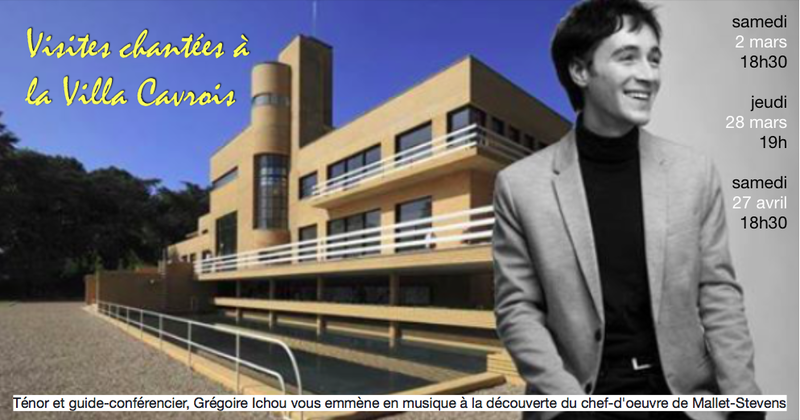 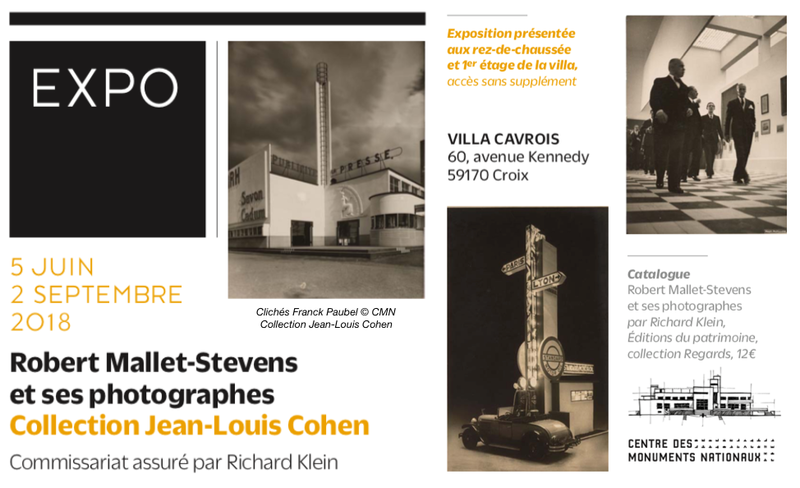 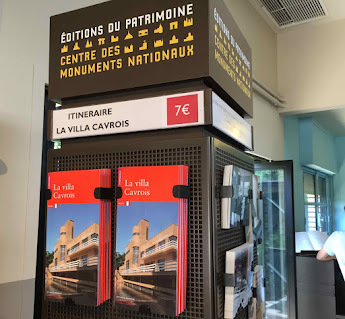 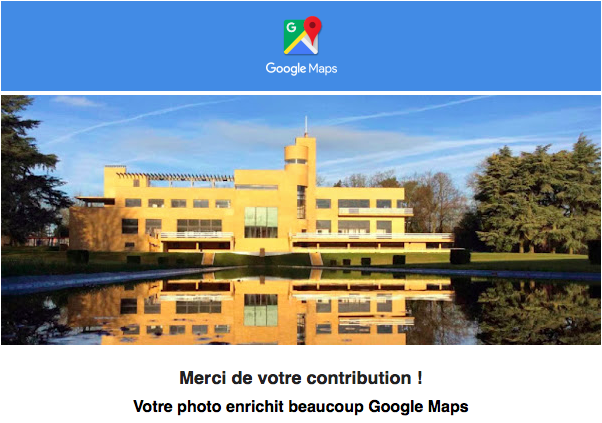 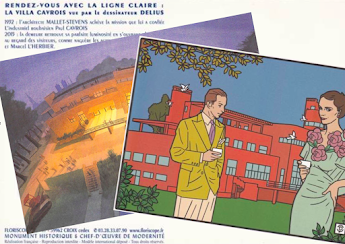 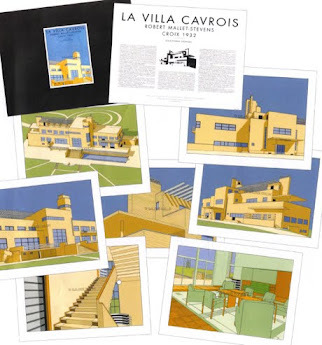 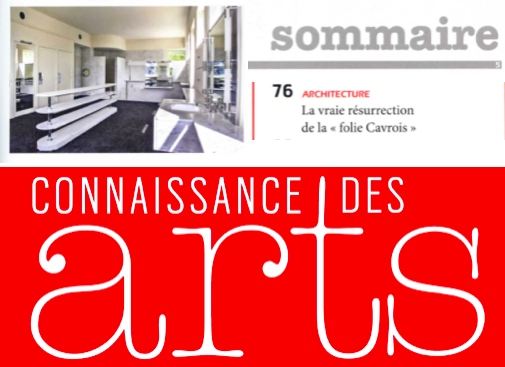 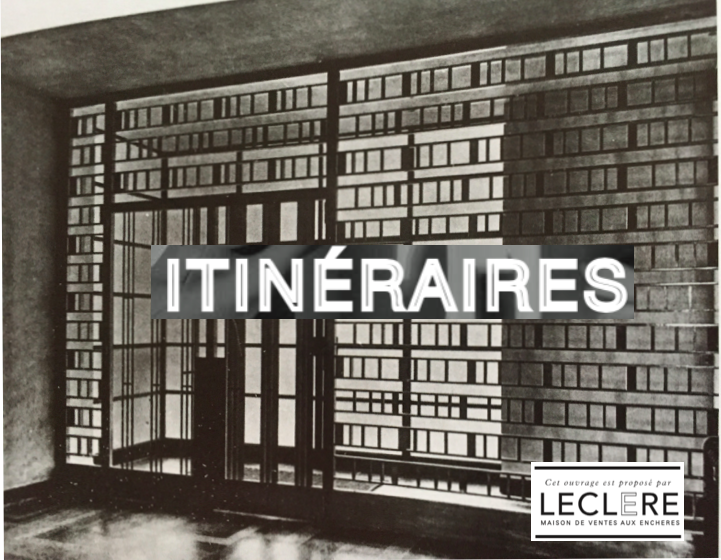 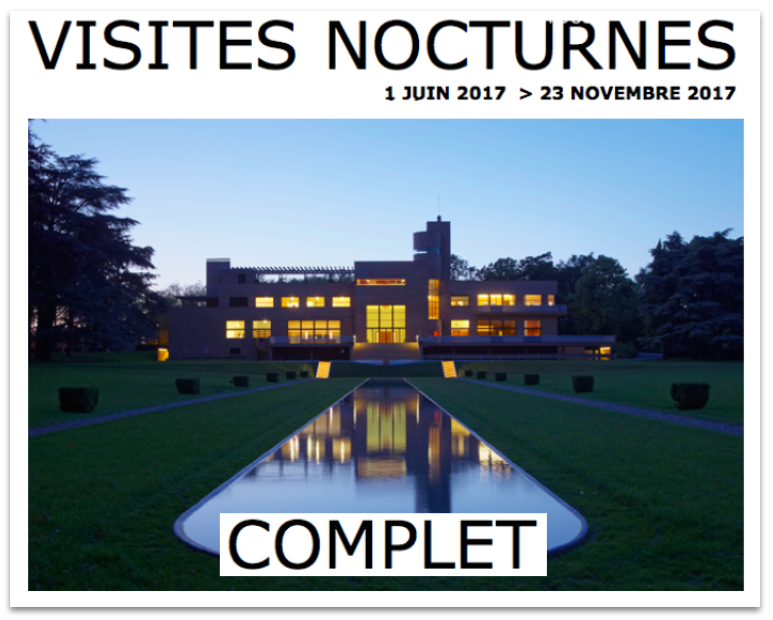 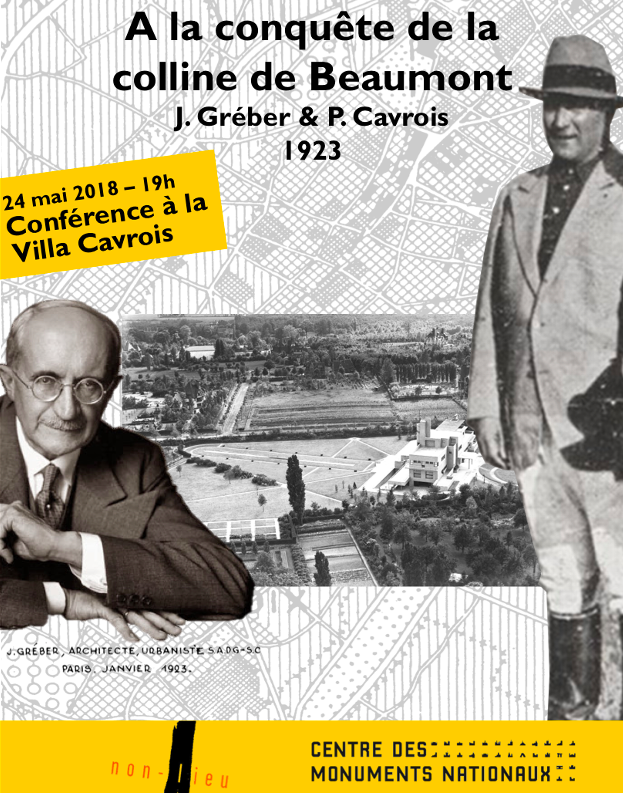 He was the author of emblematic buildings such as the Villa Noailles in Hyères (1923-1933) and the private houses located on the Paris street bearing his name (1927-1930), but also of industrial buildings, garages, shops and exhibition halls. 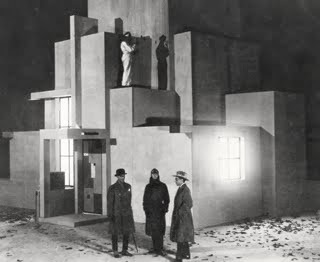 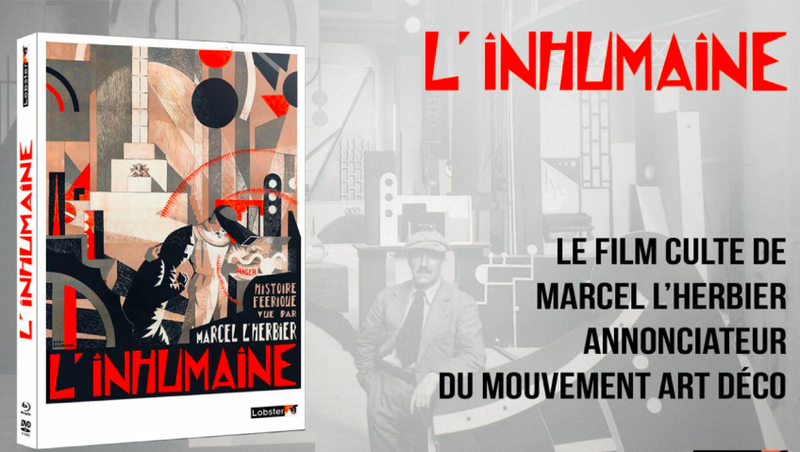 Between 1922 and 1928, he produced sets for some ten films including L'inhumaine by Marcel L'Herbier. 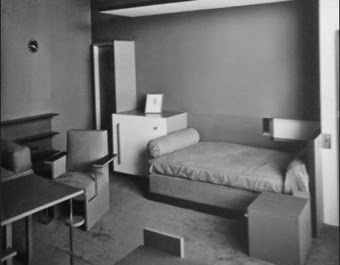 All his productions sought geometrical precision in their shapes, a simplicity in their volumes and a functionality in their spaces. 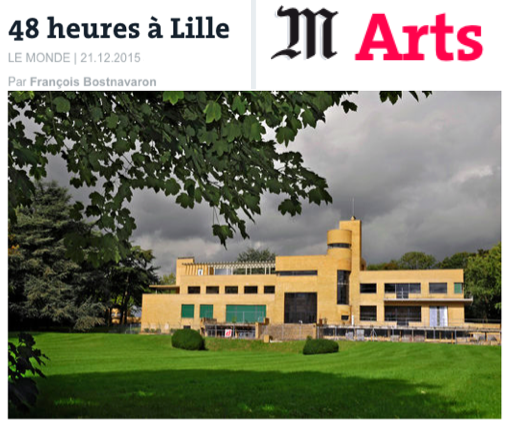 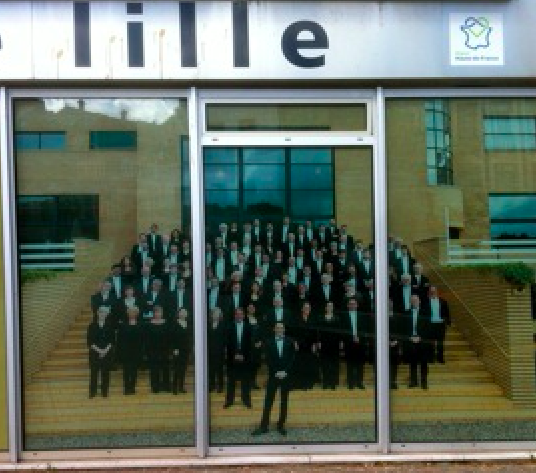 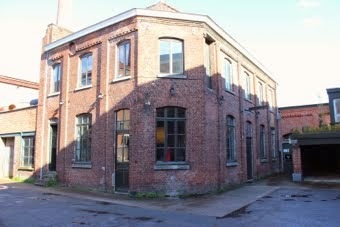 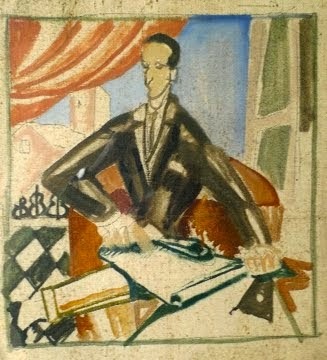 He was appointed director of the École des Beaux-Arts in Lille in 1935. 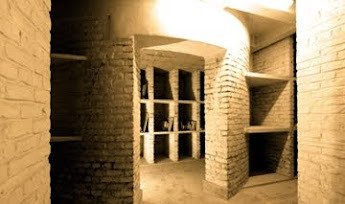 At his request, all his archives were destroyed upon his death. 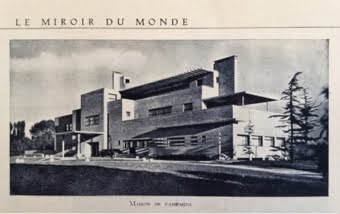 Paul Cavrois placed an order for a first house project with Jacques Gréber in 1925, but the project was never finalised. 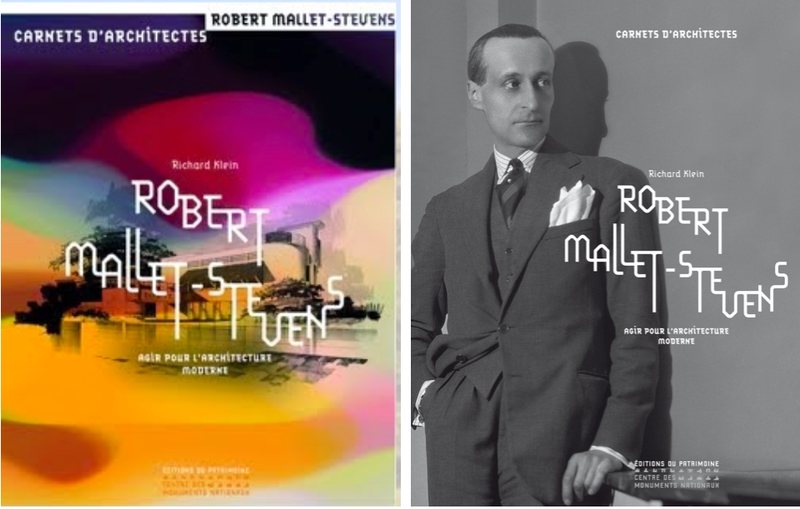 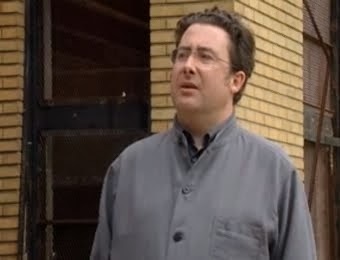 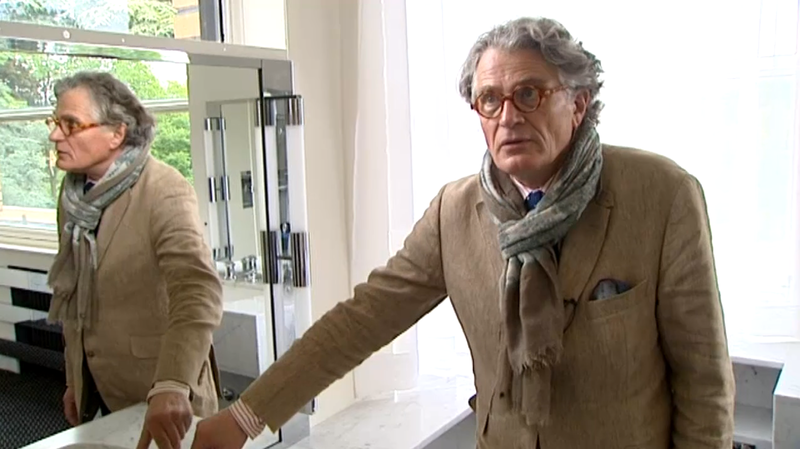 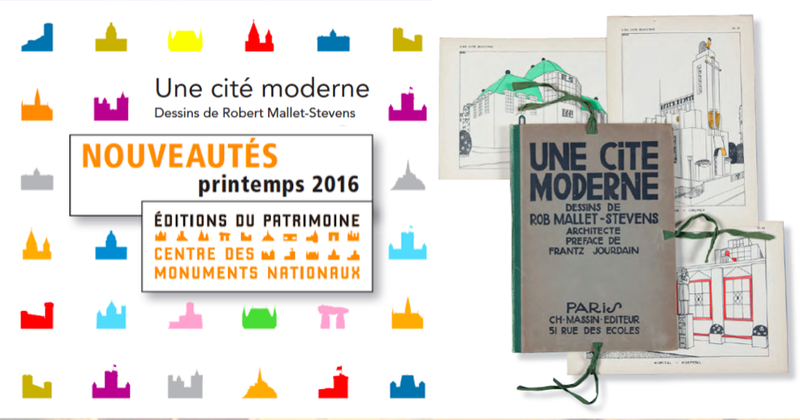 He then turned to Robert Mallet-Stevens. 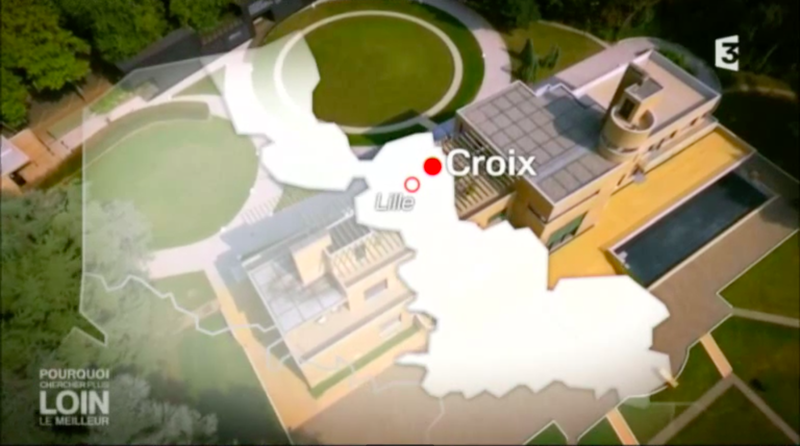 He wanted a large, modem house located on land in the town of Croix in what at the time was a country setting in Beaumont. 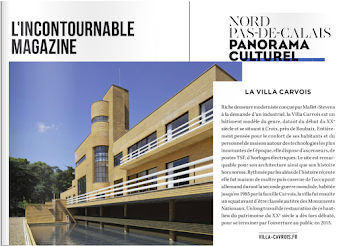 He thus demonstrated his desire to stand out from the traditional buildings of the region by calling upon an architect who had recently made a sensation at the International Exposition of Decorative Arts of 1925. 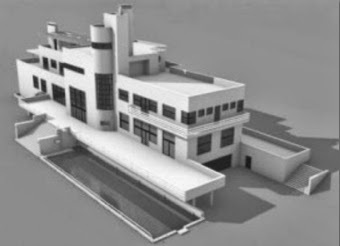 The first plans were drawn up in 1929. 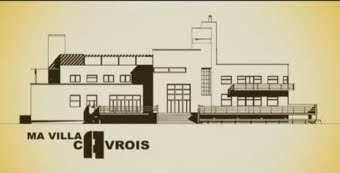 The following year, Mallet-Stevens brought Paul Cavrois and his son, Jean, to Holland to see the Town Hall in Hilversum, designed by Willem Dudok (1884-1974). 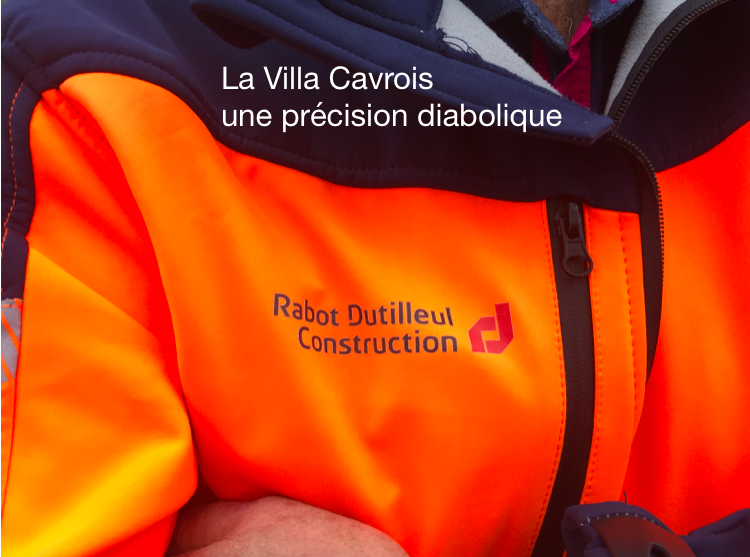 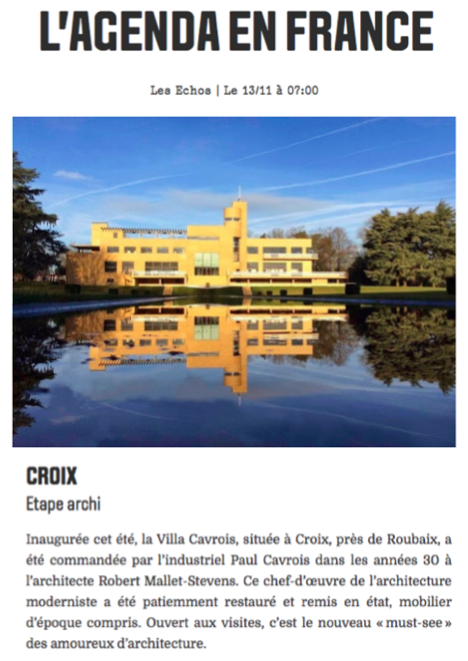 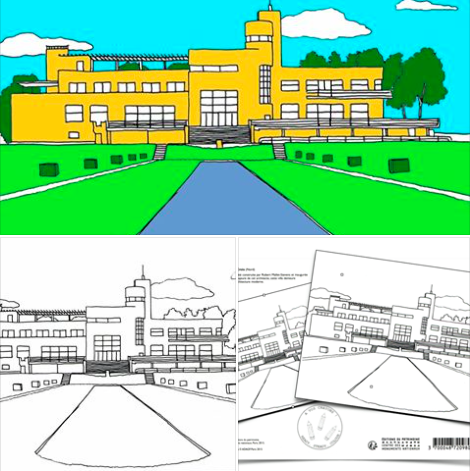 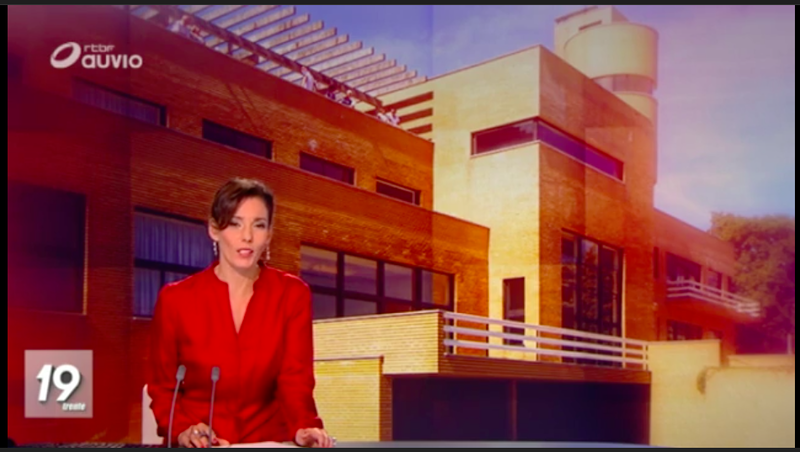 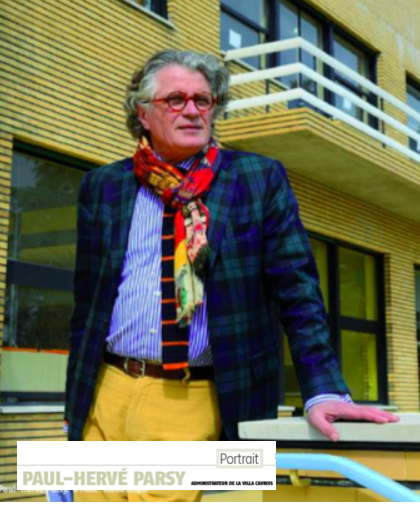 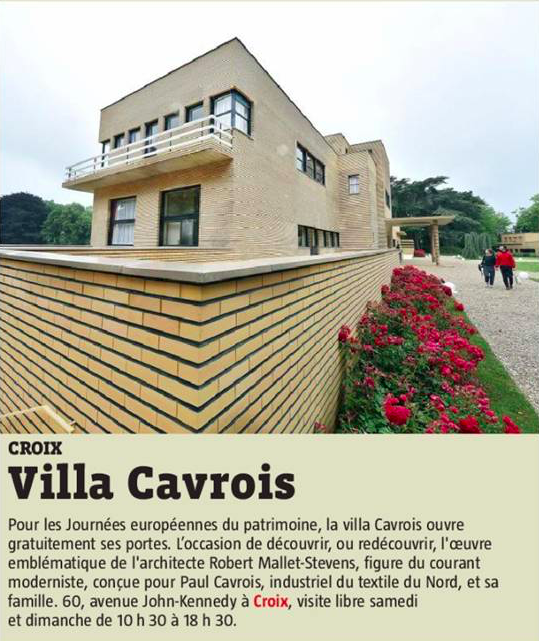 Paul Cavrois authorized him to work in the modemist, geometric spirit of the building and accepted that the façades should be covered with yellow bricks specially produced for the villa. 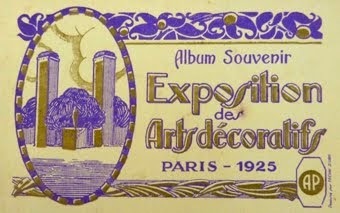 Work began in June of 1930. 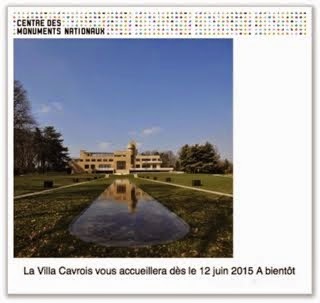 Mr and Mrs Cavrois inaugurated their home on 6 July 1932, for their daughter Geneviève's wedding. 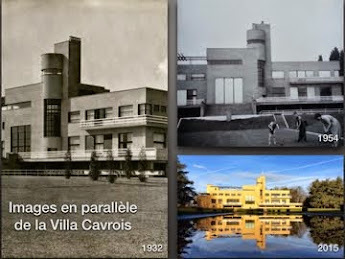 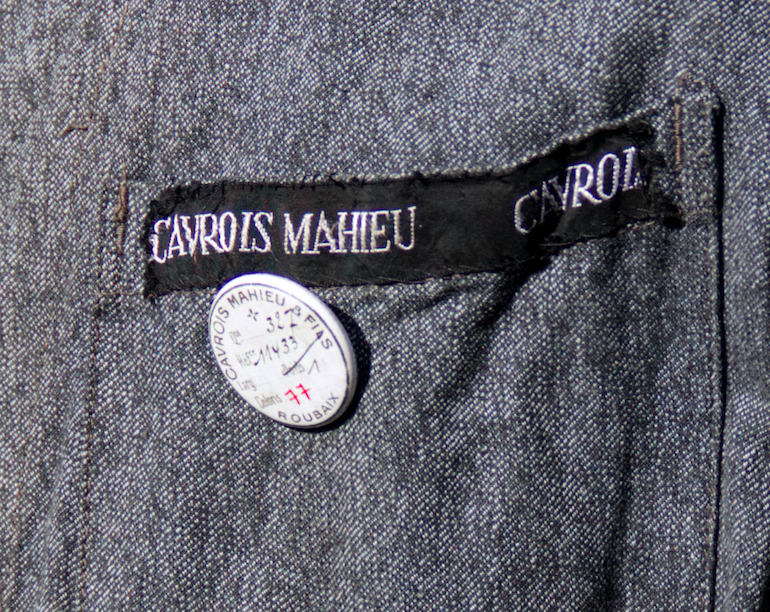 Paul Cavrois (1890-1965) came from the industrial bourgeoisie of Roubaix and owned two spinning opérations and dye-works. 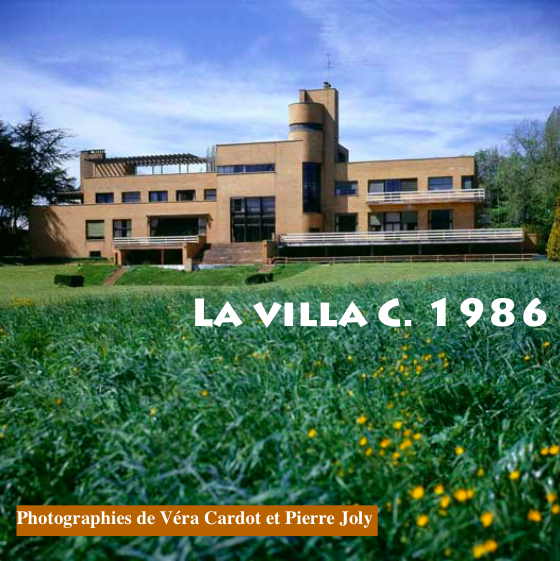 In 1919, he married Lucie Vanoutryve (1891-1985), his brother Jean's widow. 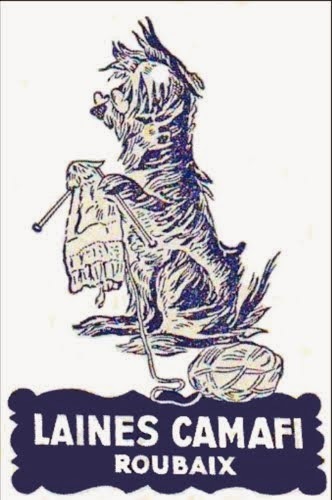 Jean had died during the war in 1915. 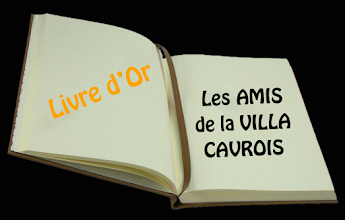 They had four children together, expanding the family which already included three children from Lucie's first marriage to Jean Cavrois. 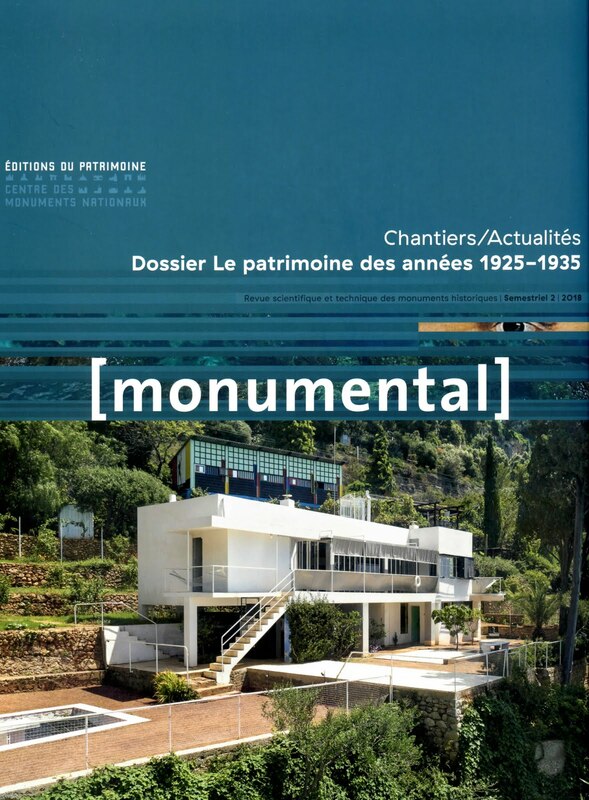 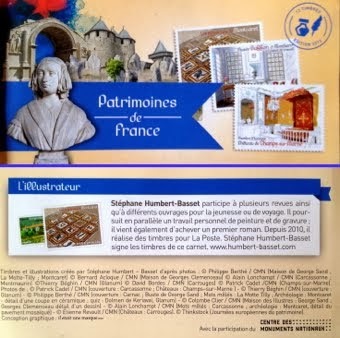 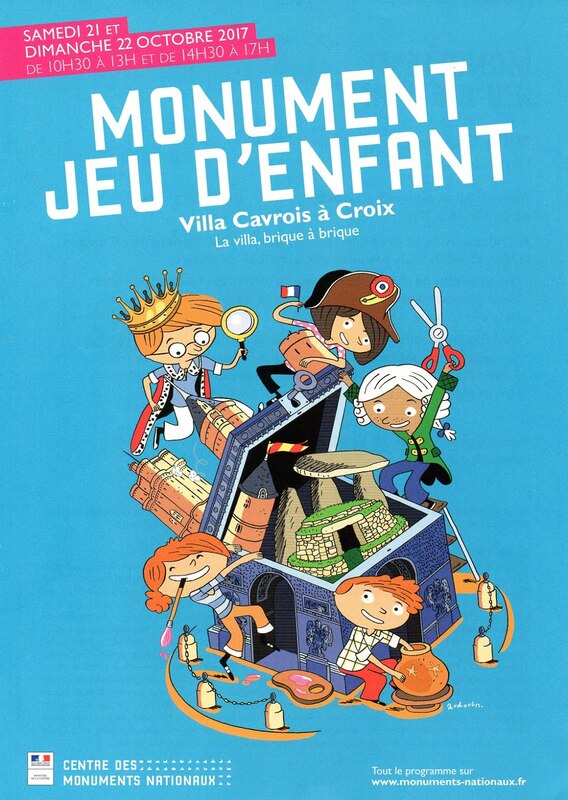 The guide for this monument can be found in the Itinéraires collection and is available in 2 languages in the gift and book shop. 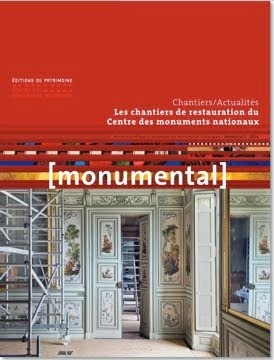 See the site in English of the Center of the National Monuments, by clicking here. 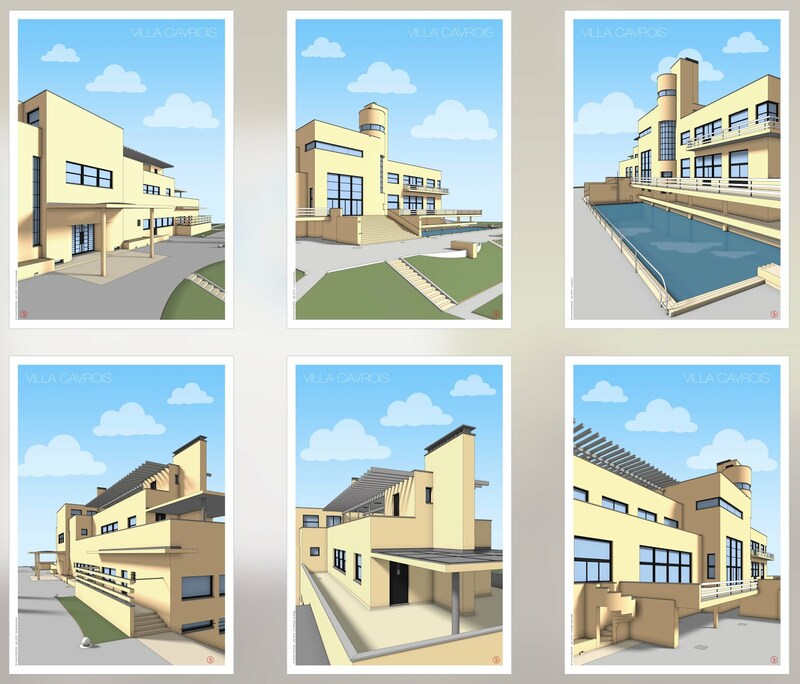 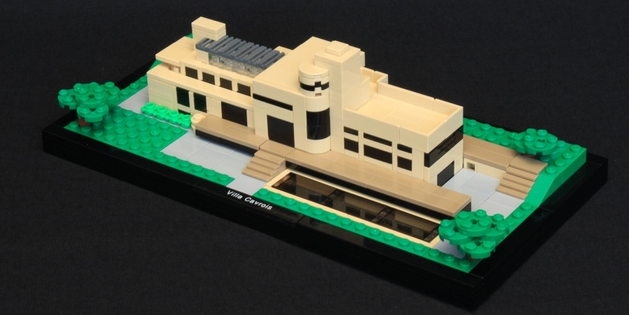 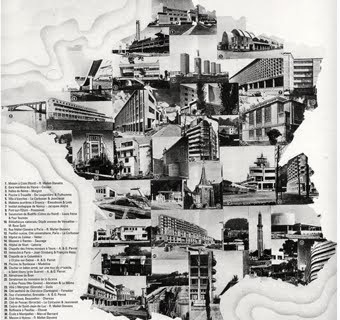 This architectural manifesto is a masterpiece of the Modern Movement. 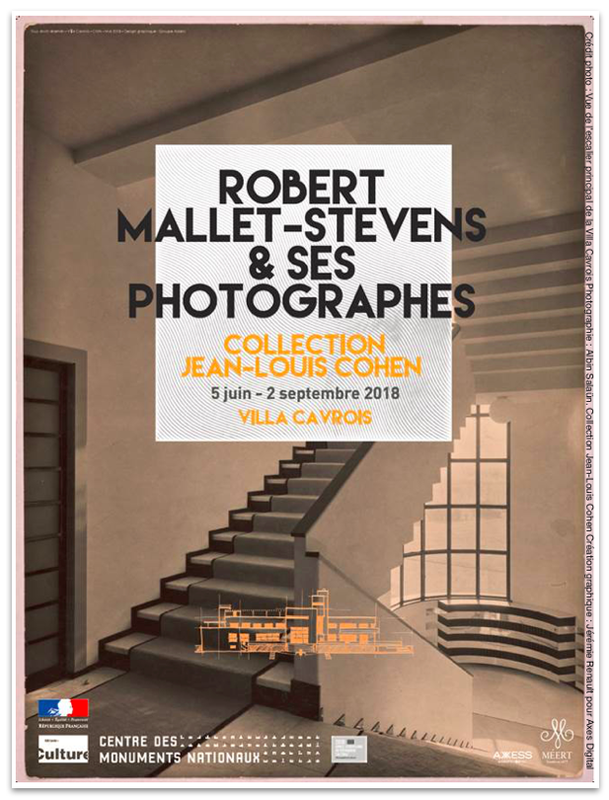 Work of the architect Robert Mallet-Stevens, was made for the textile industrialist Paul Cavrois and his family between 1929-32, who inhabited it until 1987. 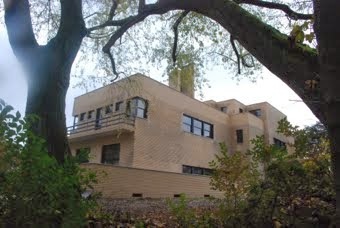 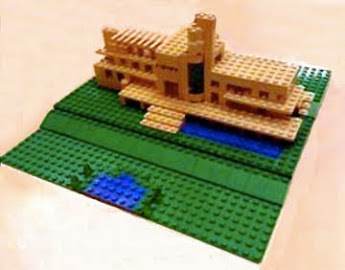 Its unconventional geometric shapes and sand-colored brick cladding made it a unique and modern villa, though unpopular with its more conservative neighbors. 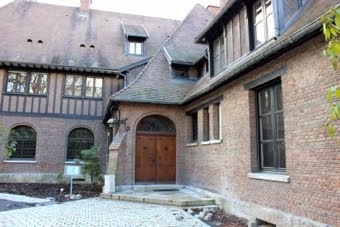 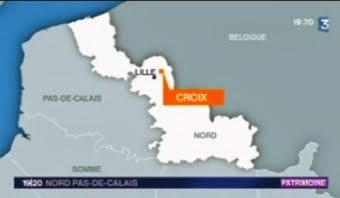 It was inhabited by the family until 1939 because as the German army advanced, they were forced to leave the North of France. 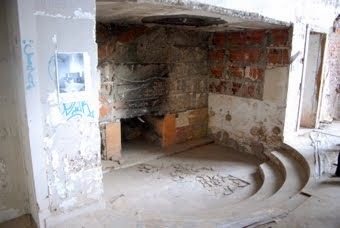 The villa was used as a barracks by the German occupiers during World War II. 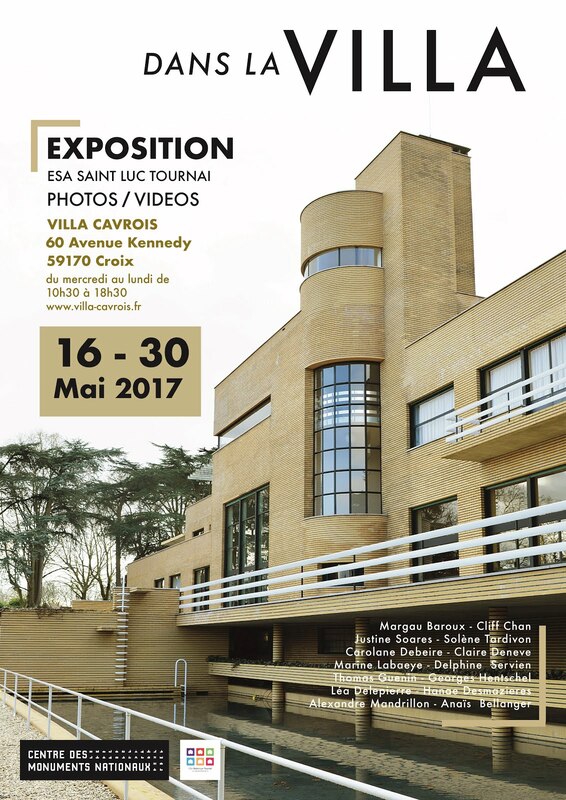 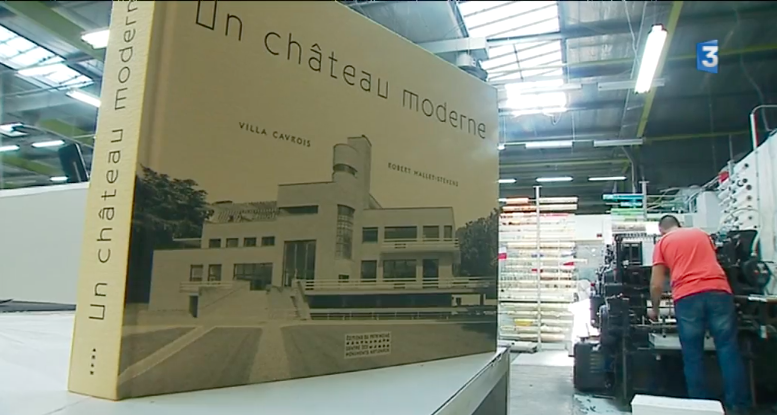 For almost three decades, one of the best examples of French modernist residential architecture was abandoned and in danger of demolition. 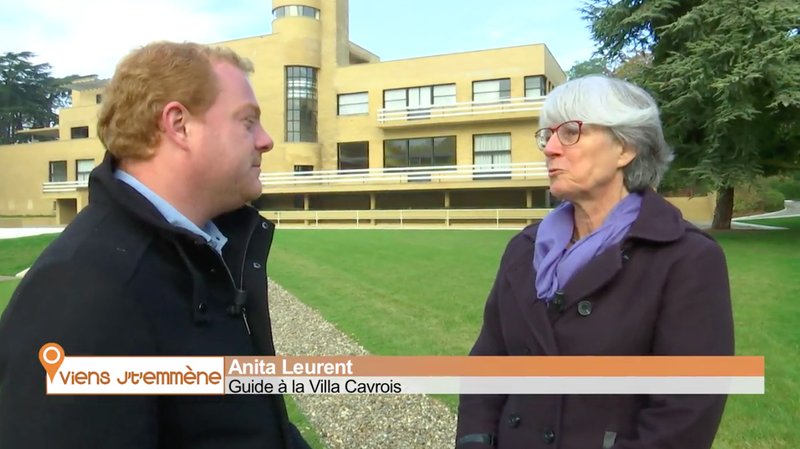 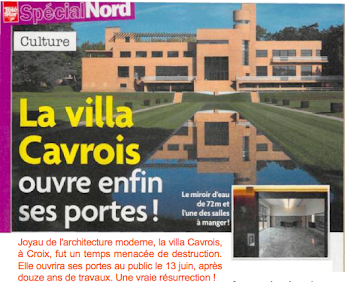 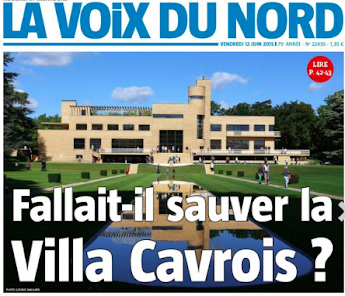 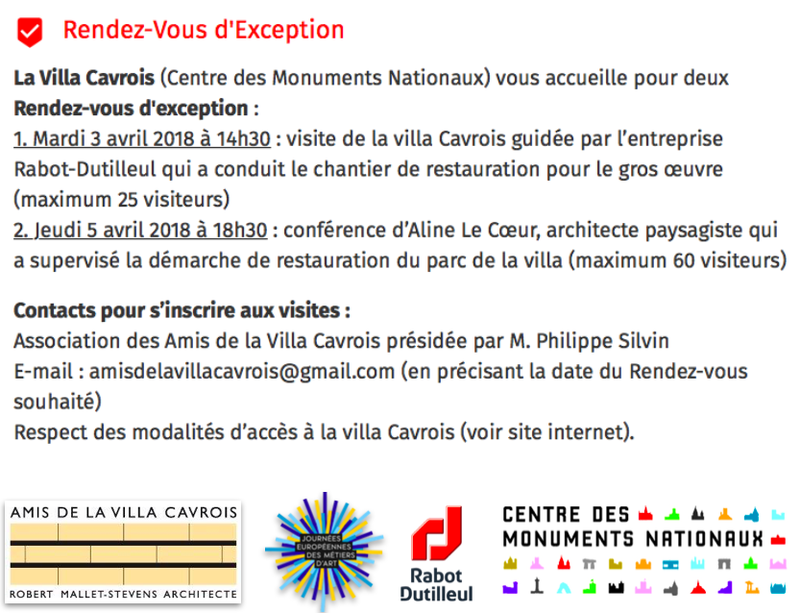 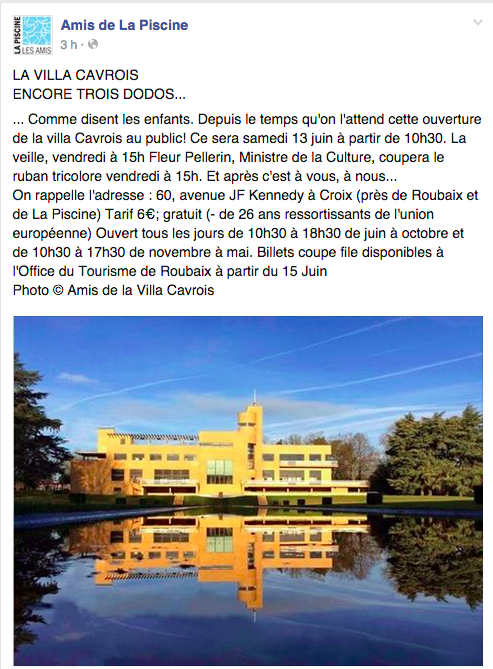 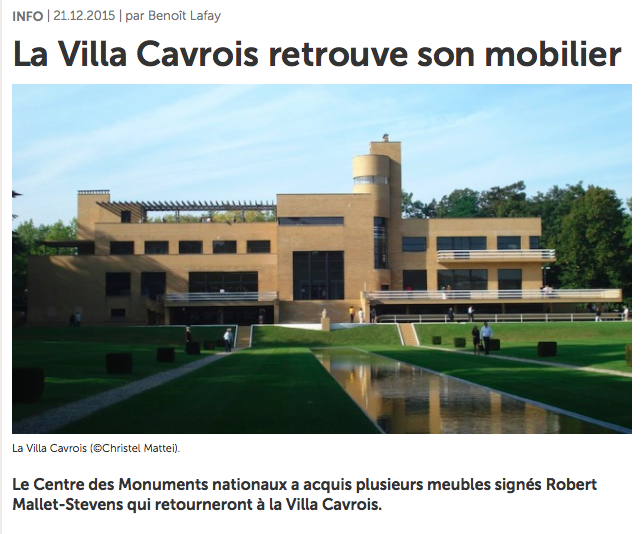 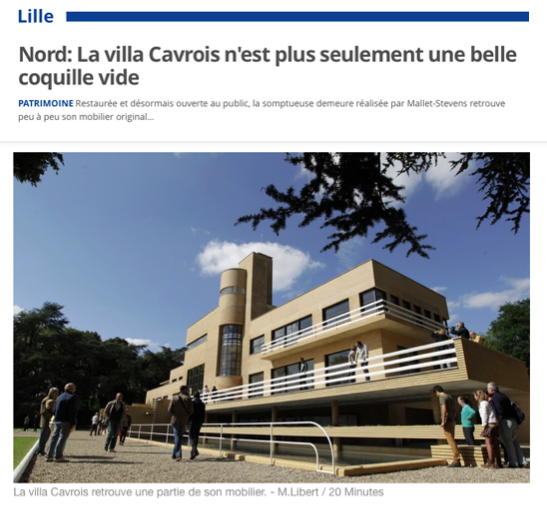 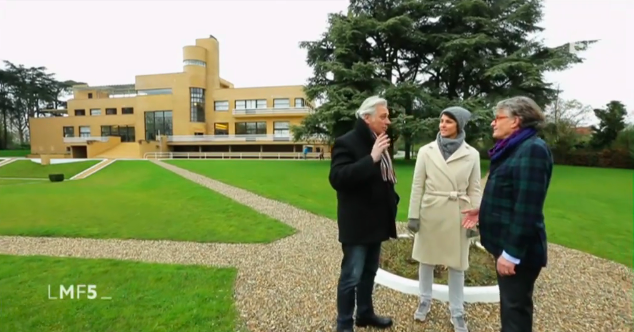 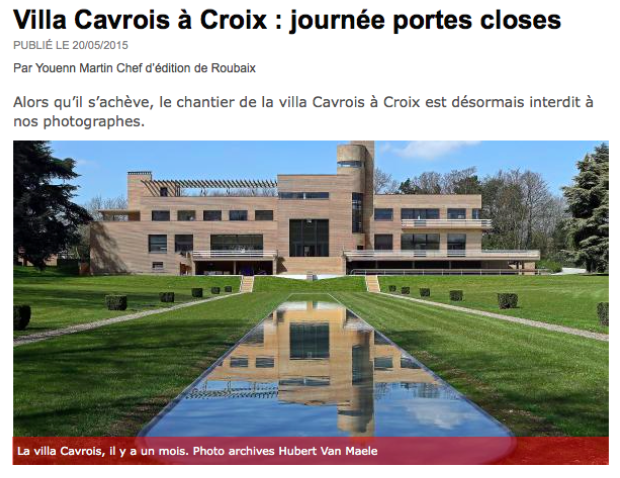 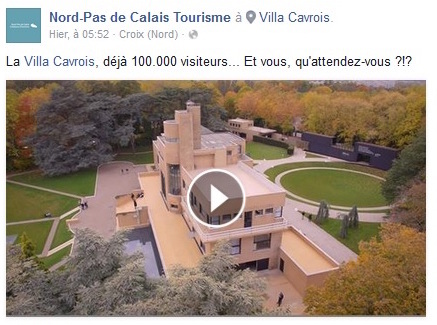 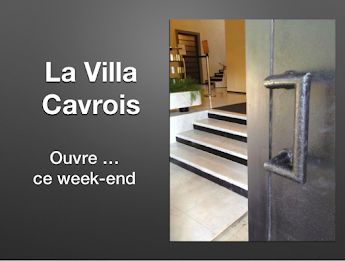 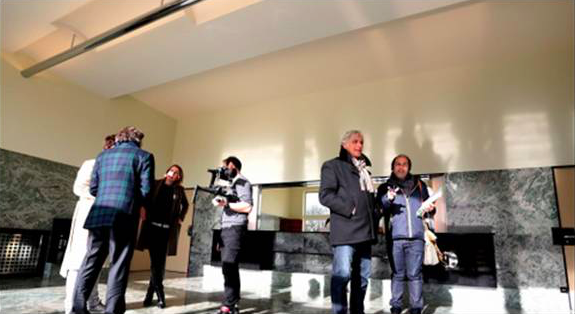 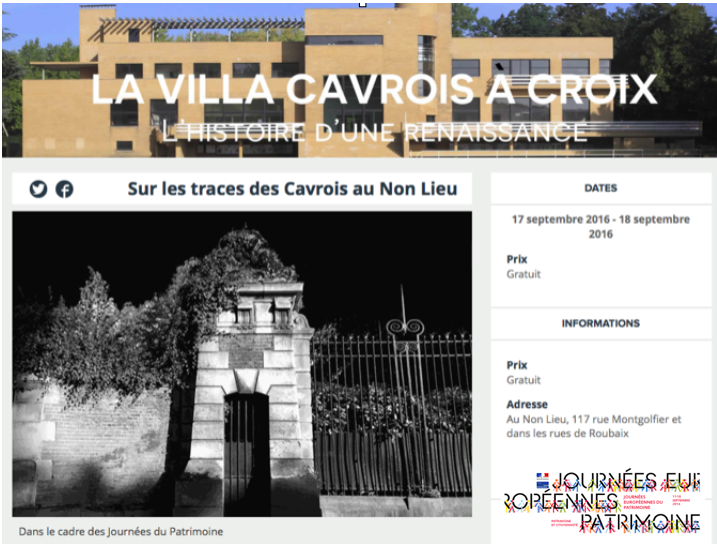 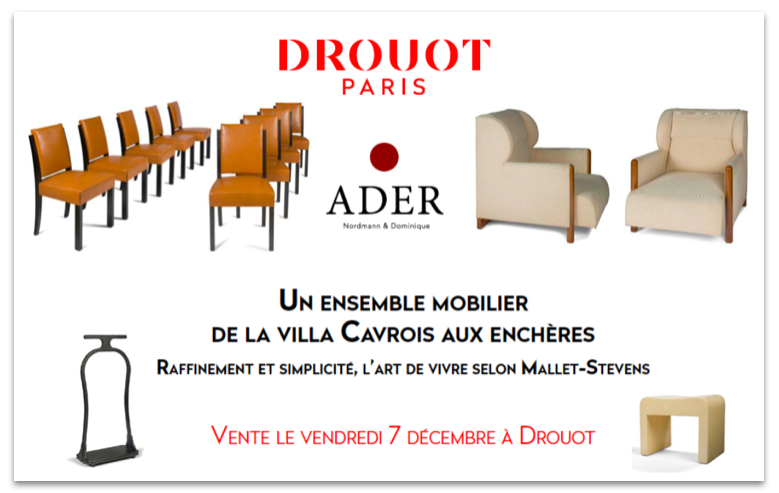 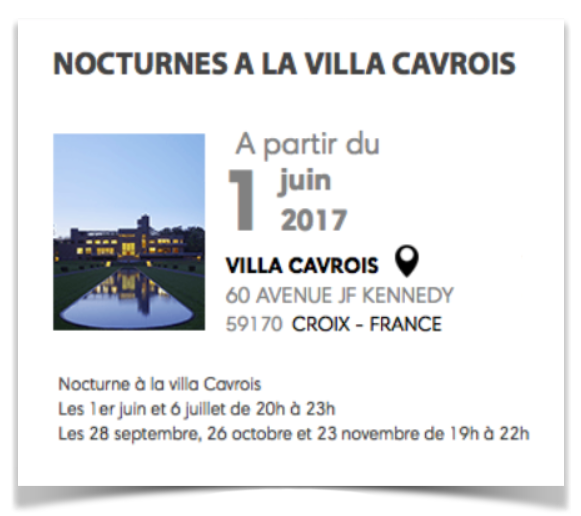 After an act of rescue of 23 million euros, Villa Cavrois reopens its doors. 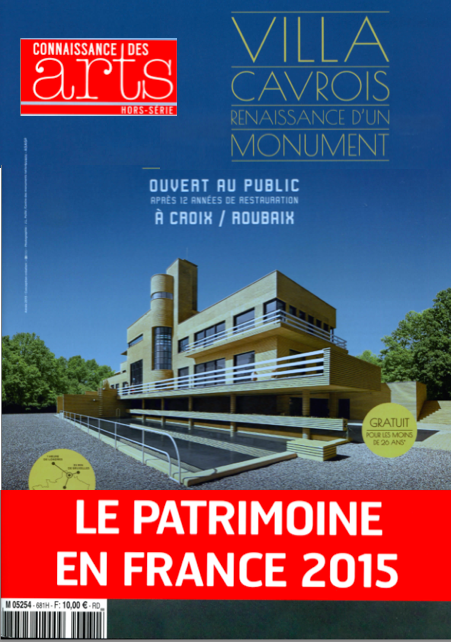 Declared a historical monument in 1990 thanks to the citizen’s mobilization, it was acquired by the State in 2001. 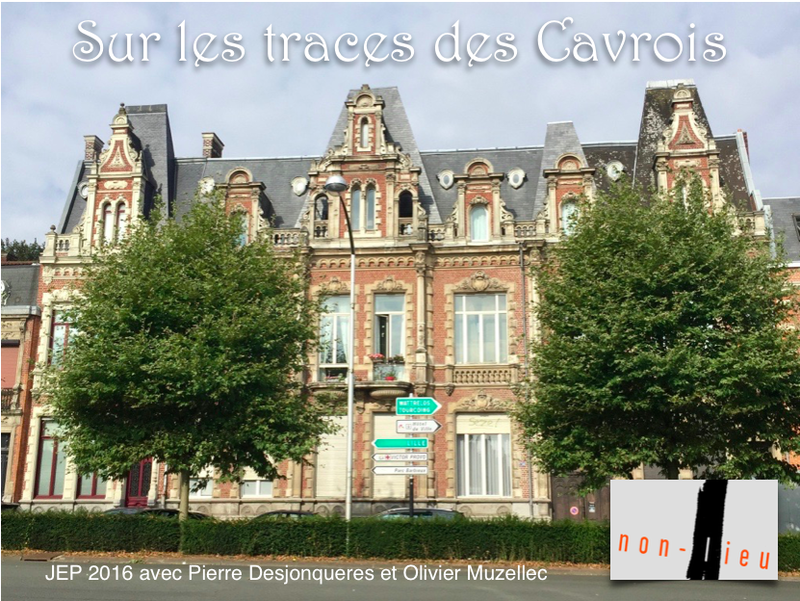 In 2003 it underwent a major restoration by DRAC Nord-Pas-de-Calais and resumed, between 2008-15, by the Center Of National Monuments, under the direction of the architect Michel Goutal. 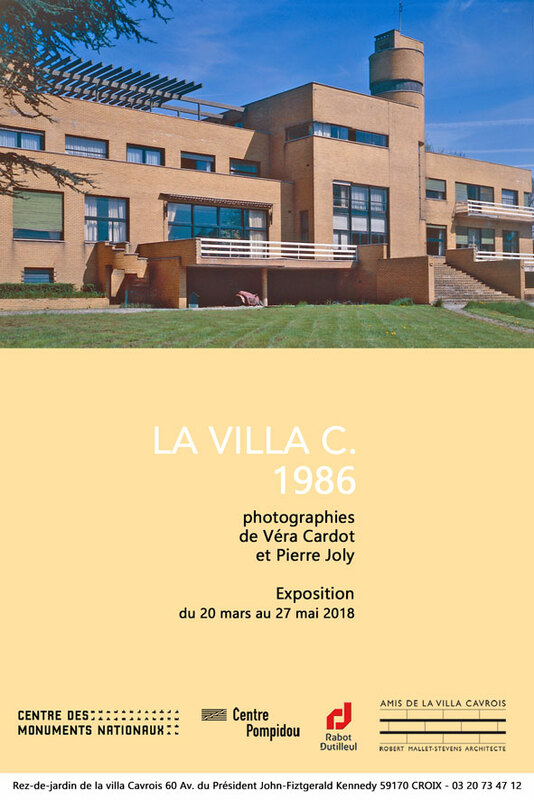 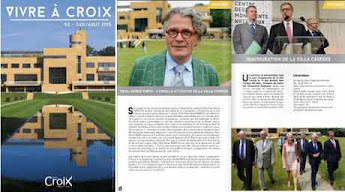 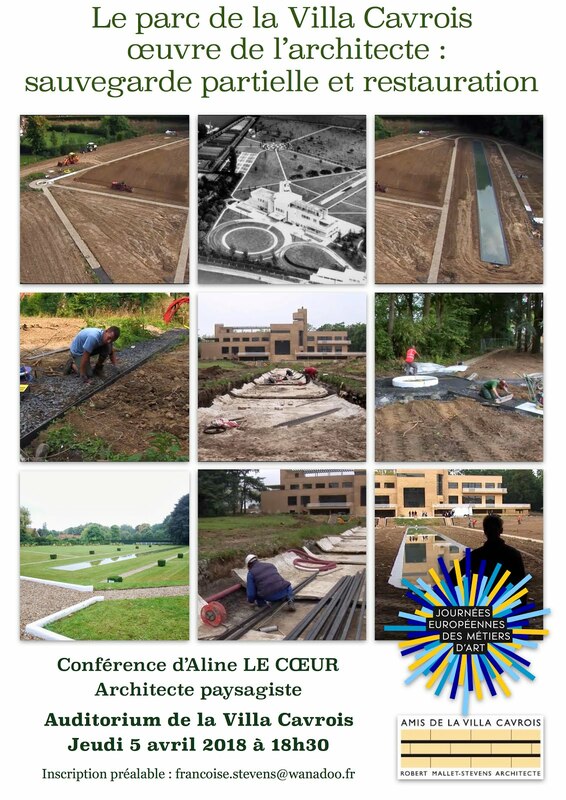 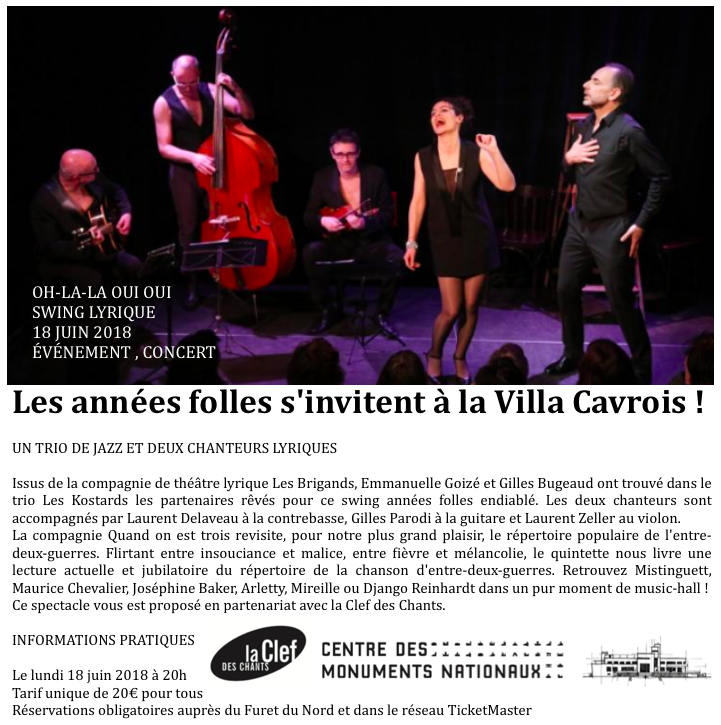 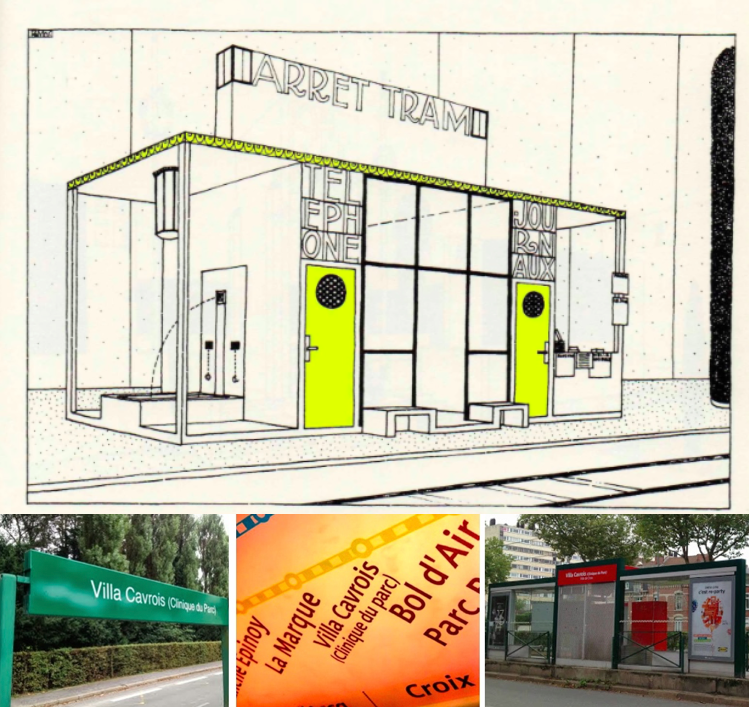 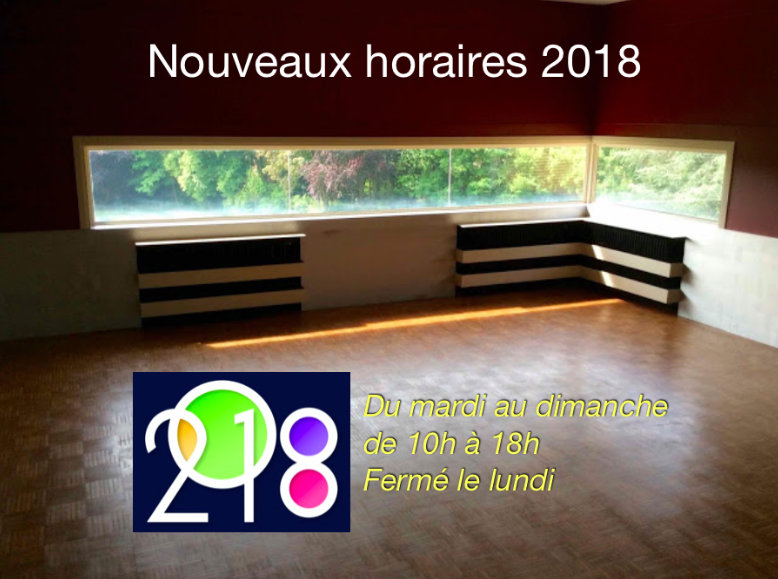 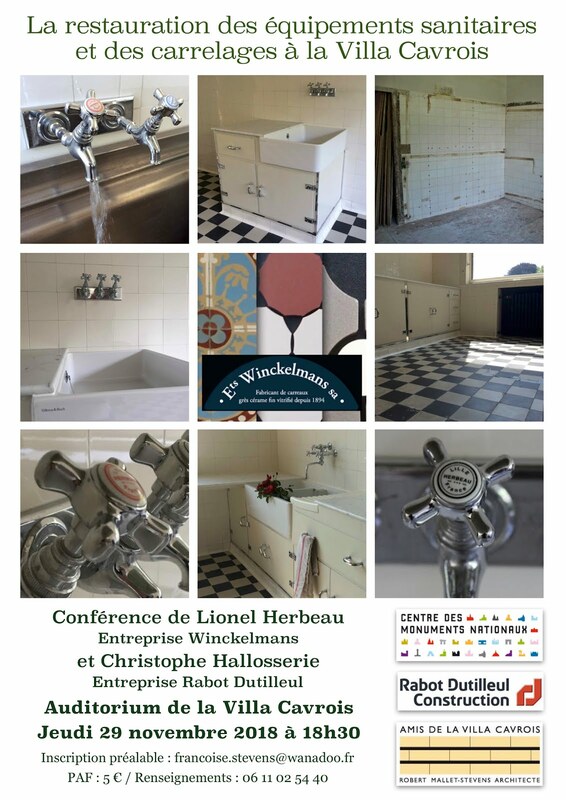 The villa is located in Croix, 60 rue John Fitzgerald Kennedy, canton of Roubaix West, in the north of France, Lille, in the region of North-Calais, near the park Barbieux, in the plain of Beaumont. 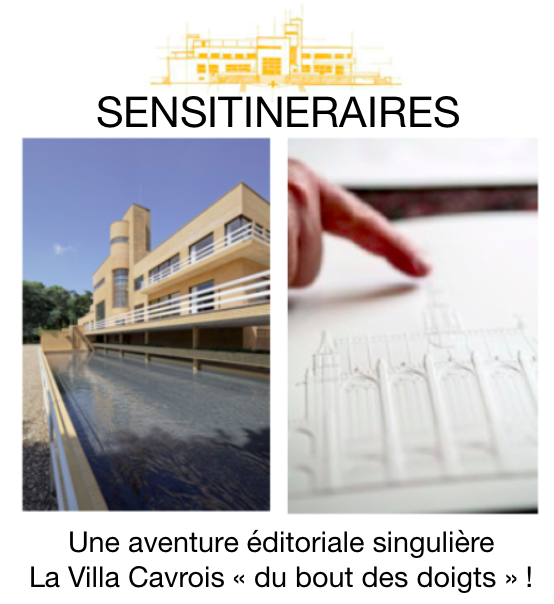 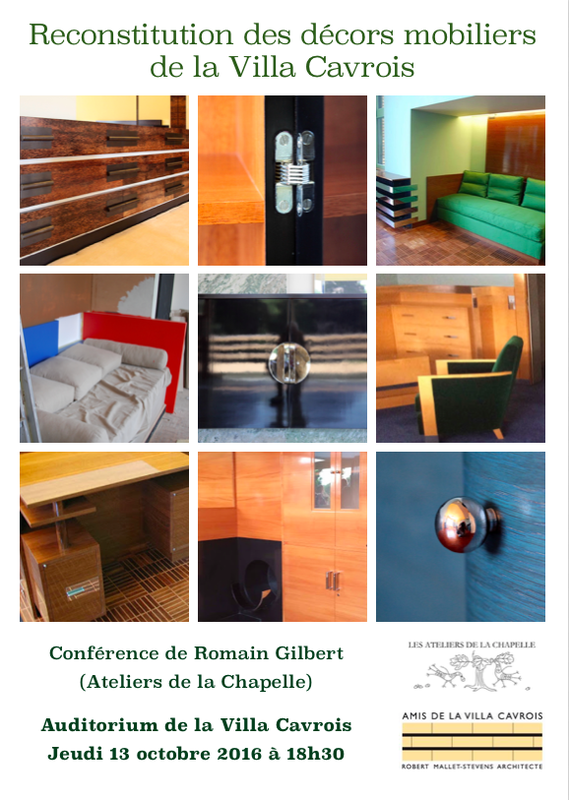 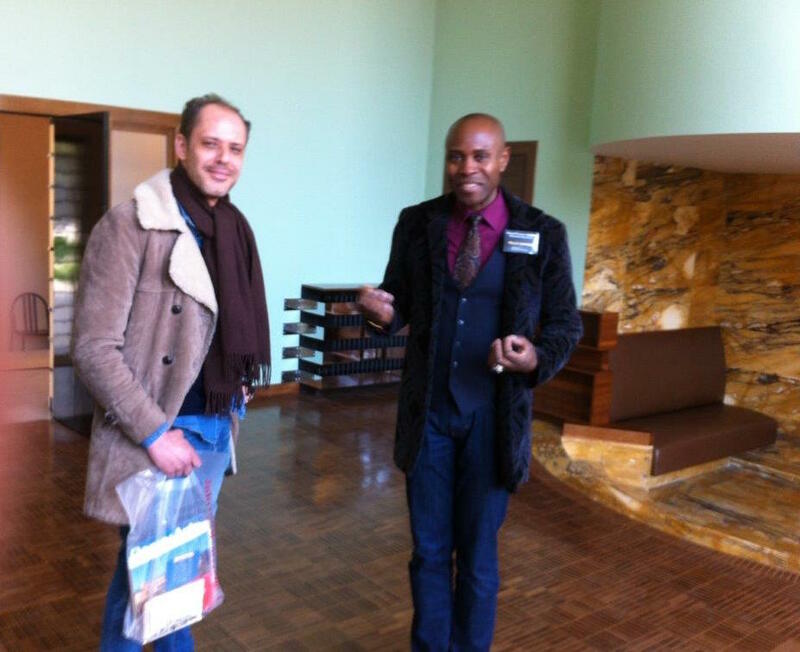 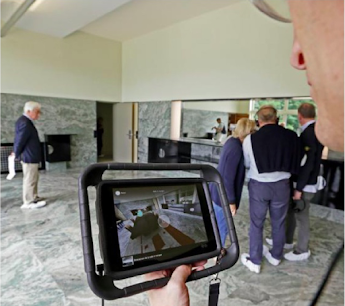 According to Paul-Hervé Parsy, property manager, “… the villa is influenced by the modernity of Adolf Loos and Josef Hoffman …” although spatial organization is also based on The conception of the eighteenth century. 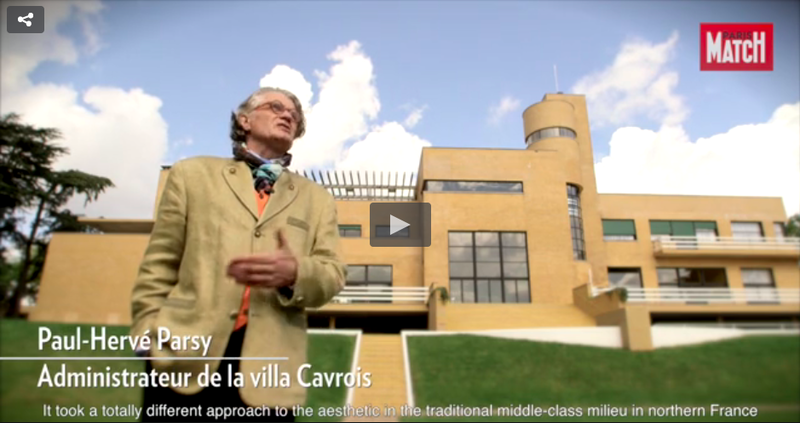 This contradiction between modernity and classicism makes this unique and modern castle an exceptional example of “masterpiece”. The building’s geometric shapes and sand-colored brick cladding resulted in an uncompromising modern character that was unpopular at that time among its conservative neighbors. 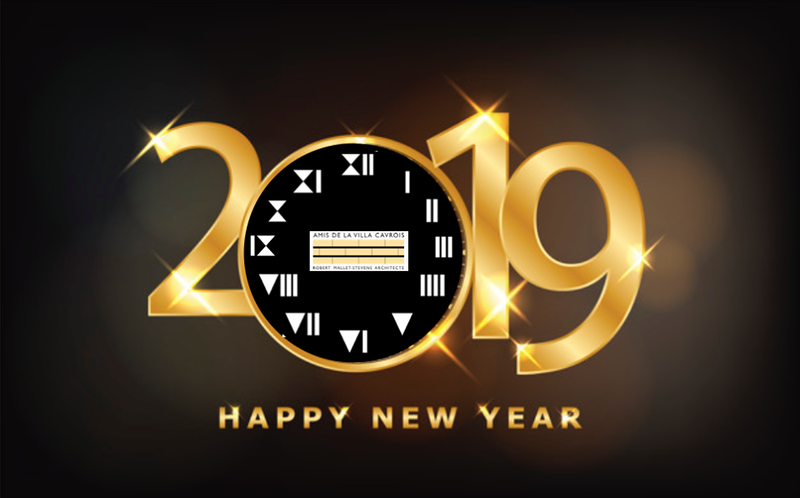 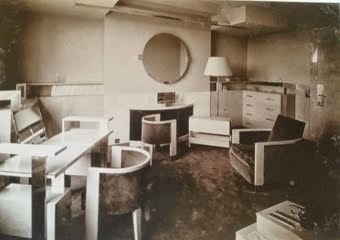 The rooms were arranged according to their function and equipped with the latest technologies, including telephones, electric clocks, central heating and elevators, making it the epitome of modern luxury living. 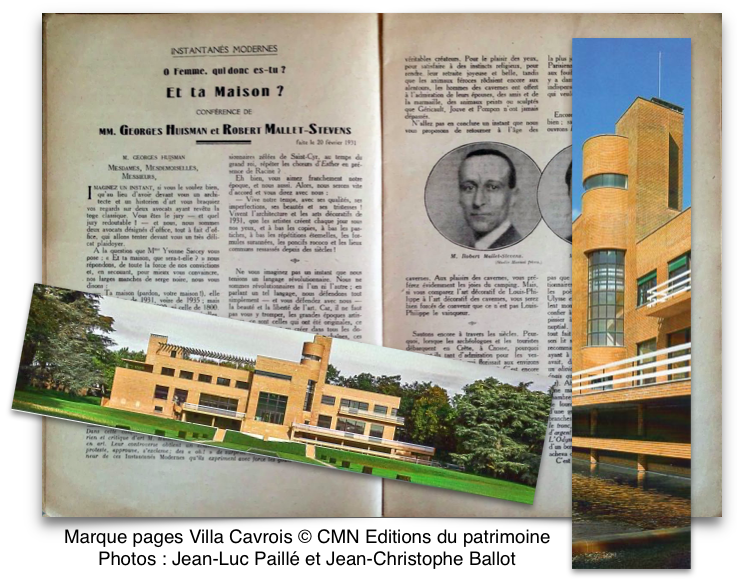 At first Paul Cavrois had commissioned a local architect, Jacques Greber, to build his house following the style of the region. 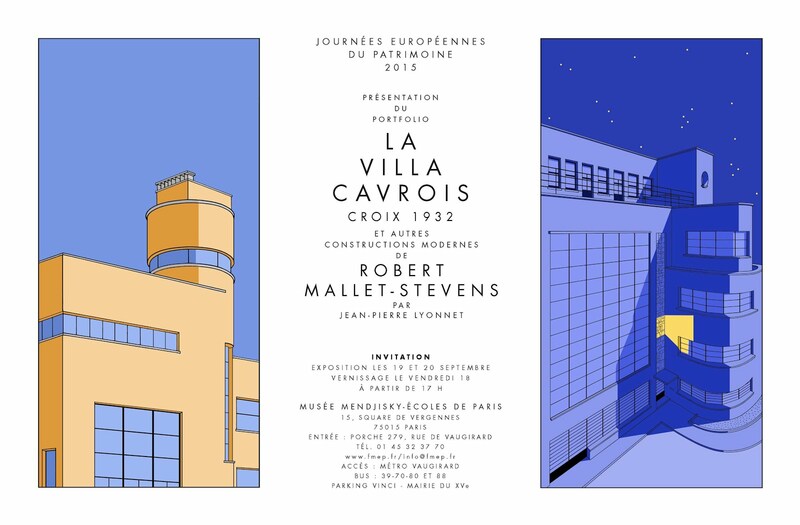 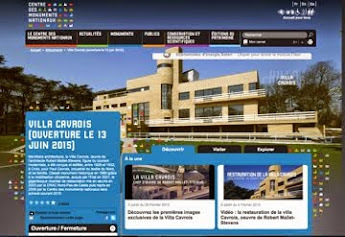 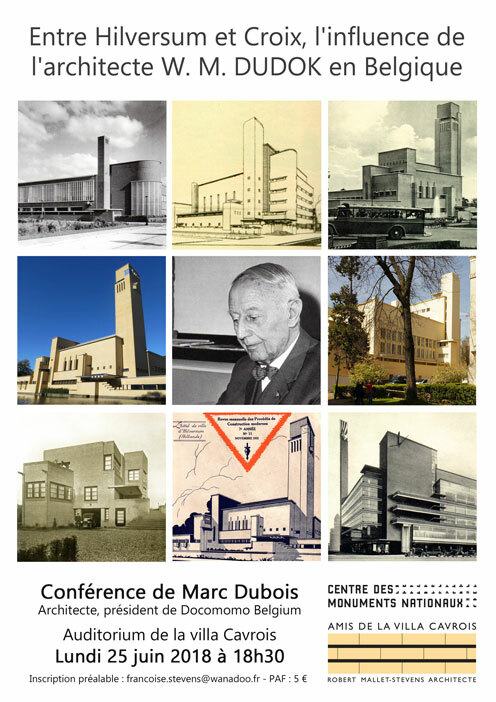 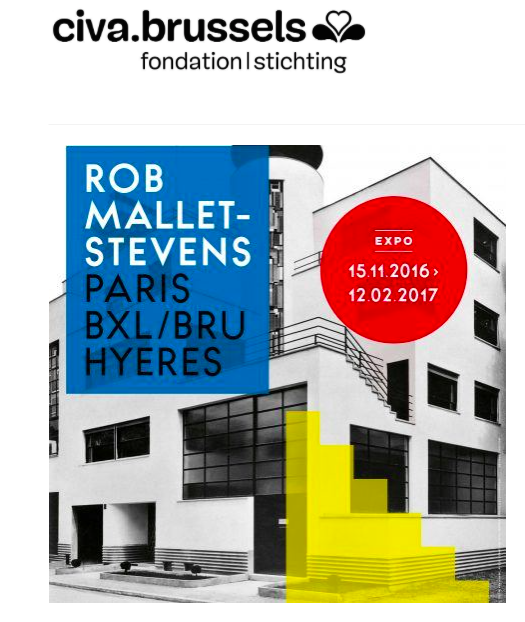 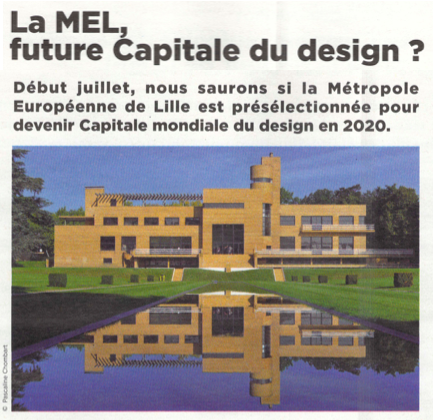 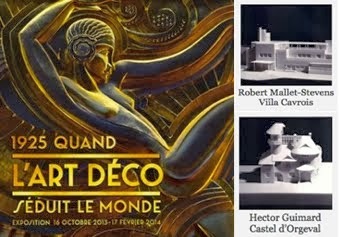 But in 1925 he met the Cubist proposals that Robert Mallet-Stevens, a friend of Le Corbusier, Pierre Chareau and others in love with the International Style and the Dutch movement De Stijl, who presented at the Exhibition of Decorative Art of Paris and in 1929 decided to commission him the project. 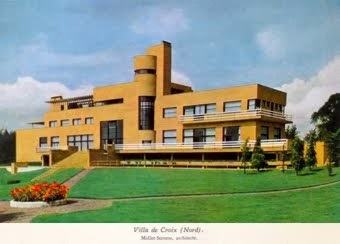 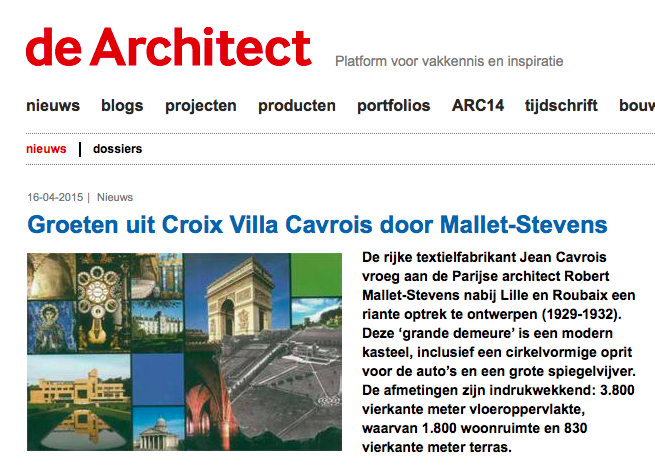 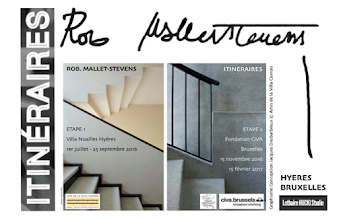 Cavrois previously traveled with Mallet-Stevens to Brussels where he discovered the Stoclet Palace designed by Joseph Hoffman and Hilversum in Hollandto examine the Town Hall, designed by Wilem Marinus Dudok, serving this trip as an important source of inspiration for the future villa. The design of the villa was thought to reflect Paul Cavrois’ vision of how family life would be organized, how people could be characterized as living in it, how they would move around the building, and how all this could be reflected in a Decoration for your daily life. 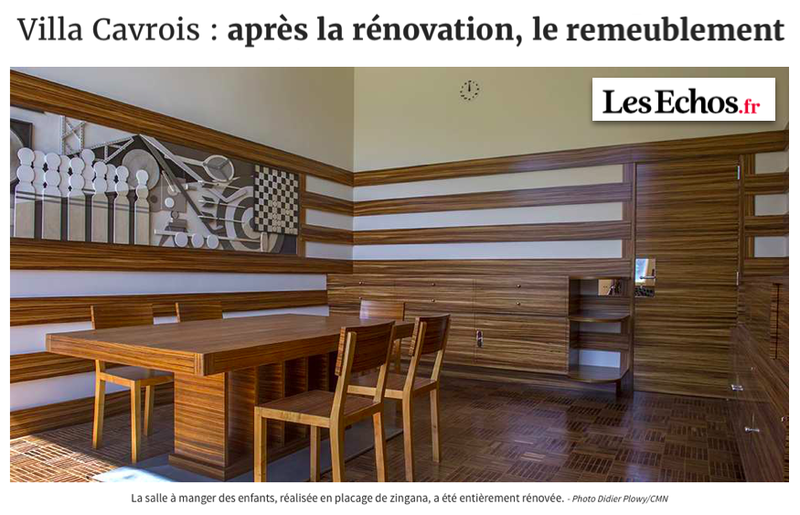 Cavrois wanted a clear distinction between the separate areas of the house, especially between the parents’ and the children’s areas. 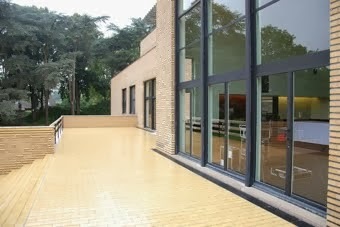 Organized around the large entrance lobby the east wing is the parent domain, the west wing of the children and the house staff. 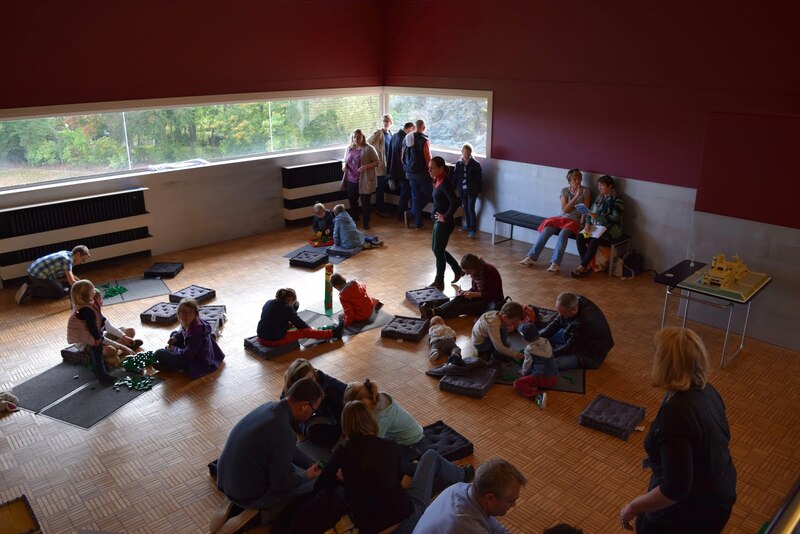 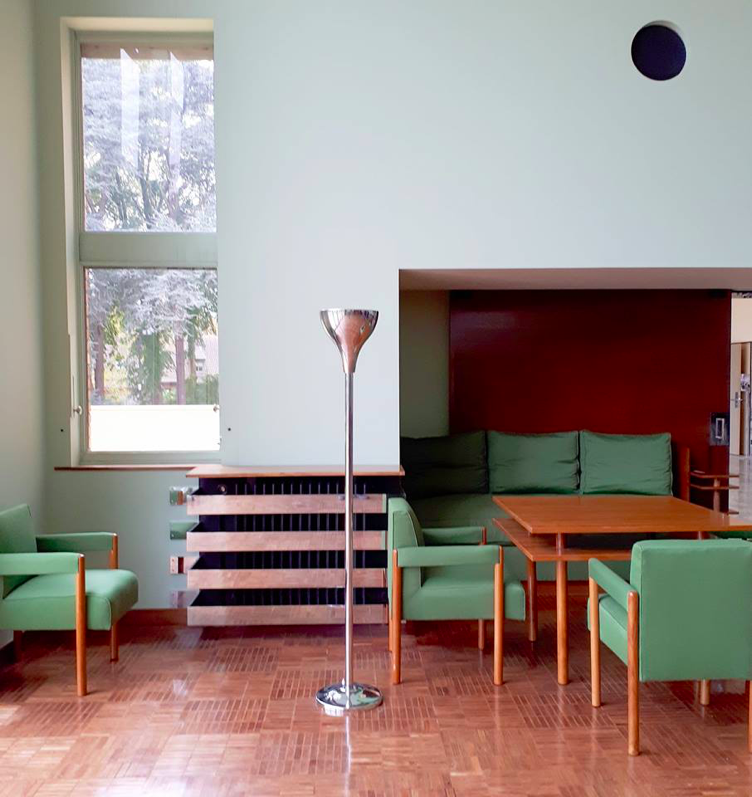 It also gives access to the main rooms where the whole family meets, the living room, the main dining room and a smaller dining room for the children, related to the garden by an outside staircase. 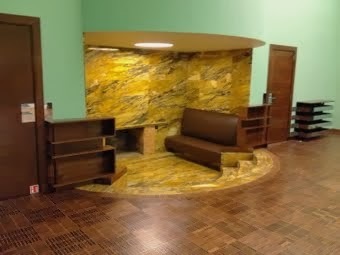 The choice of materials and furnishings echoed this hierarchy of space. 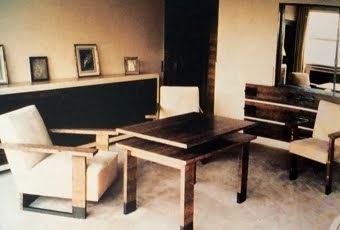 Simplicity and functionality prevailed in furniture throughout the house, with the luxury that is only expressed in the richness of the materials used. 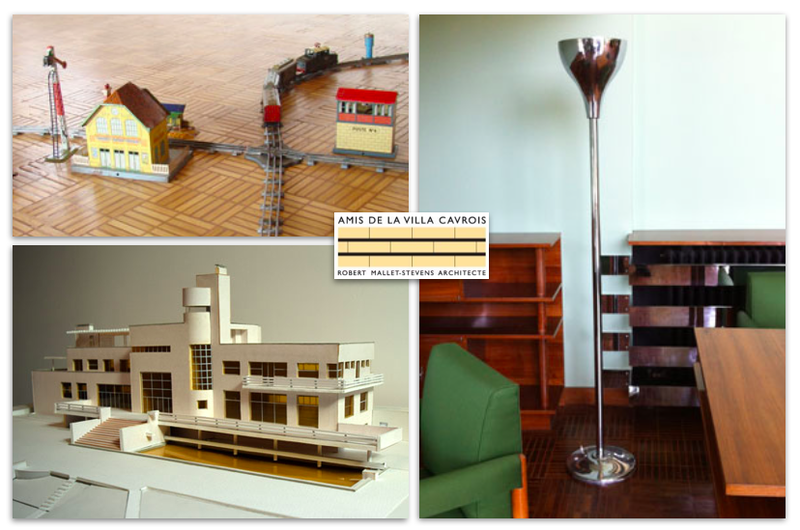 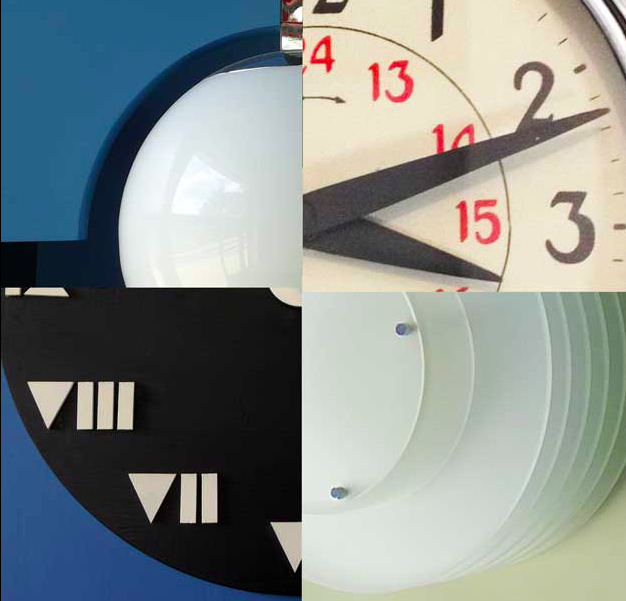 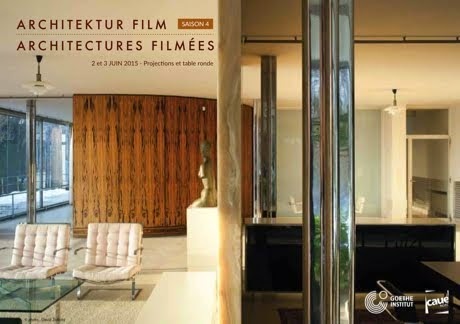 Within the modern movement, it is a singular example of the relationship between architecture and decoration. 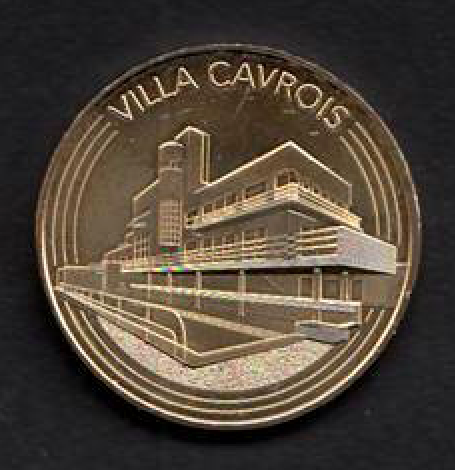 The modernity of Villa Cavrois was expressed through the simplicity of volumes, the yellow saffron of the brick cladding, the thin metal of the frames of the openings, the architectural masses organized to articulate the vertical and horizontal planes, the set of stepped terraces And the presence of windows in the corner. 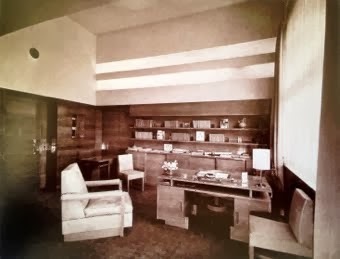 In designing the villa, Mallet-Stevens did not limit himself to the arrangement of architectural volumes, he also designed all the interior furniture up to the smallest piece of furniture. 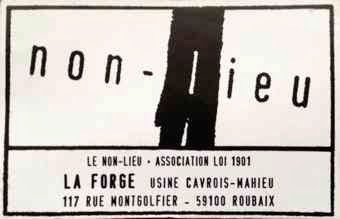 In this, he brought to the limit the concept of “complete work” he defended in the Union of Modern Artists. 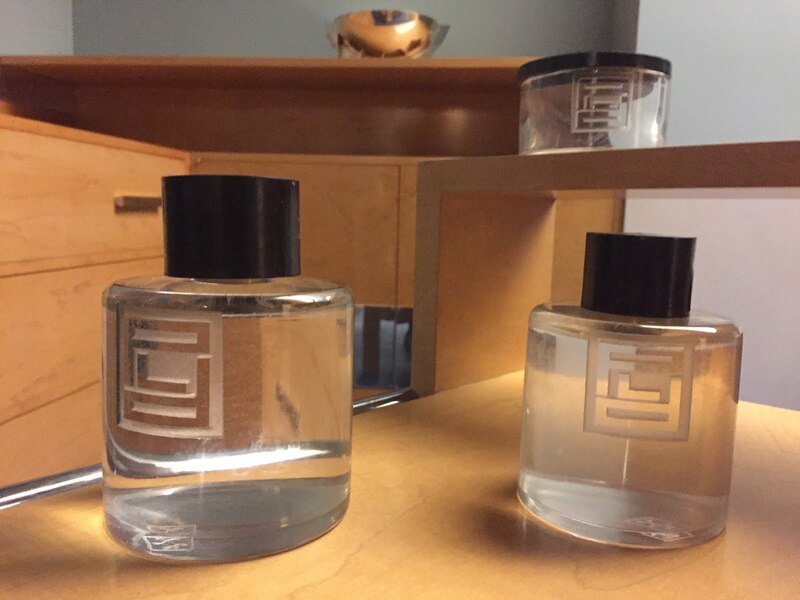 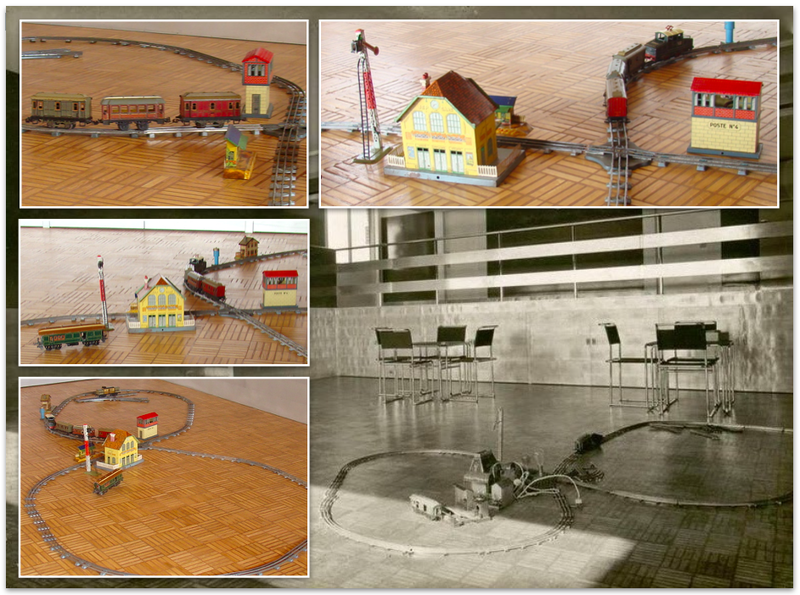 This complete work owes much to his experience as a film designer. 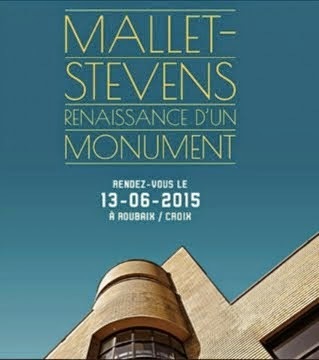 In the ceremonial spaces, Mallet-Stevens opts for luxury materials, implemented with care, refinement and simplicity, marble and noble woods, but without ostentation. 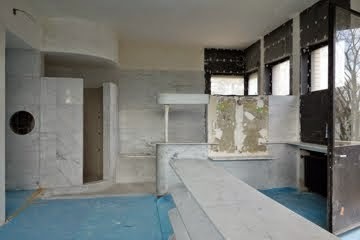 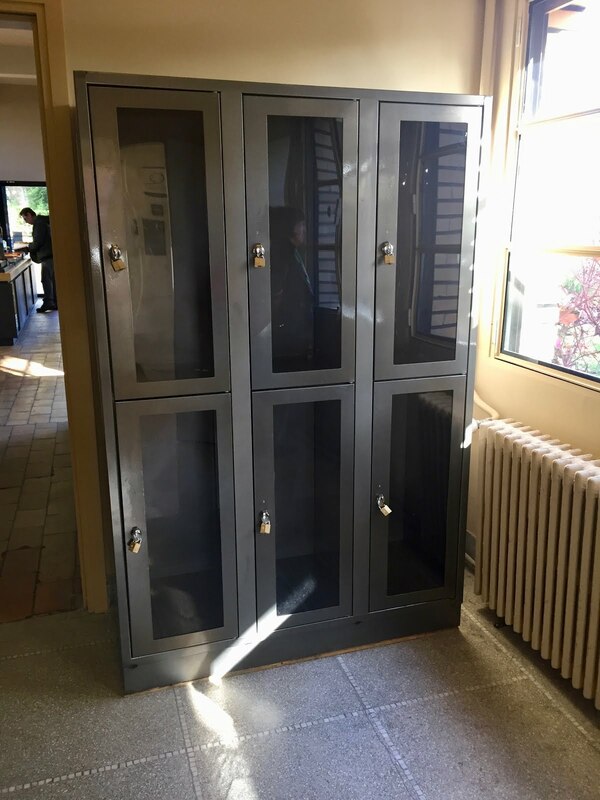 In the service areas, such as cooking, laundry and bathrooms Mallet-Stevens emphasizes hygiene and functionality, also providing them with large windows, something new at that time. 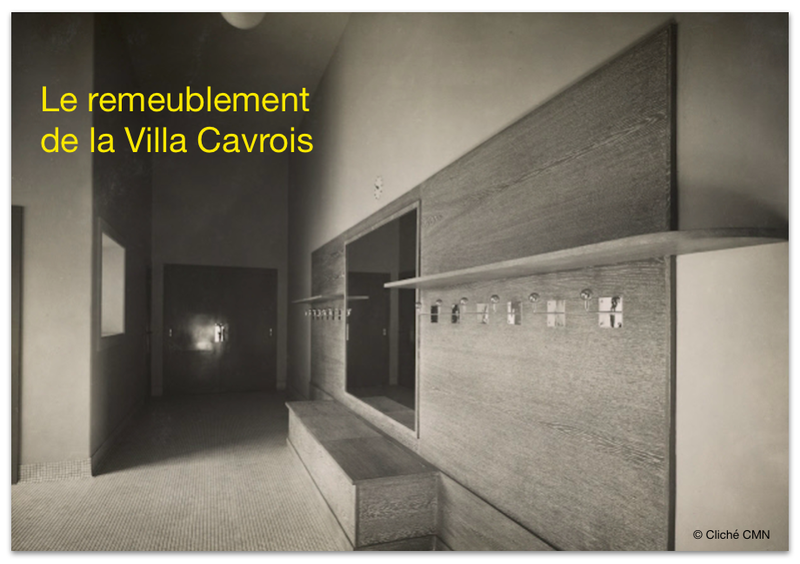 The interiors of Villa Cavrois have similarities to those he designed a few years earlier for the films of Marcel L’Herbier. 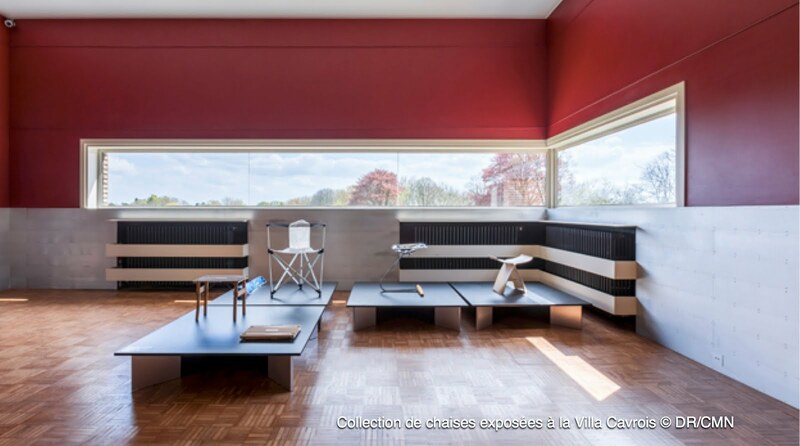 According to the architect, the decoration of the home and a living environment should reflect the psychology of those who inhabit it, in this case a bourgeois family. 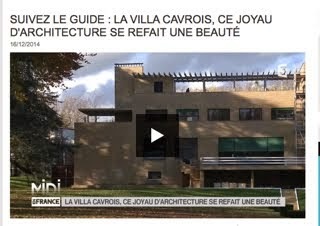 Villa Cavrois is a horizontal shape that is cut in the middle with both a semi-cylindrical vertical pivot and its triple glazing, and as an underlying system the design of several spaces. 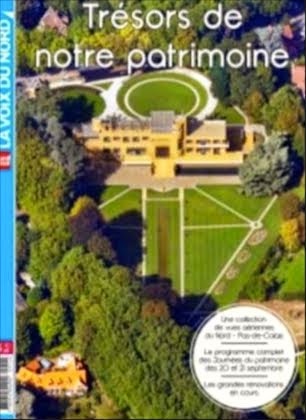 Its proportions are imposing and arranged according to the principles of the castles of the seventeenth century, symmetrically along axes. 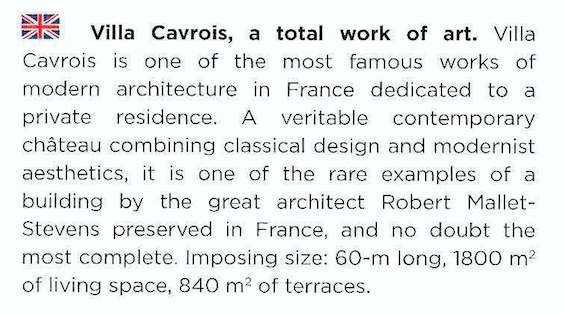 The construction has approximately 60m long and 3,800m² of floors, 1,800m² for living spaces and 830m² of terraces. 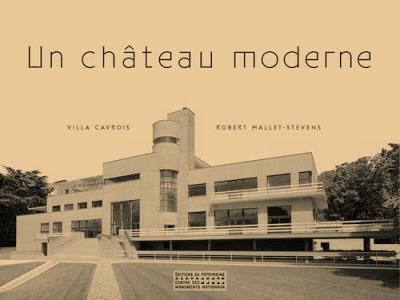 The aesthetic of the villa designed by Mallet-Stevens is modern, however, its flat belongs to the tradition of the chateau. 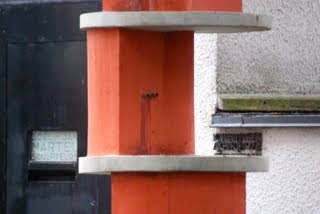 The distribution between the two symmetrical wings locates the stays of parents on one side and those of children and domestic on the other. 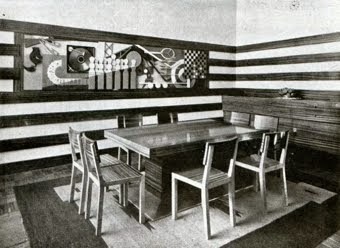 The dining room of the parents communicates with the hall-lounge by a sliding door and enjoys a large window overlooking the park. 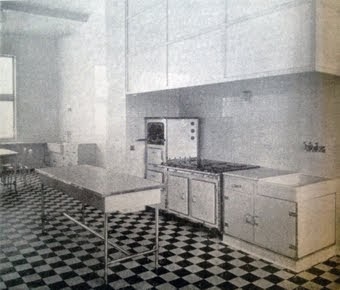 While all the rooms in the villa benefit from advanced technologies, cordless telephones, lift or central heating, this modernity culminates in the kitchen, which has a refrigerator, gas stove, electric dumbwaiter (dumbwaiter) and three entrances Of water: one for cold water, one for hot water and a third for decalcified water. 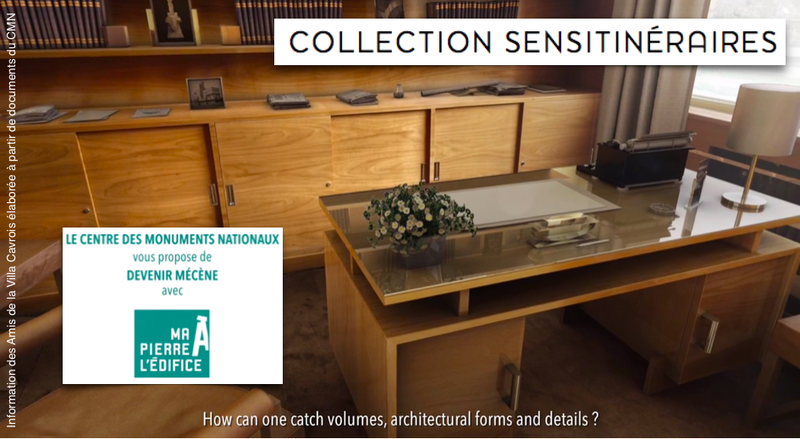 The disproportionate extractor hood illustrates the importance of home equipment in a modern mansion designed by Mallet-Stevens. 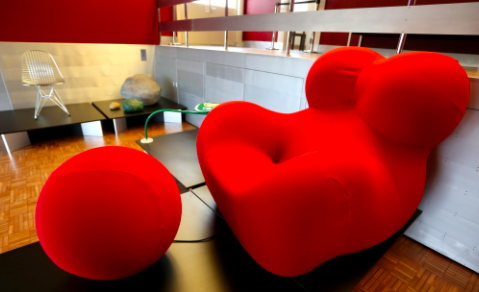 The space is designed to optimize each movement. 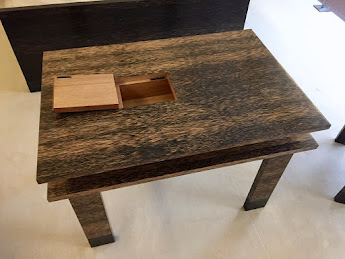 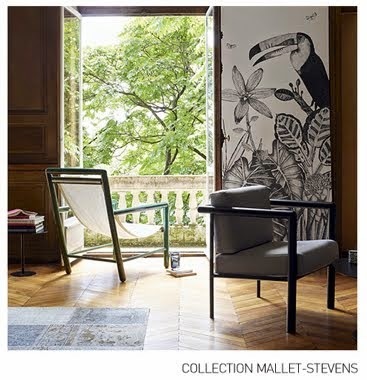 The furniture designed by Mallet-Stevens meets this requirement. 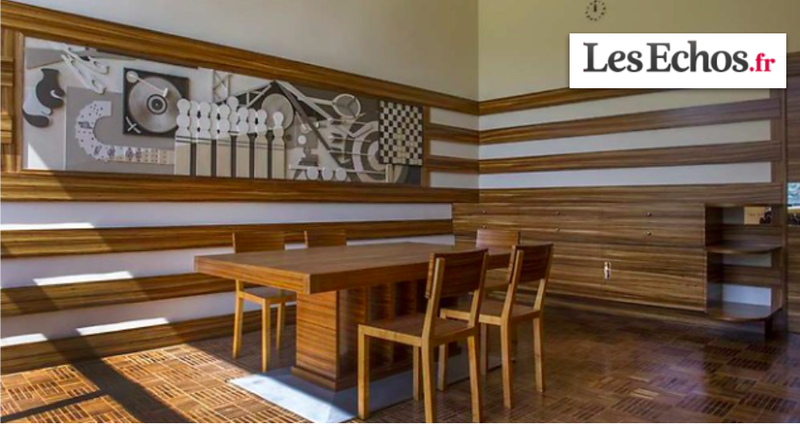 In the pantry, curved cabinets follow the shape of the wall. 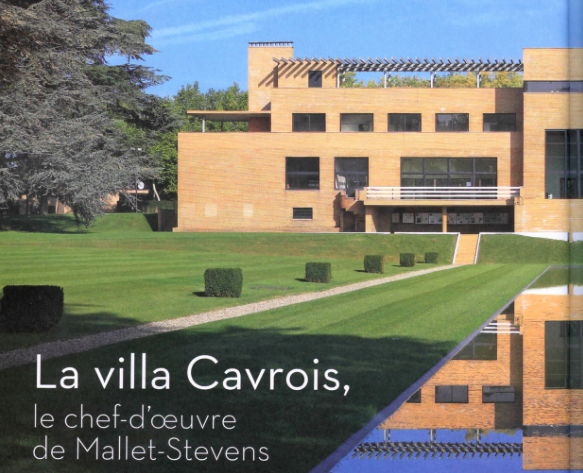 The villa Cavrois has two facades of imposing dimensions. 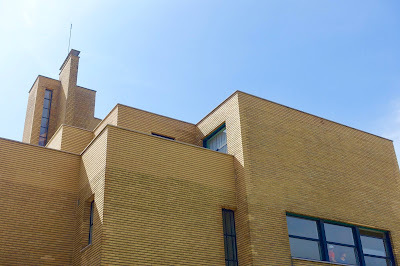 The austere northern facade evokes the silhouette of a ship. 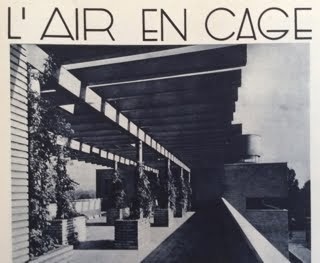 To the south, the façade facing the garden functions like a theater curtain, rising up along the terrace. 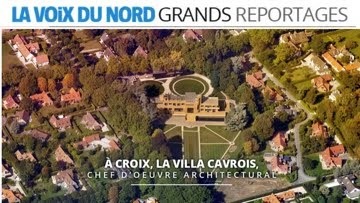 The details of both the villa and the gardens are developed with a meticulously controlled design in terms of proportions, with a defined “regulatory form”. 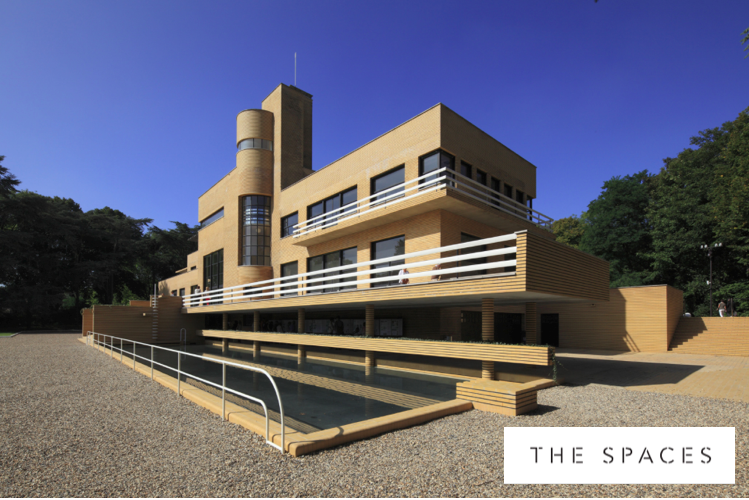 The size of an external yellow brick was taken as the reference unit for the dimensions of the villa, width, height and depth. 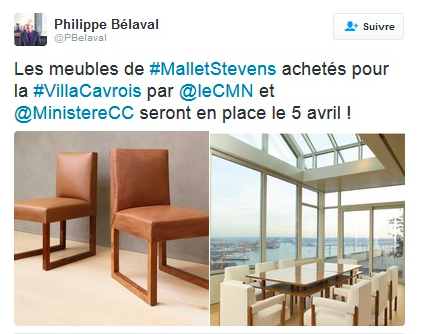 In the ceremonial spaces, Mallet-Stevens opts for luxury materials, implemented with care, refinement and simplicity, marble and noble woods, but without ostentation. 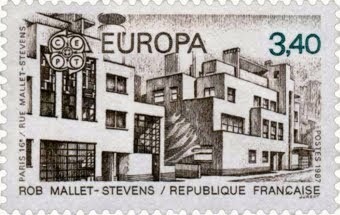 In the service areas, such as cooking, laundry and bathrooms Mallet-Stevens emphasizes hygiene and functionality, also providing them with large windows, something new at that time. 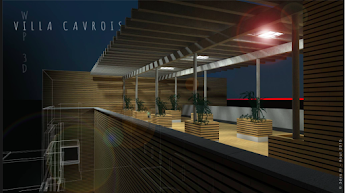 The stepped terraces accent the facades and highlight the horizontal lines of the volumes. 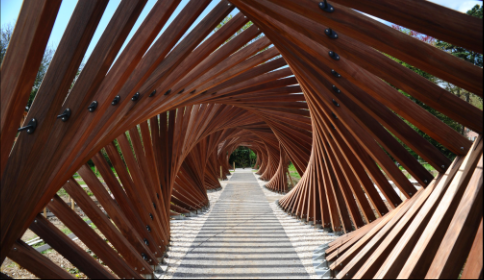 With their white railings evoke the decks of a boat and create viewpoints towards the park and its surroundings. On the upper floor, the pergola serves more as a decorative element than for sun protection. 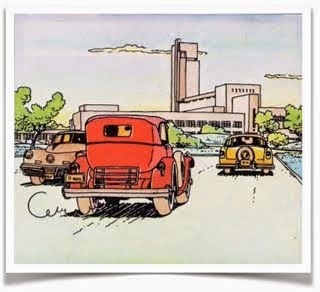 On sunny days, its shadow projected on the walls emphasizes the large volumes of the town. 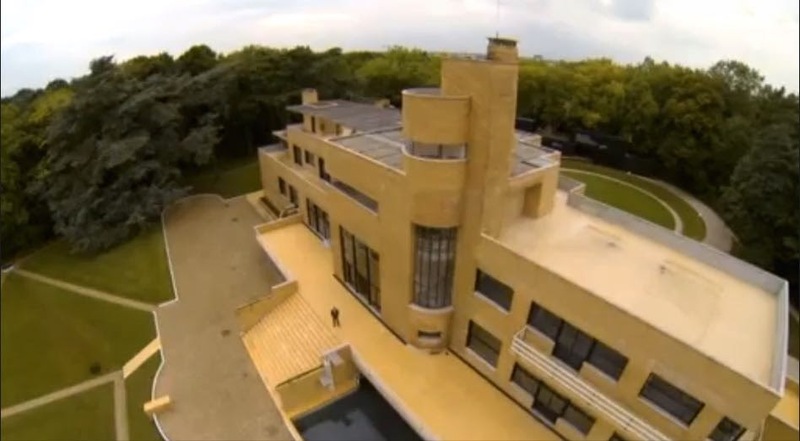 The central tower houses the smoking room, the Staircase of Honor and on the top floor, a belvedere that offers a dominant view of the surroundings. 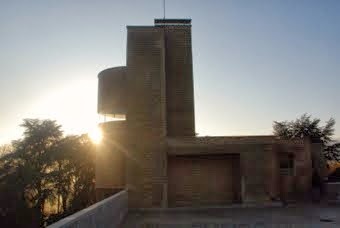 This mirador with medieval evocation and an allusion to the control towers of the airport, is a signal in the flat landscape. 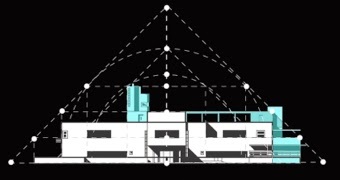 The silhouette of the tower provides a vertical counterpoint to the horizontal volumes of the architecture. 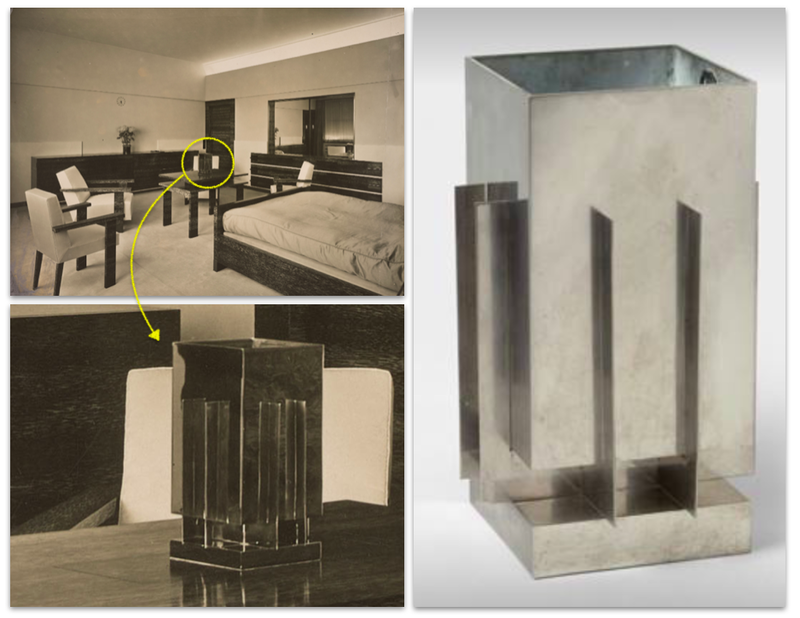 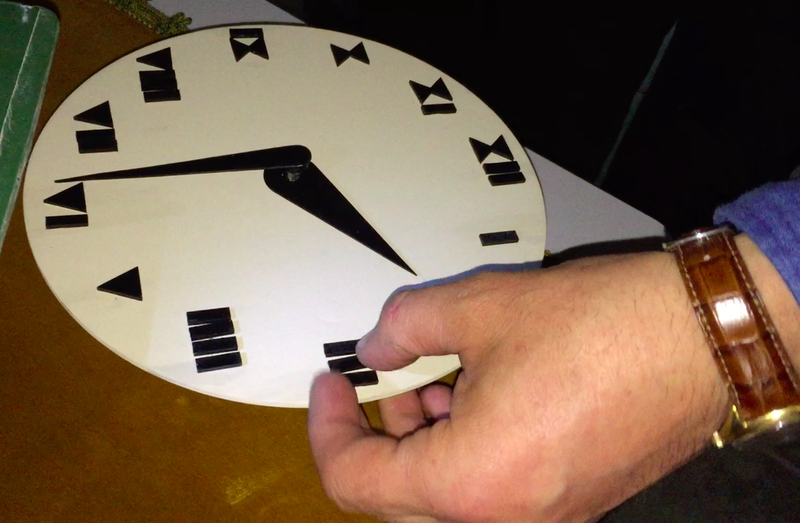 This element echoes the Belvedere of Villa Poiret and the clock tower in the tourist pavilion that Mallet-Stevens designed for the 1925 exhibition. 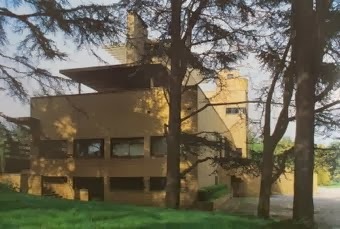 The park surrounding the villa was also designed by Mallet-Stevens. 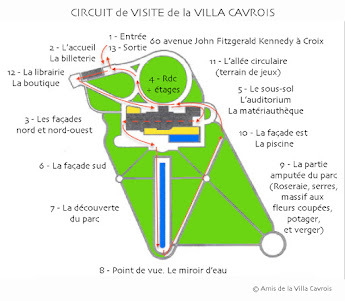 Heir to the formal gardens of the seventeenth century, the park offers, with its narrow streets and its mirror of water, an extension of the lines and dimensions of the villa. 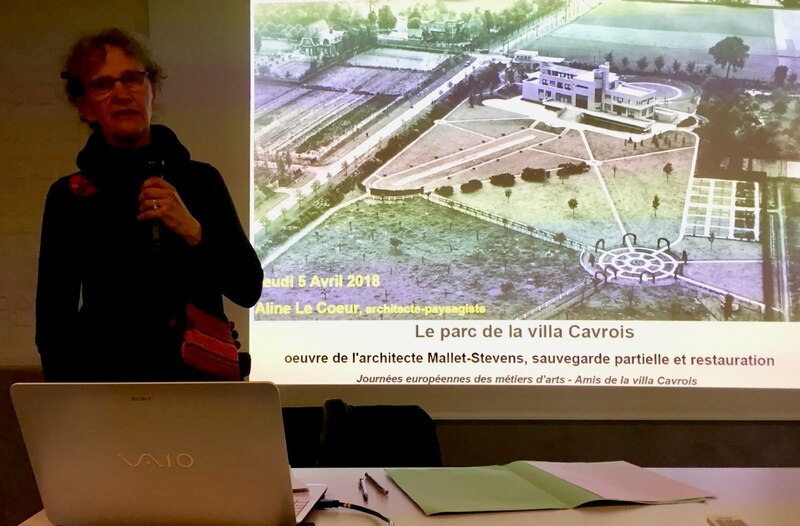 Originally it extended more than 5 hectares, but as a result of the subdivision that was realized in 1990 has been reduced to a little less of the half. 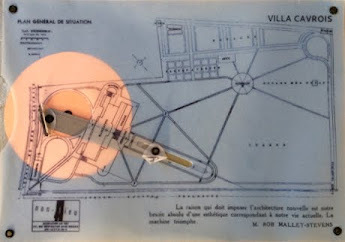 With the restoration has recovered the central space and the mirror of water, true equilibrium point of the park. 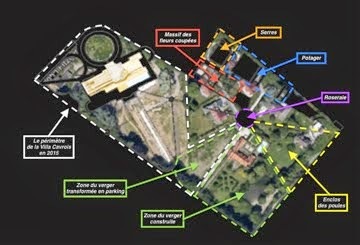 This pond with 72m long is an extension of the great hall and the circular entrance to the north. 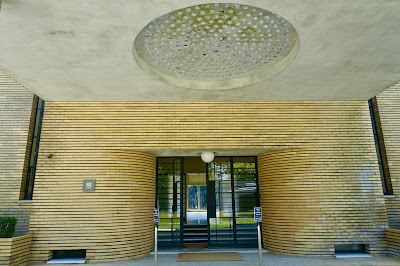 This circular entrance was designed to facilitate the circulation of motor vehicles when they came to leave the guests in the villa. 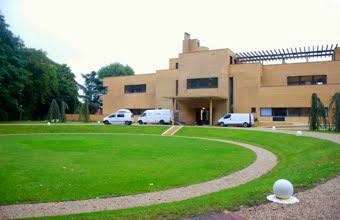 Visitors leave the car under the porch and the driver continues on the circular driveway to turn. 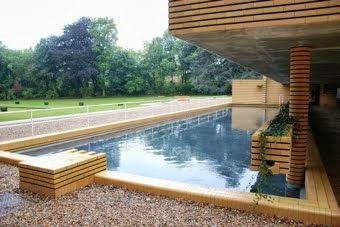 The swimming pool with 27 meters in length, marks the modernity of the property. 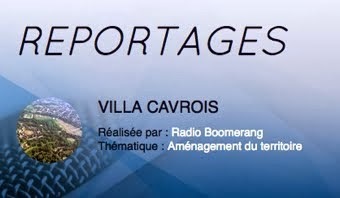 It responds to a concern for hygiene, health and sport that characterizes the program of the town. 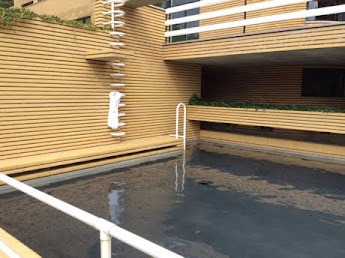 The proximity of the boiler, adjacent to the pond, keeps the water at a pleasant temperature. 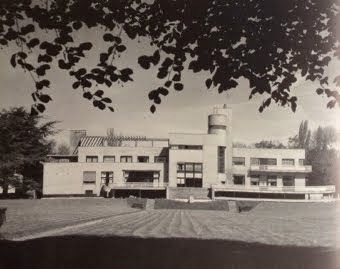 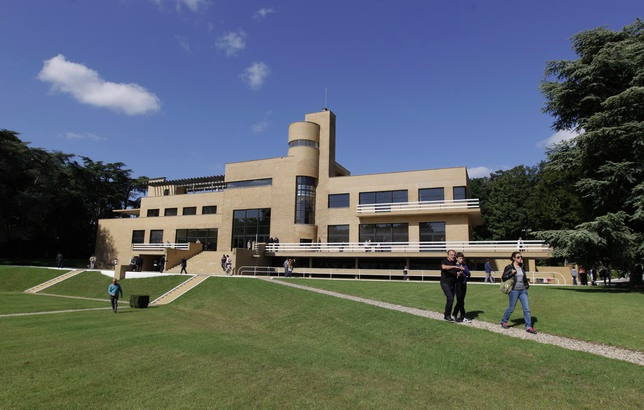 In 1930, Mallet-Stevens and Paul Cavrois visited the Hilversum Town Hall in the Netherlands, whose yellow brick lining was modern at the time. 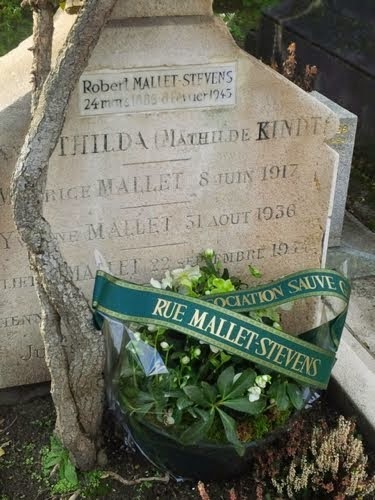 Mallet-Stevens made 26 different molds, from a sample brought from this trip, to obtain bricks that fit all situations, corners and curves. While bricks were still a traditional material in the region, its implementation in the Villa Cavrois is audacious, the lining ensures uniform volumes and accentuates the spectacular appearance of the building. 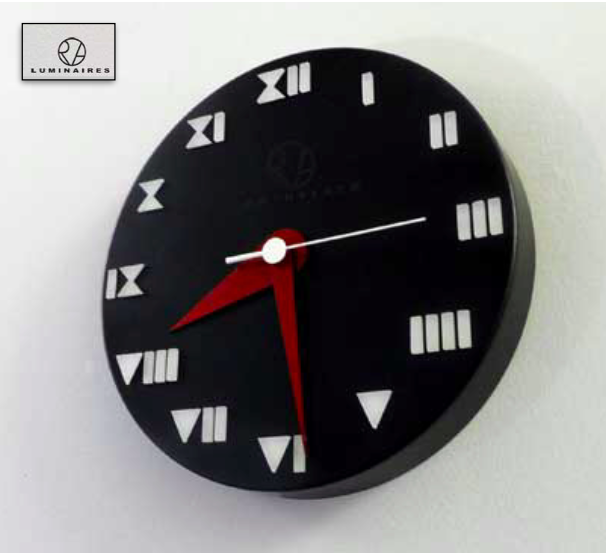 The coating follows a rigorous protocol in which the horizontal line is hollowed and painted black and the vertical marker was executed in such a way that it appears invisible. 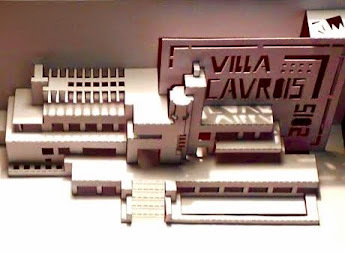 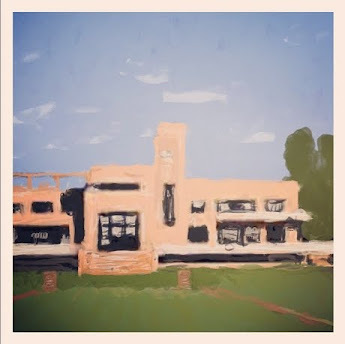 The horizontal lines are dominant in the silhouette of the villa: they stand out for the many terraces and how the brick lining has been handled. 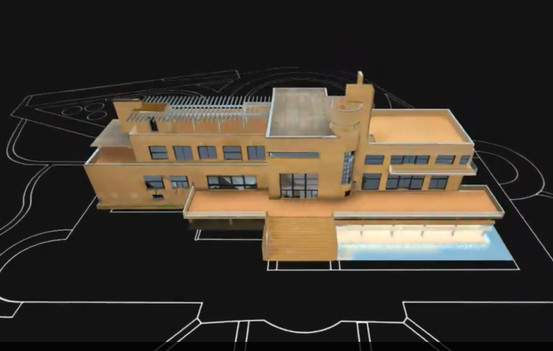 This radical overlay approach gives unity to the building as a whole. 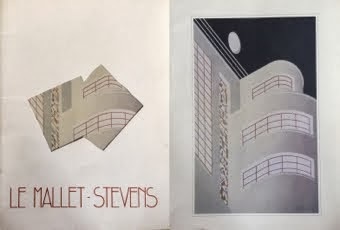 In line with the customer’s program, which required air and light, Mallet-Stevens made large openings in the facades with large windows. 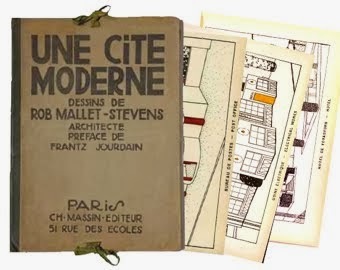 The modernity of Mallet-Stevens is expressed by the size of the windows, as well as by the choice of windows of guillotine of American inspiration. 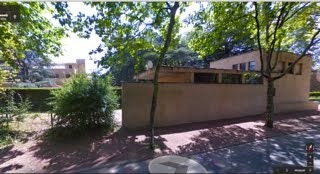 The window of the corner of the staircase of honor, like the other openings, offers a particular view of the park. 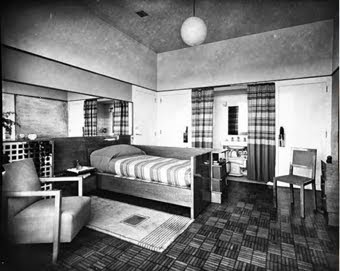 Mallet-Stevens paid great attention to the decoration and use of materials in the interiors. 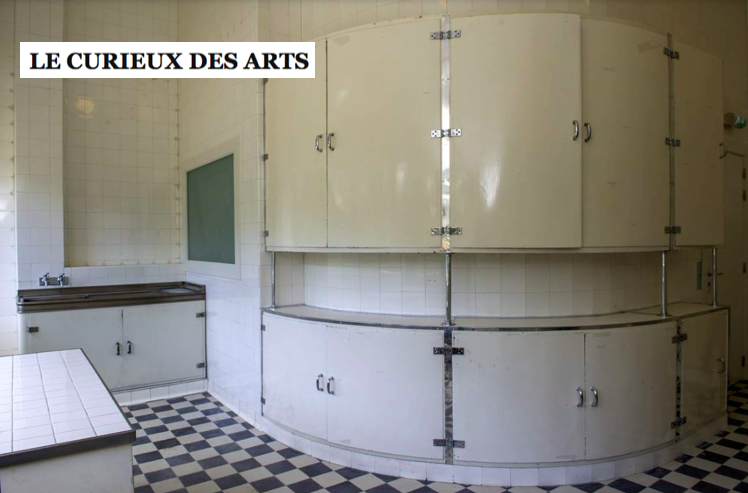 In compliance with the theories of the UAM (Union des Artistes Modernes), he advocated simplicity of form and decoration, and the use of industrial techniques and materials such as glass, metal and steel. 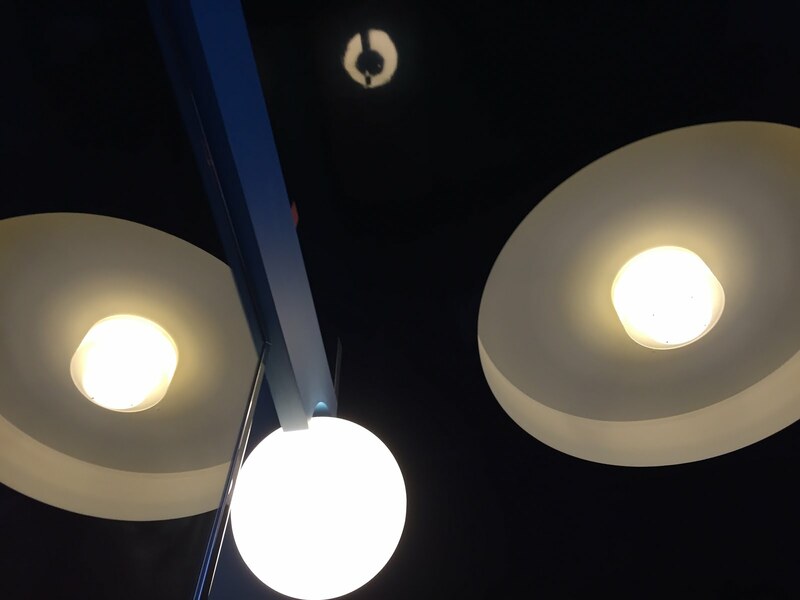 Metal is found everywhere, for example in lighting fixtures and radiator screens. 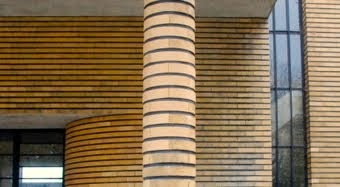 As noble materials, various types of wood and marble are used from various countries, particularly Italy, Belgium and Sweden. 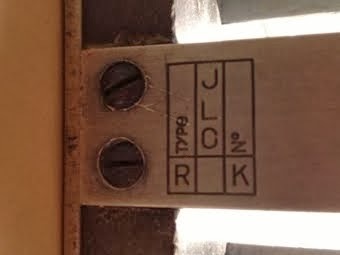 The exact way in which they are used varies from room to room. 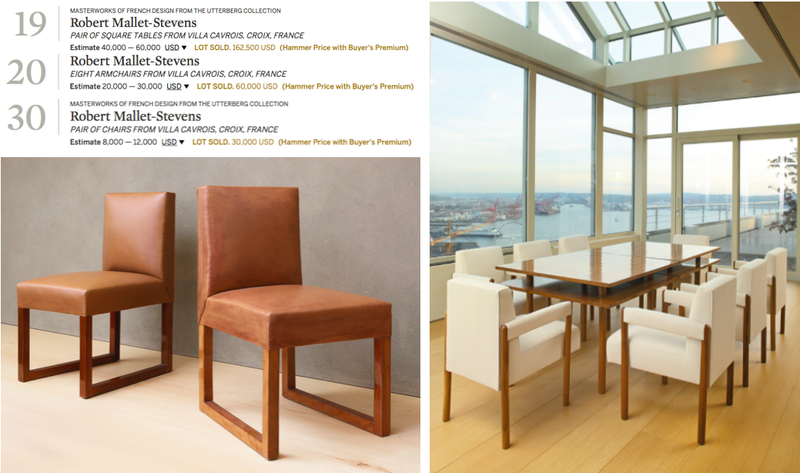 Furniture made with green marble from Sweden and veneer of pear wood varnished in the family dining room, while in the great room is used Sienna marble with walnut furniture, and so on. 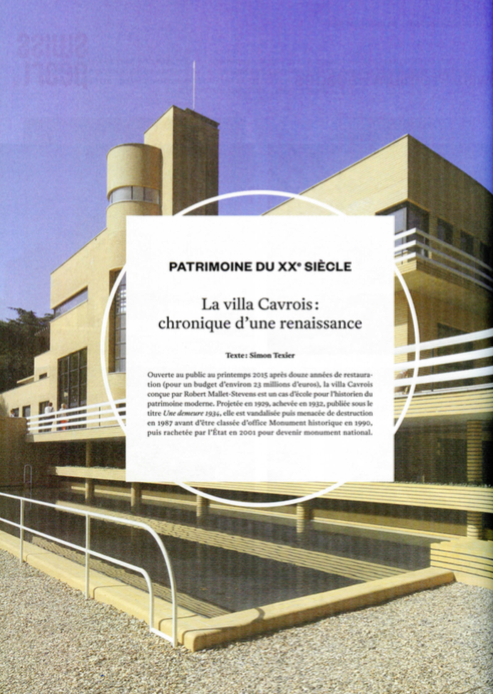 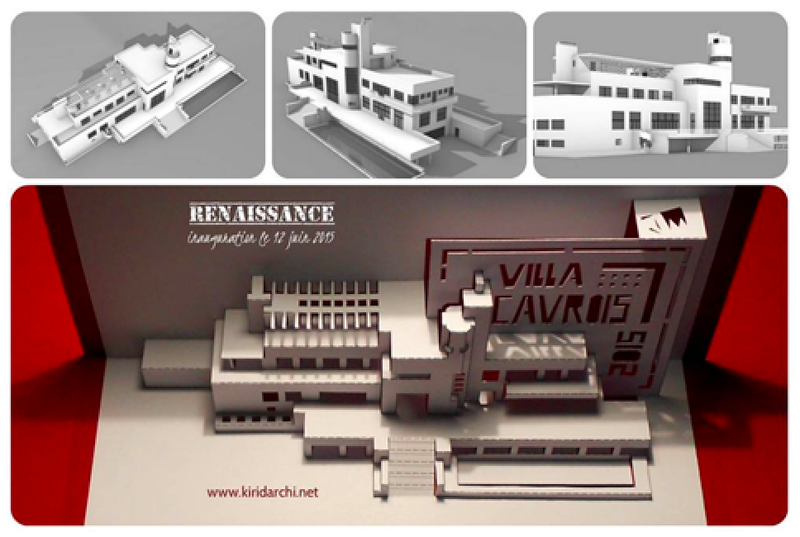 The villa brought together the most advanced technologies becoming an “aesthetic shock” between the work of traditional residential architecture and modernist architecture. 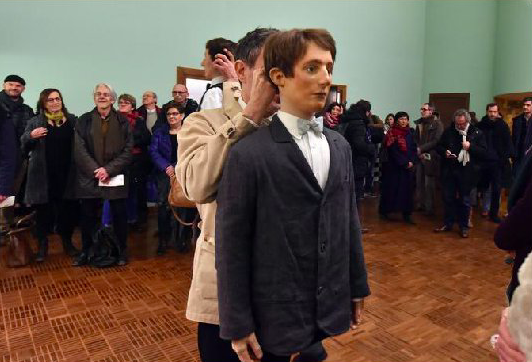 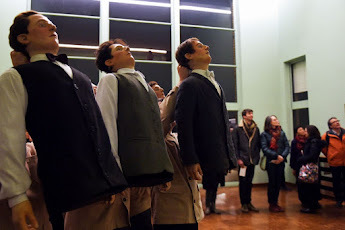 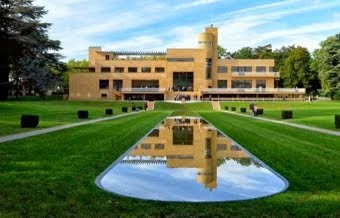 The artist Richard Klein described it as a “synthetic modernism” for the period. 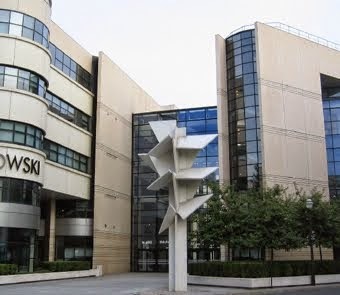 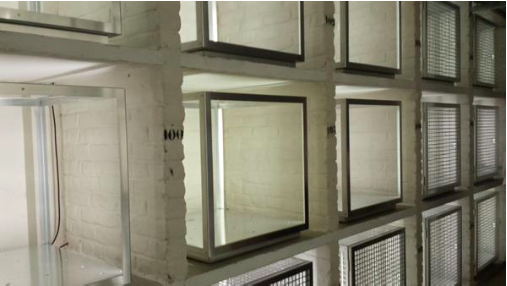 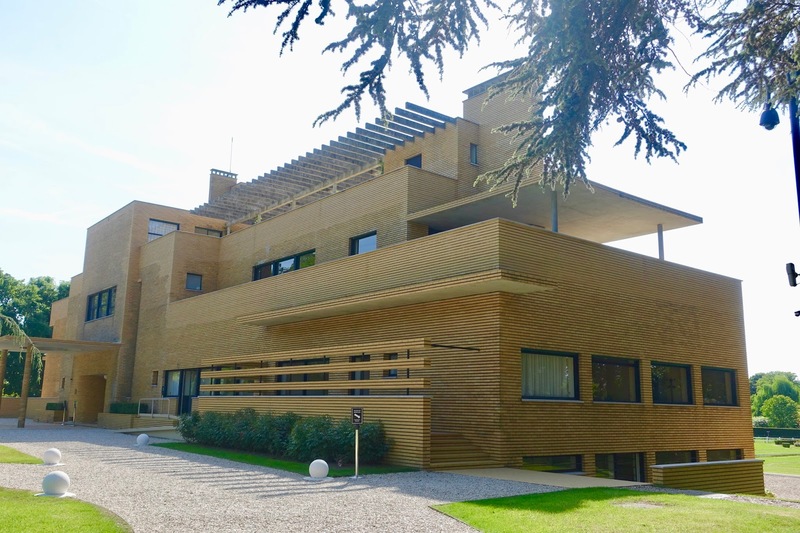 Its structure is made of reinforced concrete, with wide windows, indirect lighting, ventilation, cordless telephone in every room, central heating and a lift from the basement. 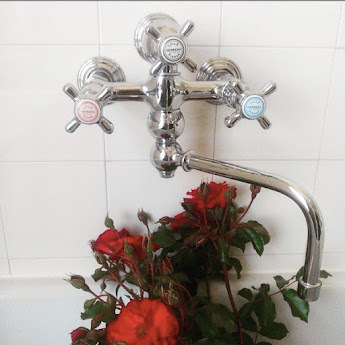 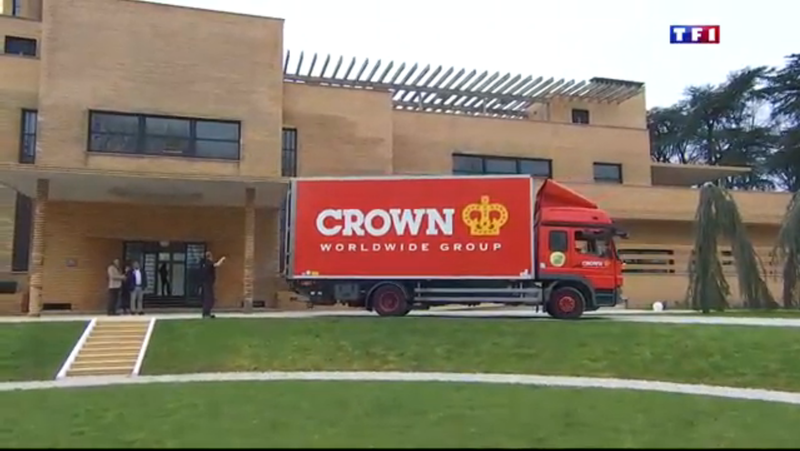 The works were carried out by qualified specialists and Mallet-Stevens supervised the installation of the domestic appliances, in particular those of the kitchen and laundry that incorporated the latest technology. 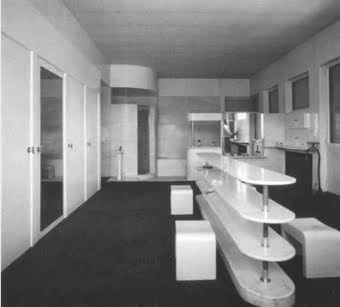 Hygiene was the main concern of Mallet Stevens in the design of the kitchen. 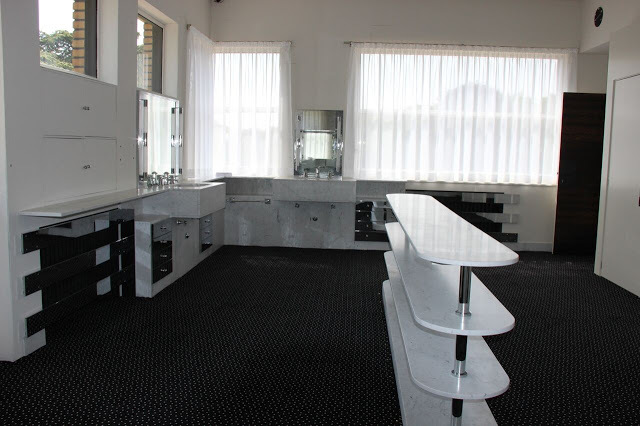 The architect opted for white surfaces and easily washable. 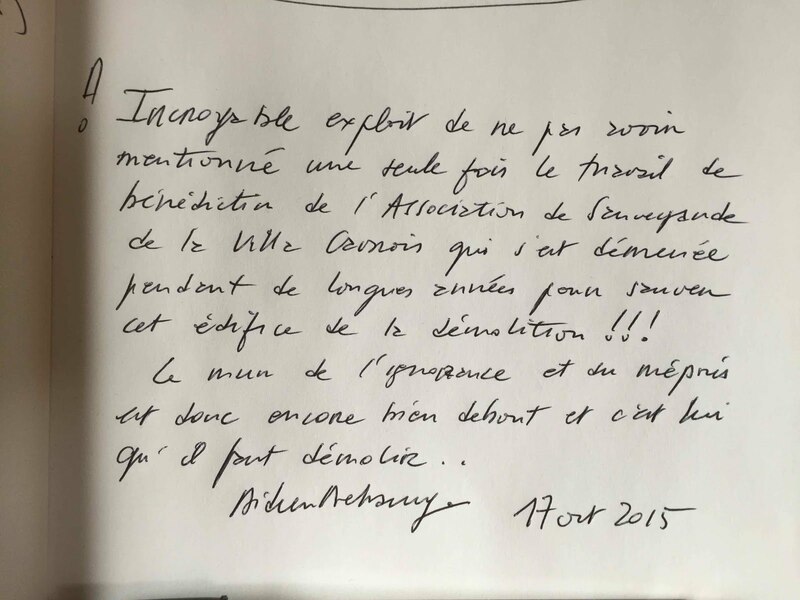 The black and white board floor is his discreet signature. 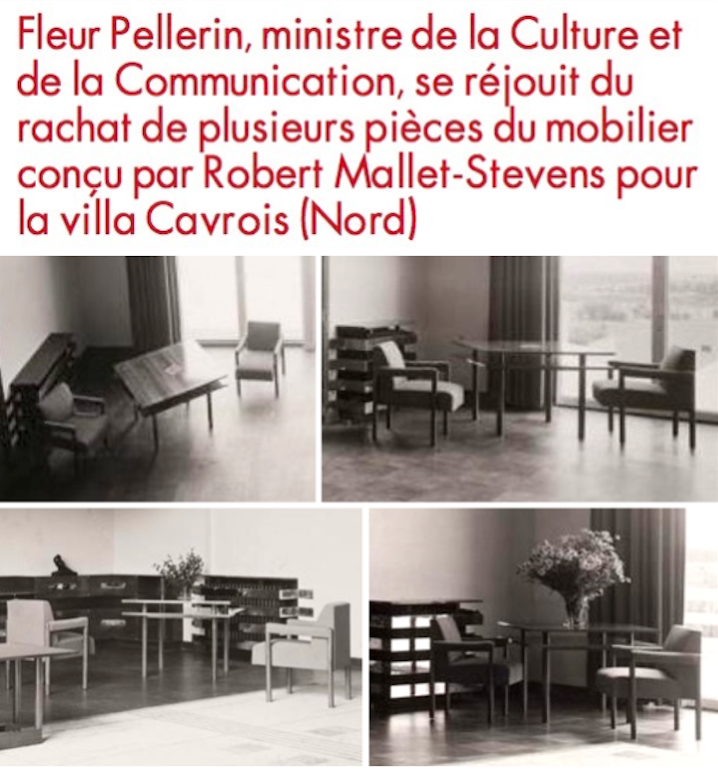 Mallet-Stevens equipped the kitchen with chairs that he designed in 1930 in collaboration with the company of Tubor that owns the patent. 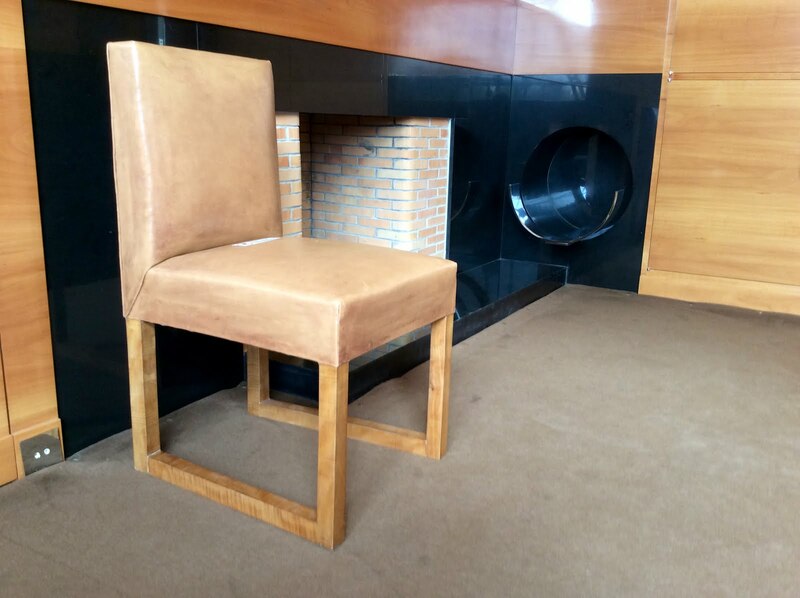 Made of metal tubes, Tubor chairs are simple and practical and are easily stacked. 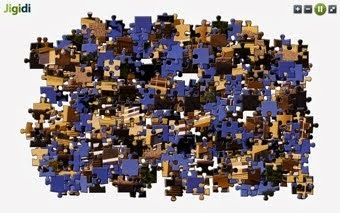 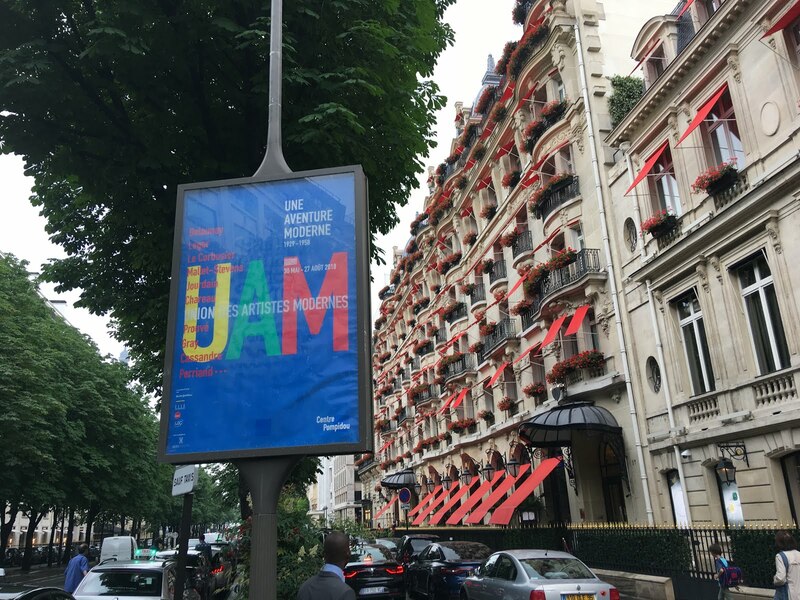 Reproducible in series and accessible to the greatest number of people, they perfectly illustrate the objectives of the UAM for the union of art and industry. 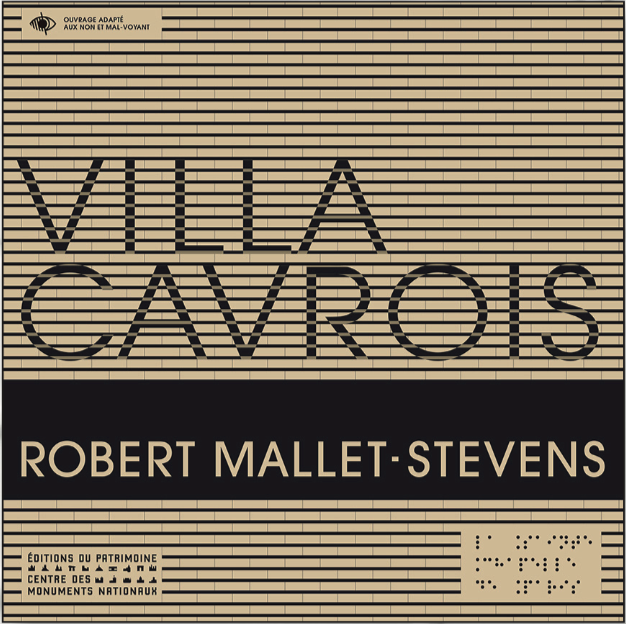 Mallet-Stevens uses them repeatedly in his designs, with several variants. 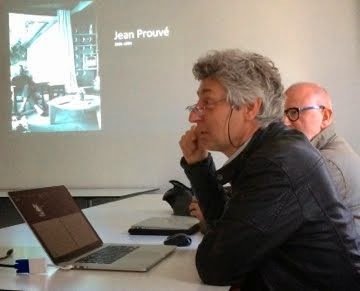 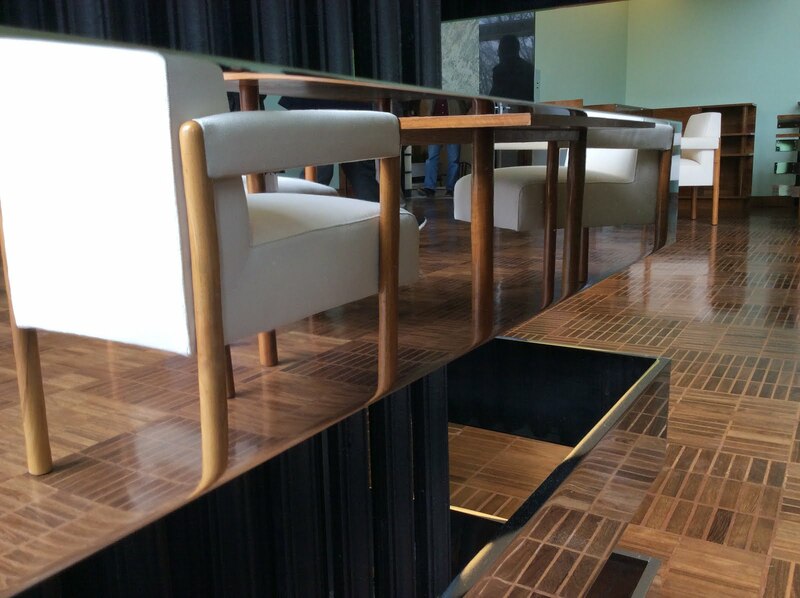 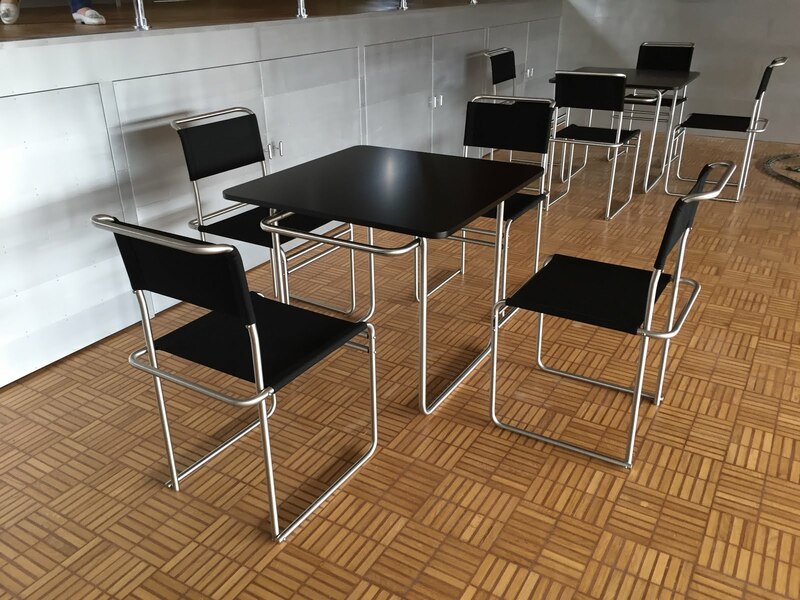 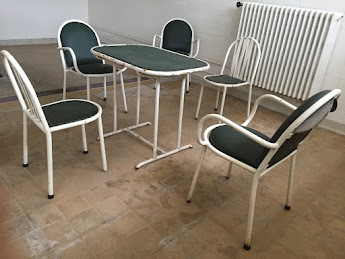 The chromed metal legs of the kitchen tables were produced in the workshops of Jean Prouvé. 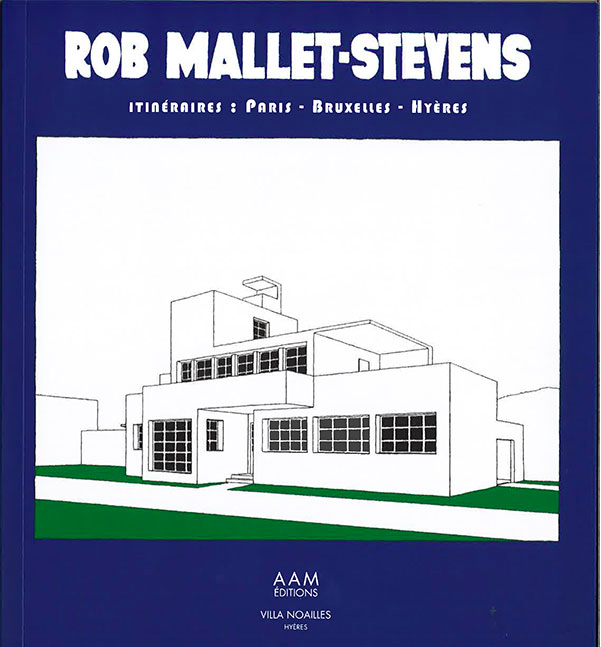 For lighting appliances, Mallet-Stevens called André Salomon, lighting engineer, with whom he collaborated while working on store design. 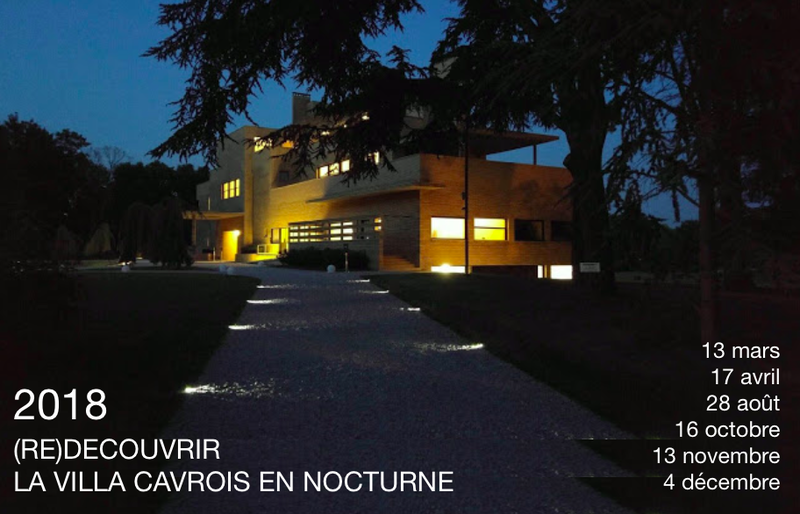 Together, they exploited the possibilities of built-in indirect lighting, which was completely innovative in domestic architecture. 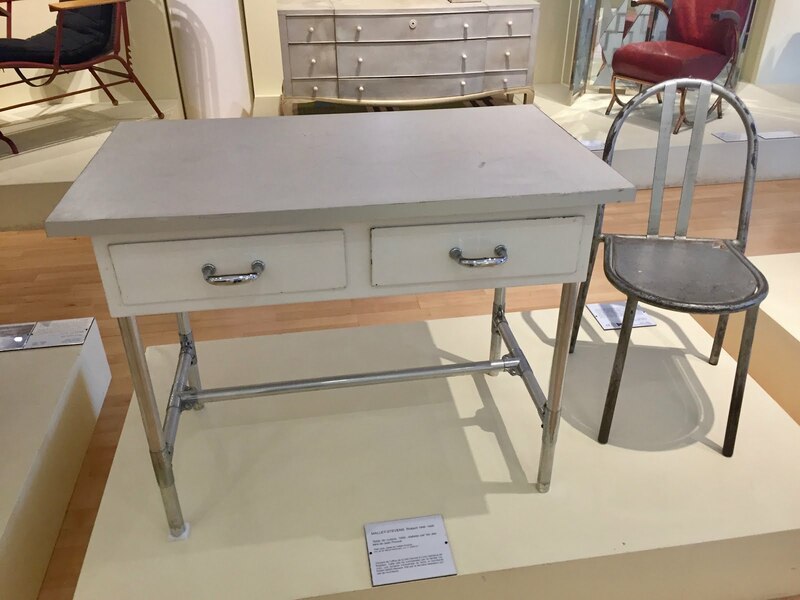 For the dining room, a reflector was designed in decorative plaster, under which was fixed a long lane rounded in polished aluminum. 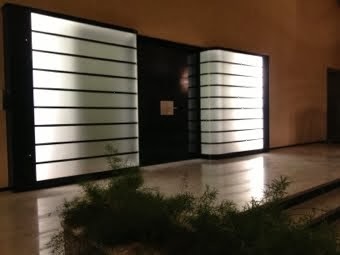 The volumes of the casing create rhythm so that the light itself becomes a material in its own right. 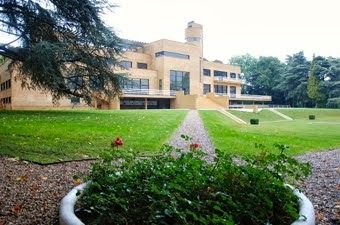 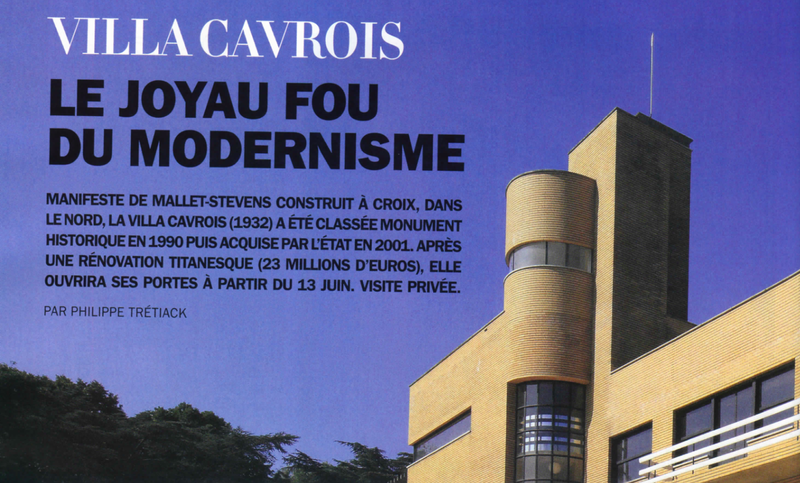 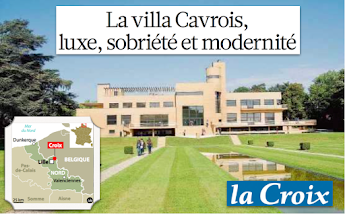 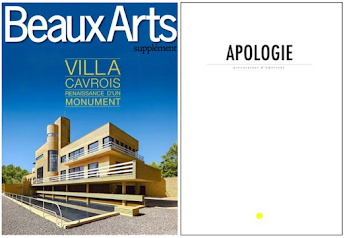 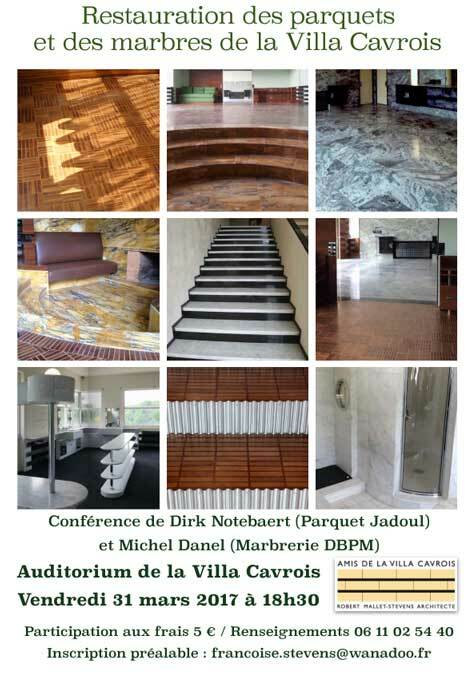 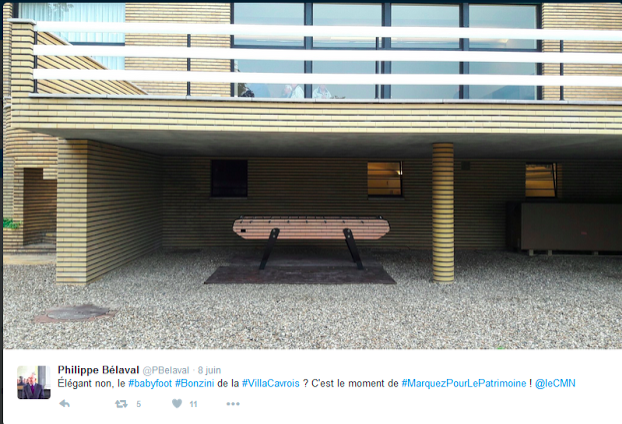 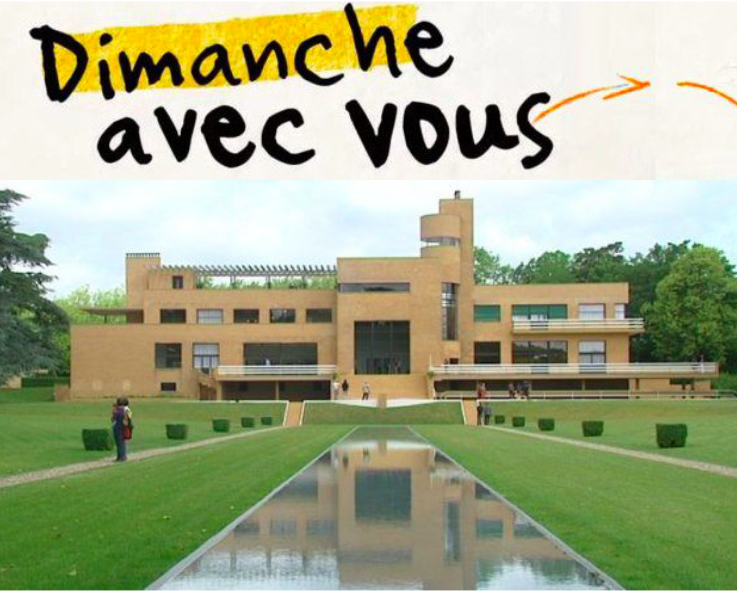 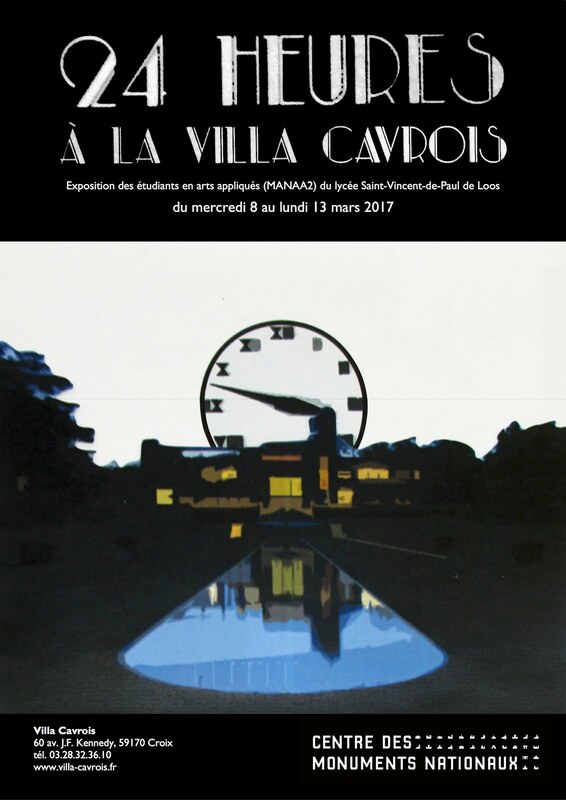 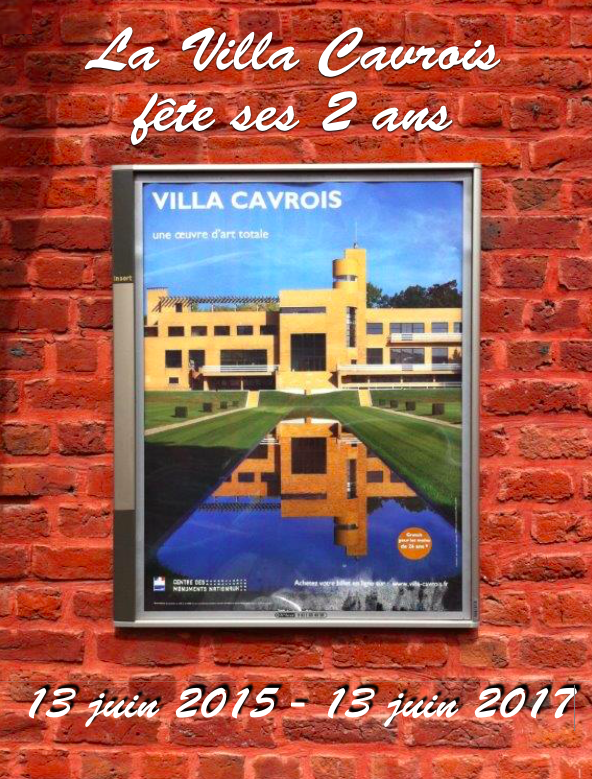 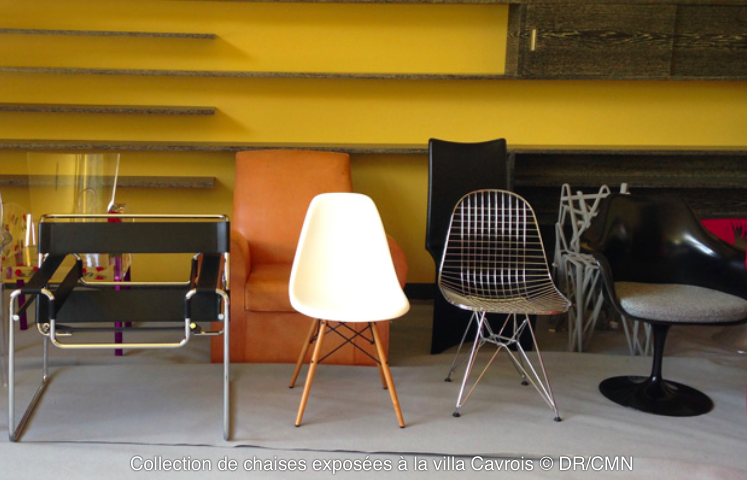 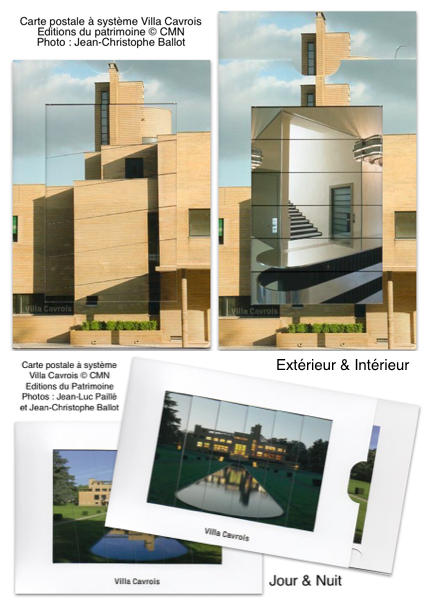 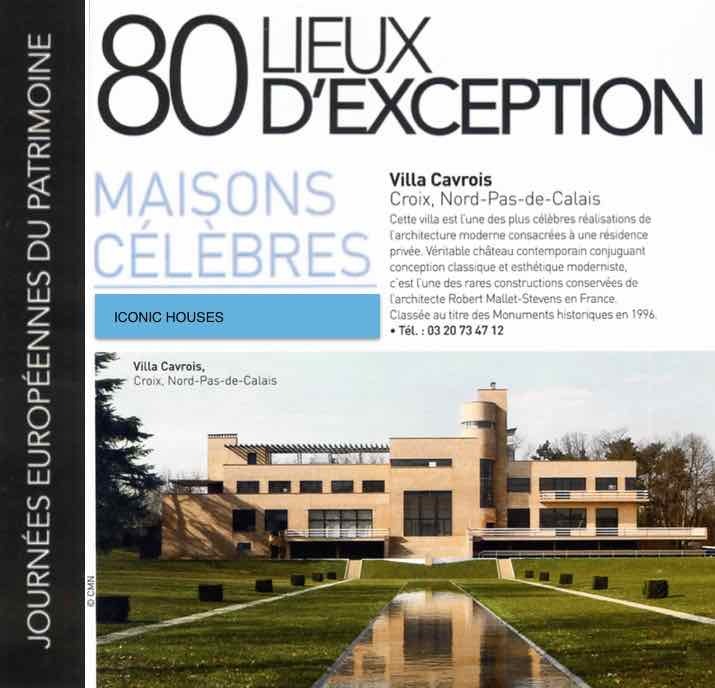 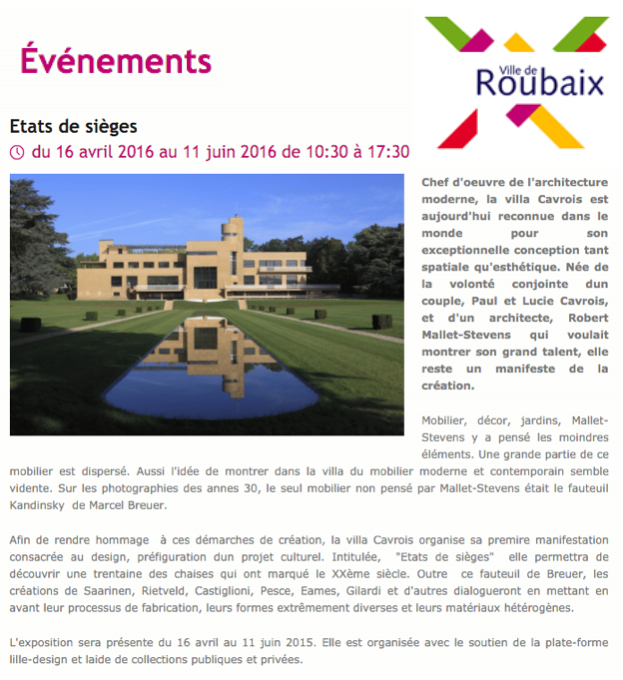 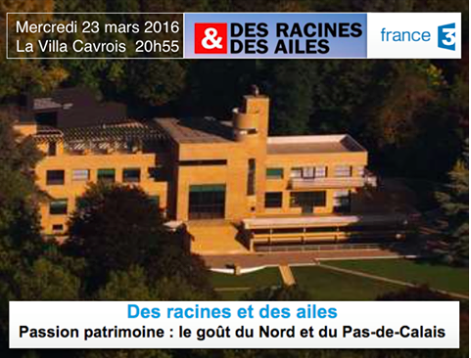 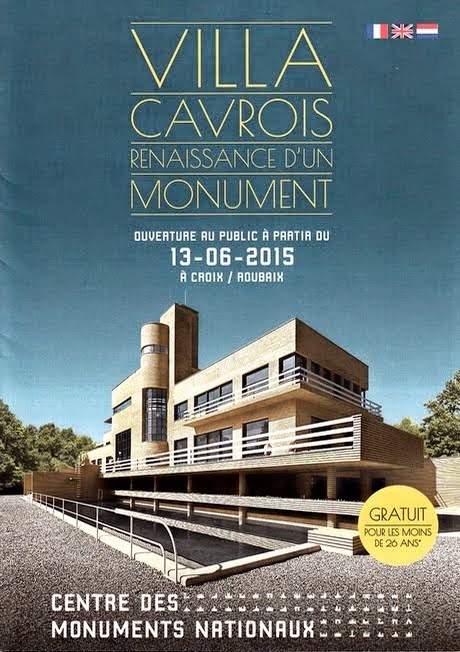 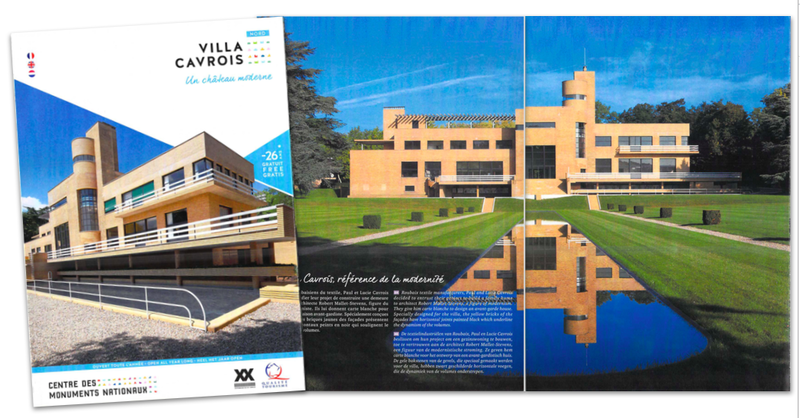 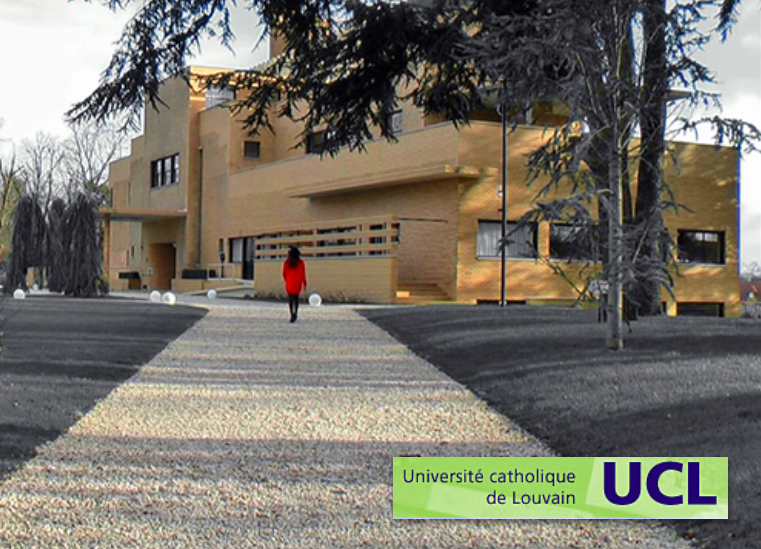 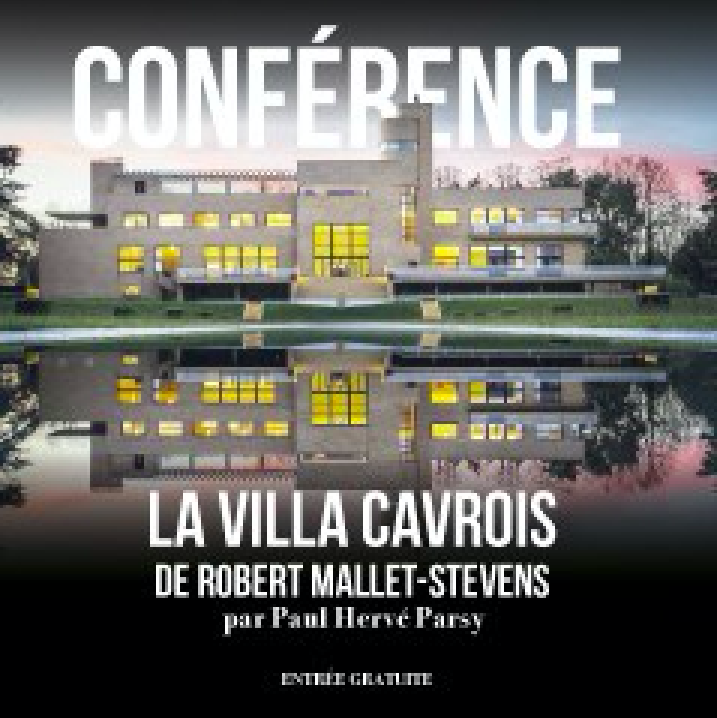 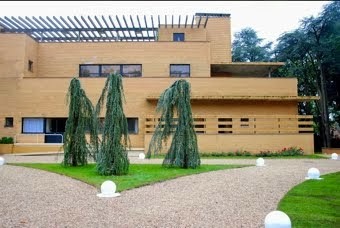 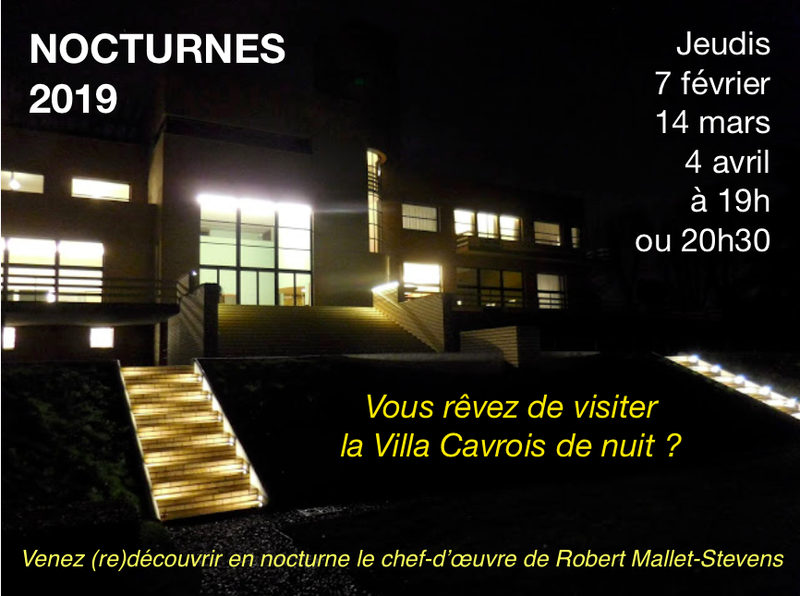 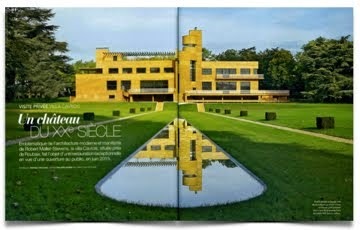 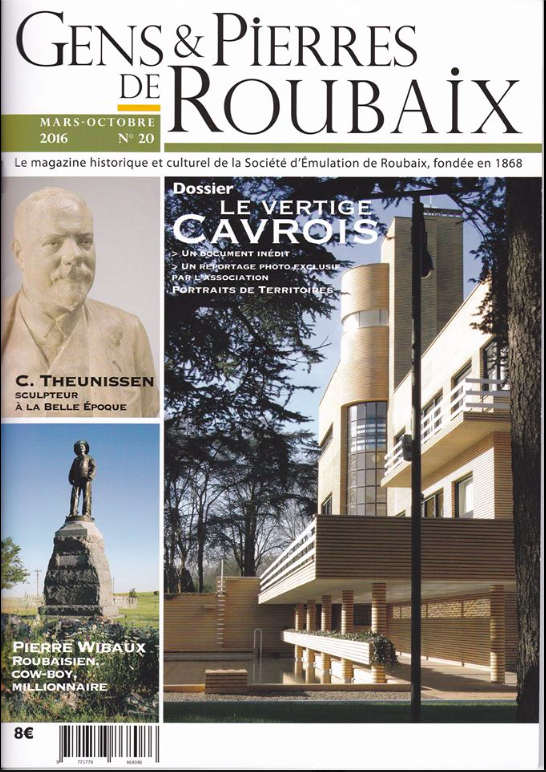 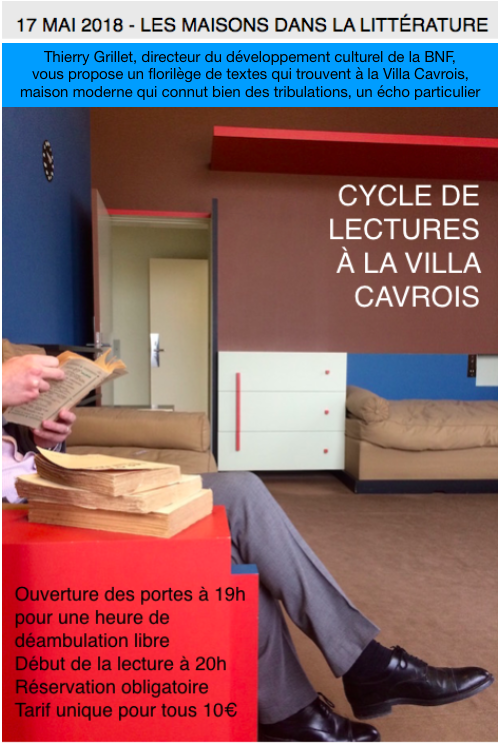 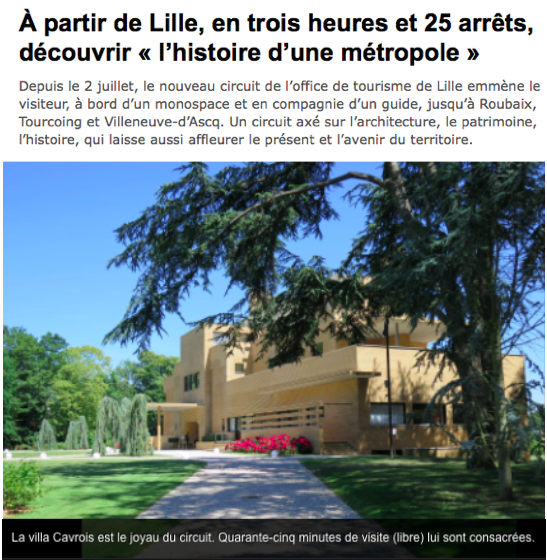 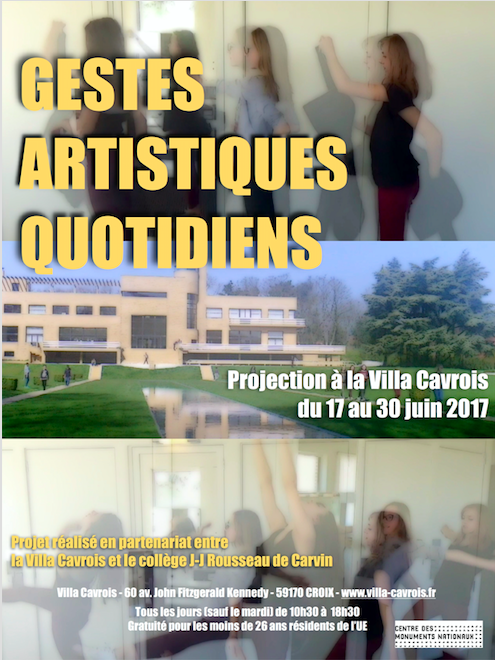 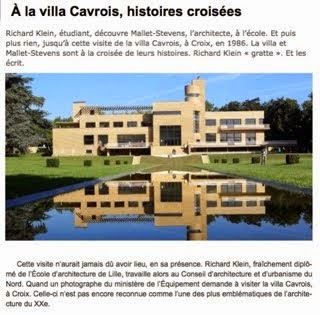 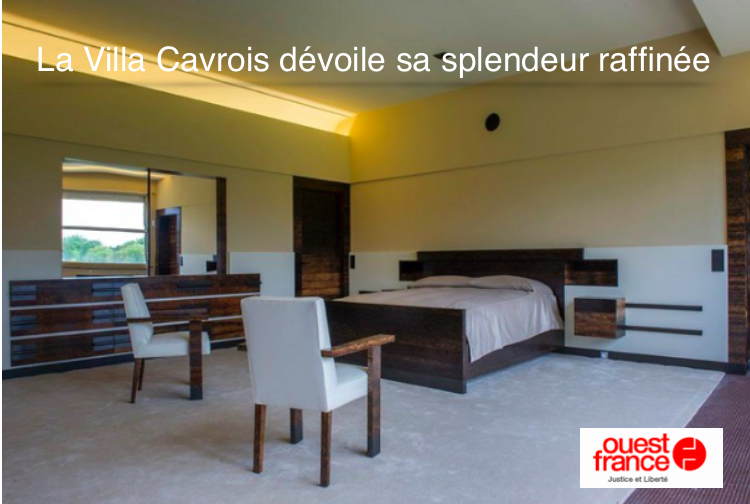 Villa Cavrois is a spectacular modernist building tucked away in Croix, not far from Lille in Northern France. 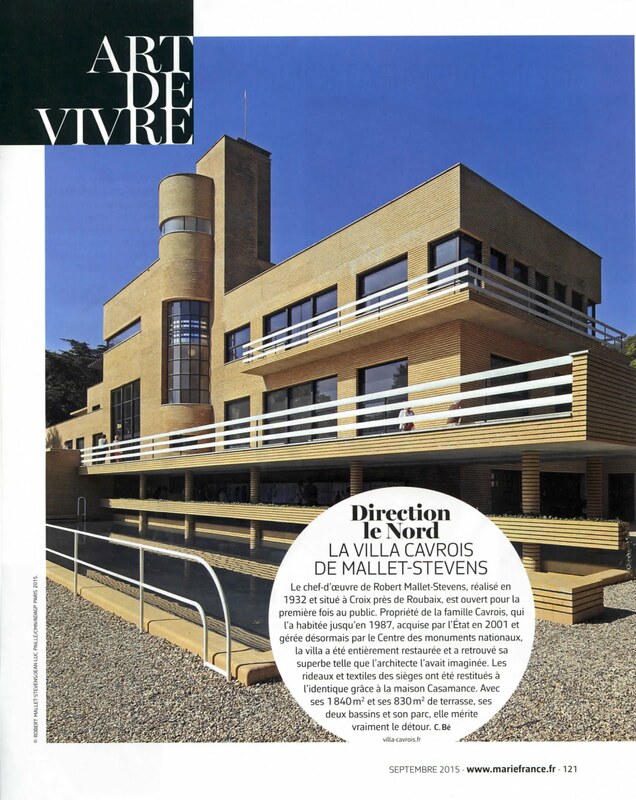 Built between 1929 and 1932, it was designed by architect Robert Mallet-Stevens for industrialist Paul Cavrois. 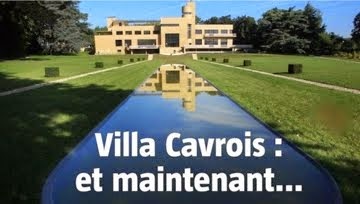 The villa was intended as a home for the Cavrois household which included seven children and a number of domestic servants. 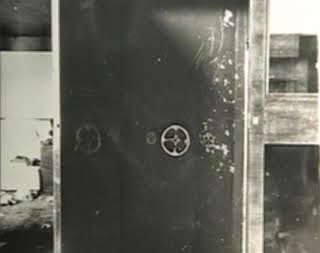 The family fortune had been made from two spinning operations and dye-works. 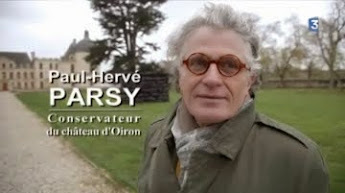 Hailing from neighbouring Roubaix, he married his brother's widow and together they had four children to add to her three from the first marriage. 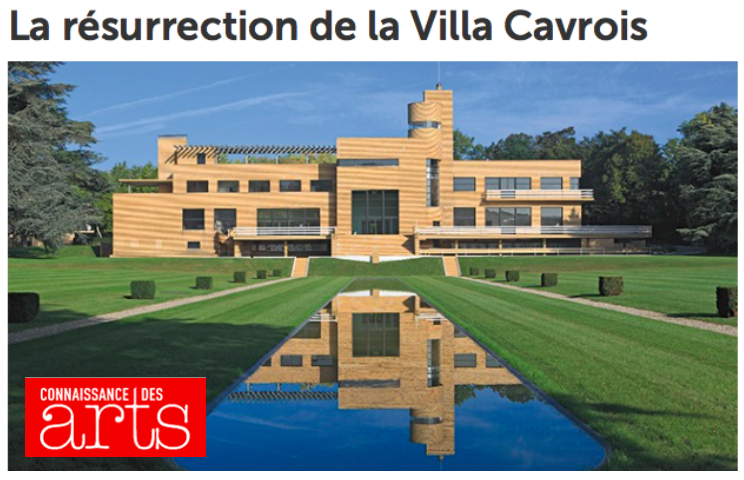 The villa makes a spectacular impact on this green, semi-rural area due to its striking yellow brick structure which is supported by a concrete frame. 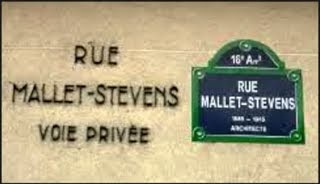 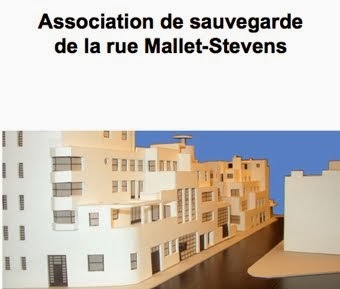 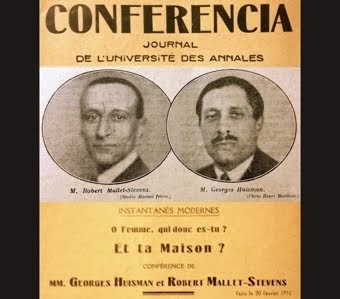 Mallet-Stevens was also responsible for a number of Parisian villas built between 1926 and 1929 in the street now named for him. 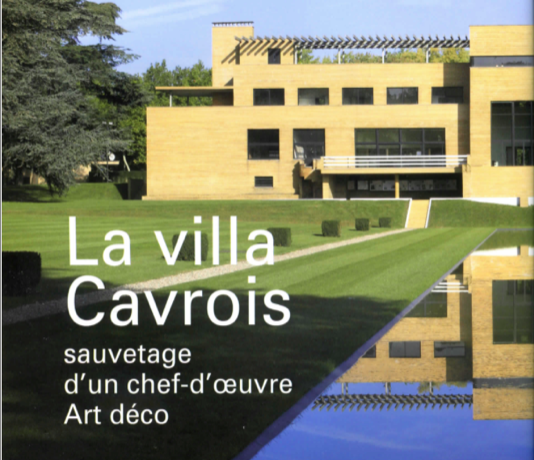 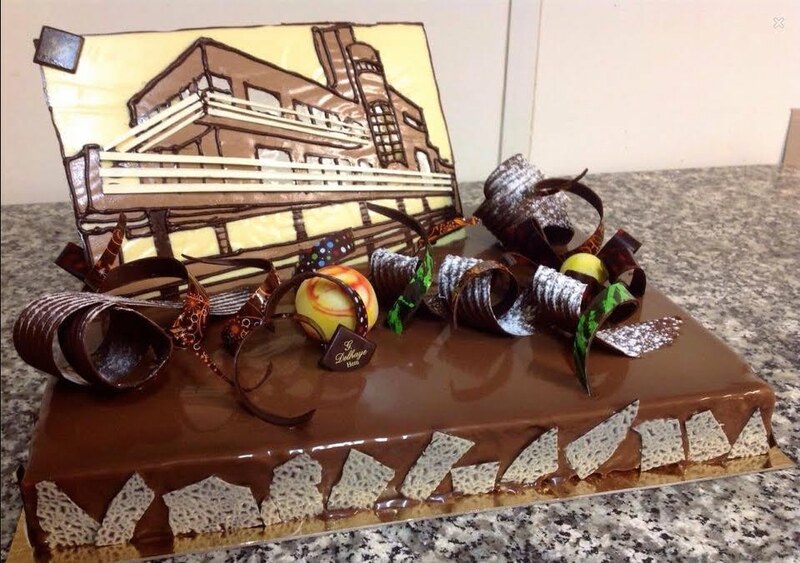 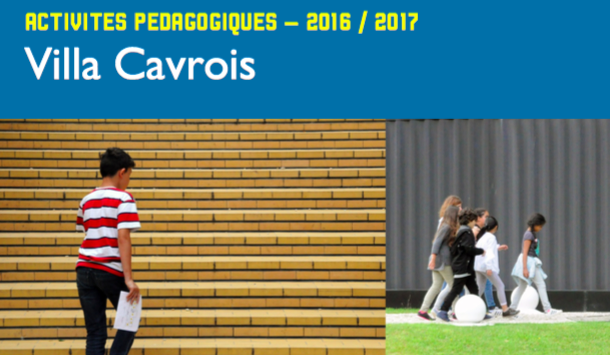 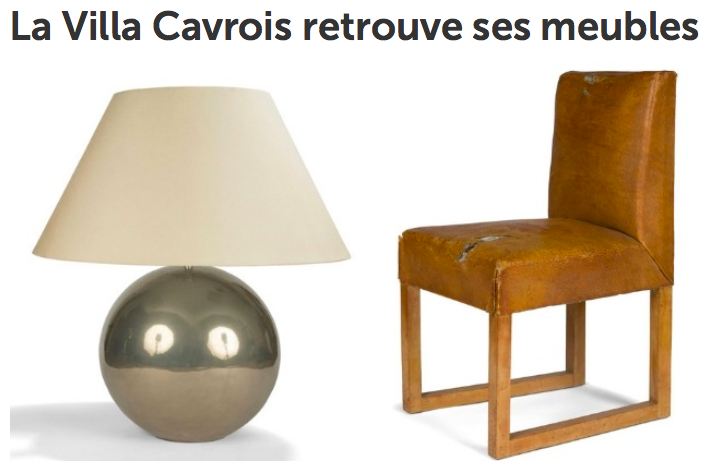 Beautiful as his Parisian buildings are, Cavrois is surely his masterpiece. 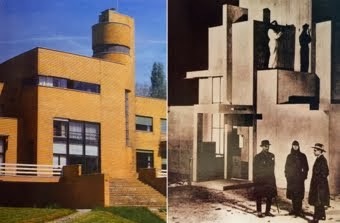 The architect was not the first choice for the commission. 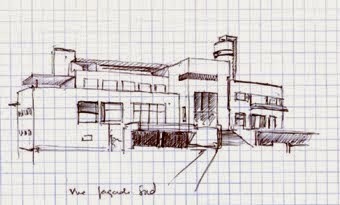 Jacques Greber had been engaged to design the house in 1925 but his proposals were not finalised. 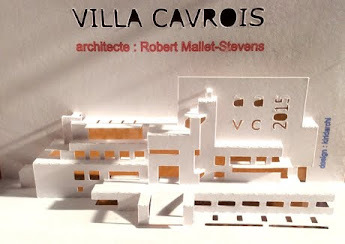 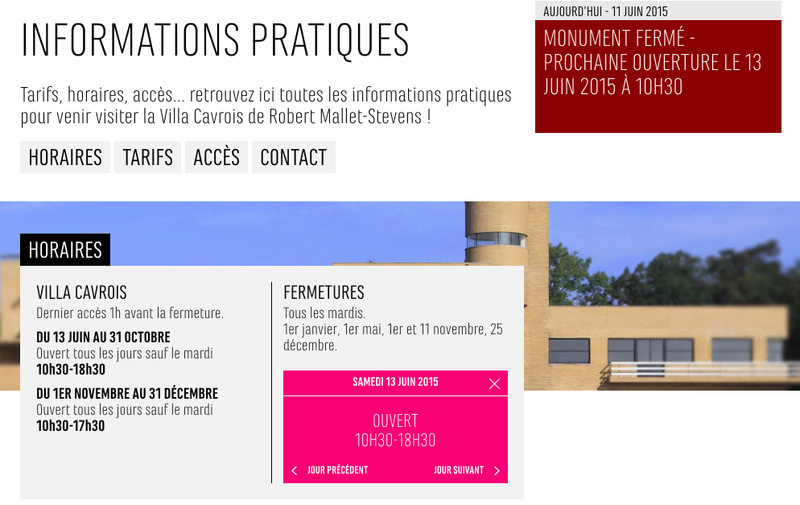 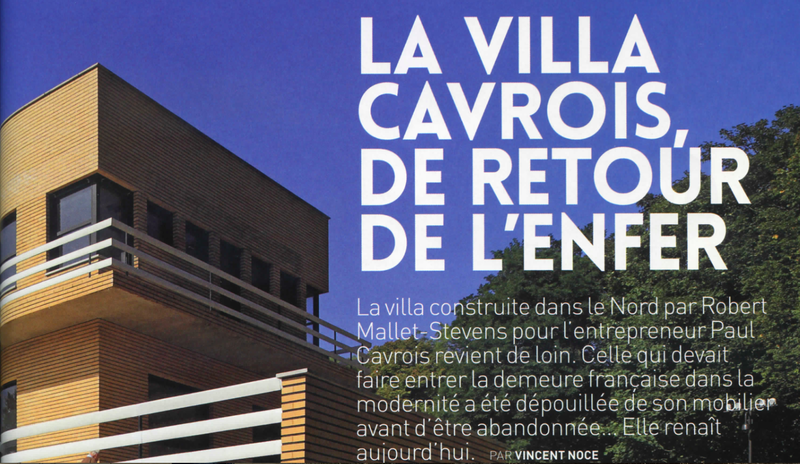 Cavrois preferred to employ Mallet-Stevens who began drawing up plans in 1929. 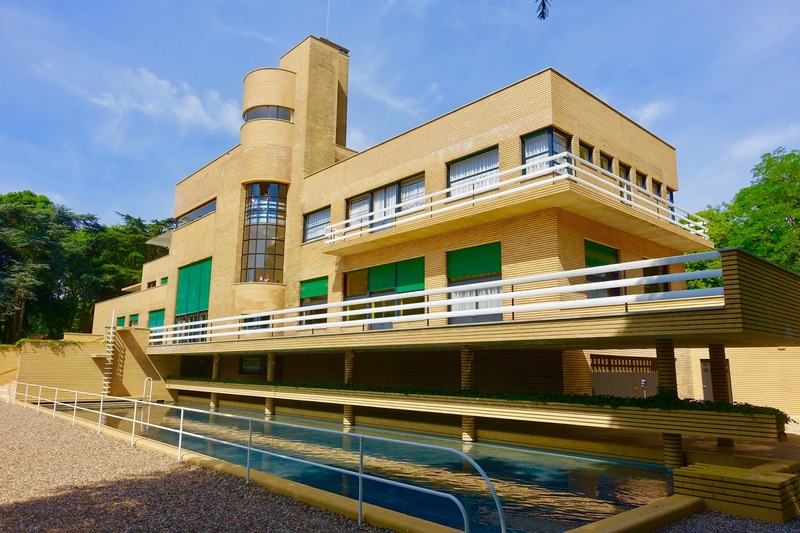 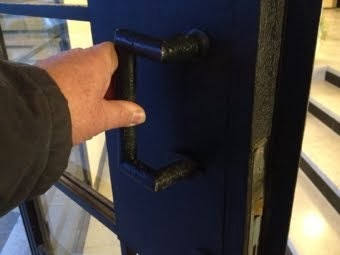 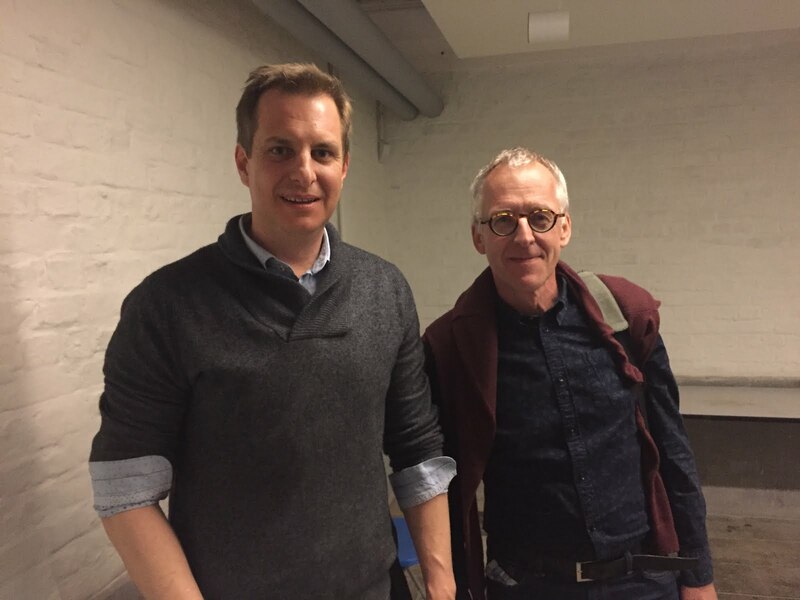 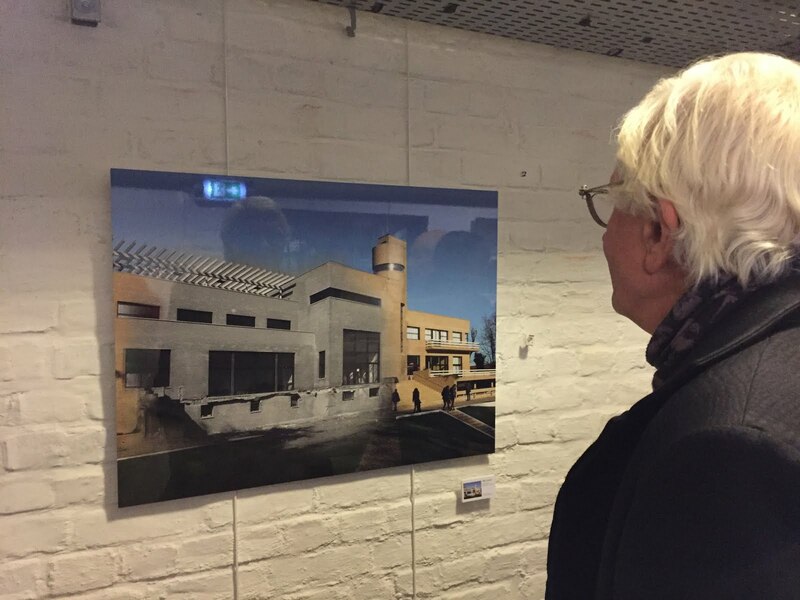 Wanting to convince the family of his approach he took the couple to Hilversum in the Netherlands to show them the Willem Dudok designed Town Hall. 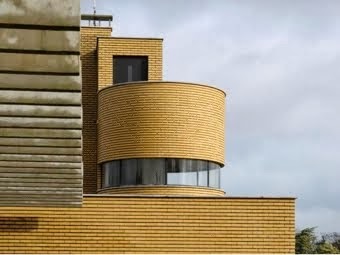 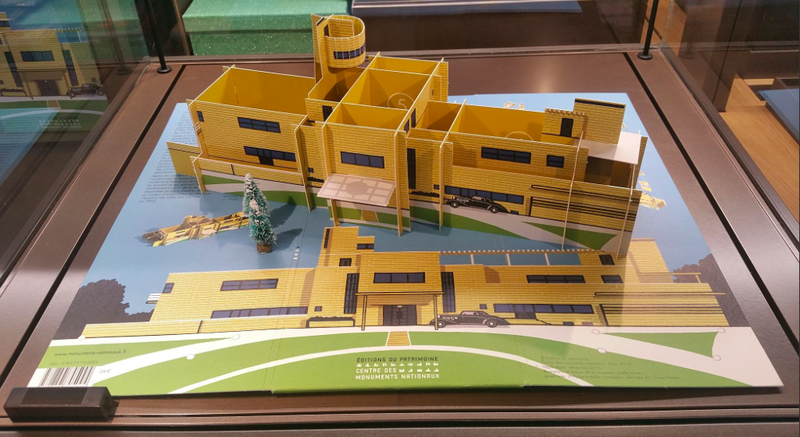 Sold on the modernist style, the couple agreed to this approach for their home including the facades being covered with those wonderful yellow bricks. 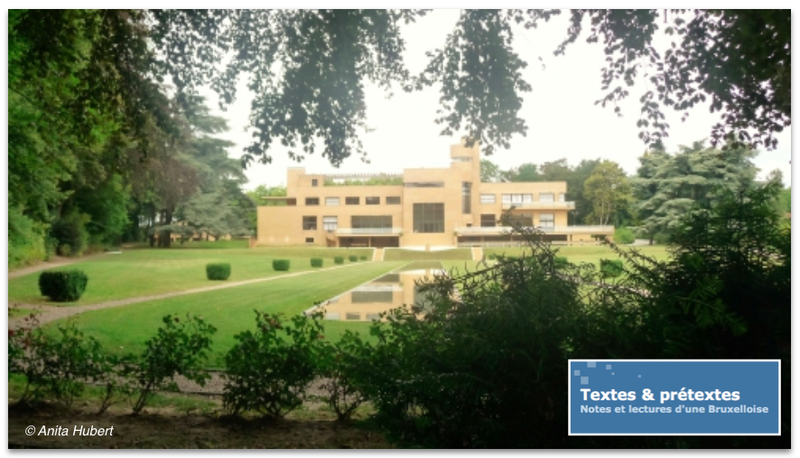 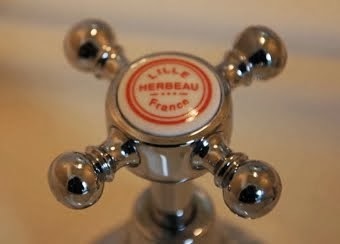 Work was completed in 1932 and the house was inaugurated on July 5th with the marriage of their daughter Genevieve. 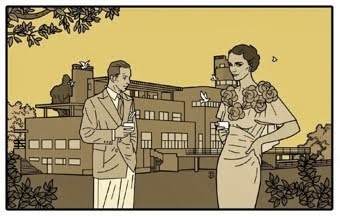 Despite this being during a period of economic crisis, the wedding was an opulent affair. 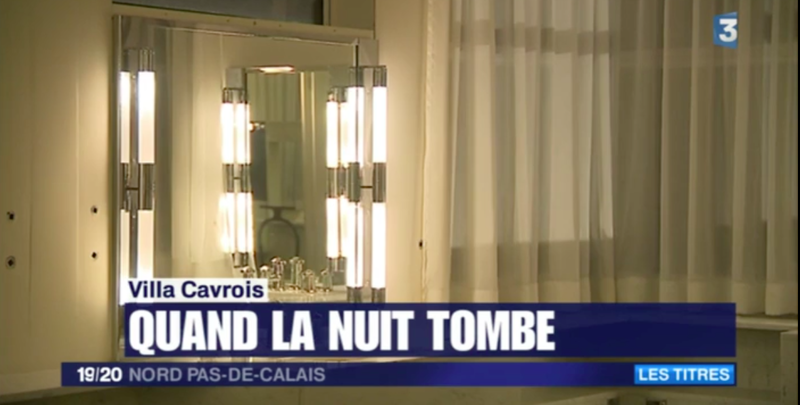 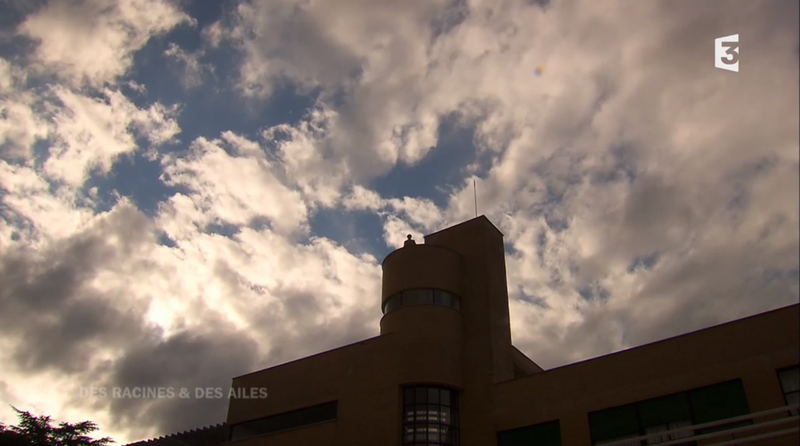 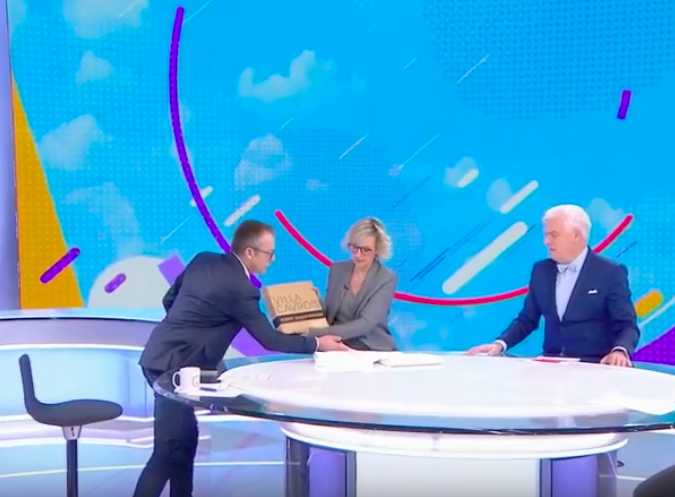 Flowers were dropped from an airplane in honour of the newlyweds and after nightfall, Andre Salomon the lighting engineer orchestrated a mise en lumiere. 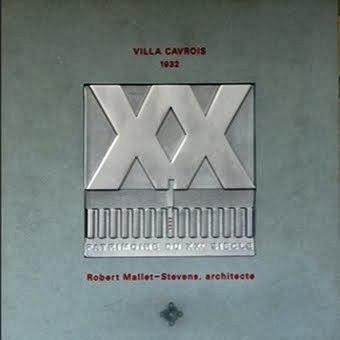 Mallet-Stevens set out his design principles for the villa in his book. 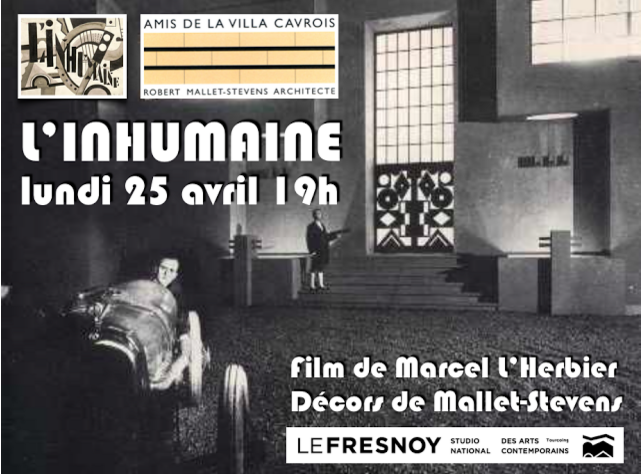 Une demure 1934 (A 1934 home). 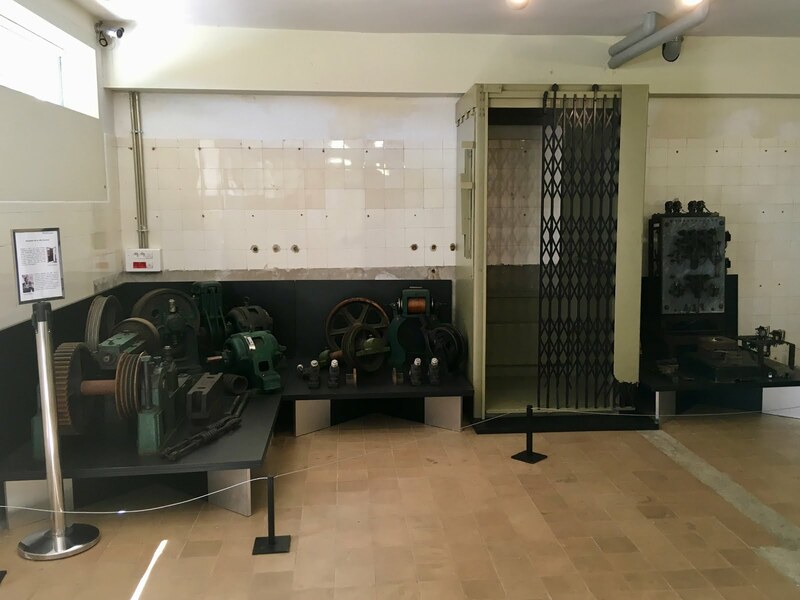 These included making use of the most up to date technology including central heating, ventilation and lifts as well a telephone and a radio in every room. 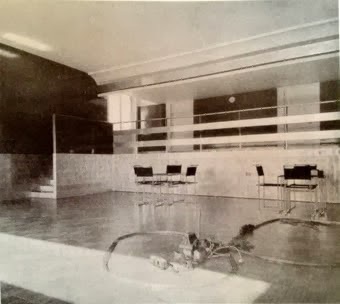 Furthermore the villa was designed with separate areas for receiving guests, for carrying out domestic tasks, for the parents, for the children and for sport and leisure. 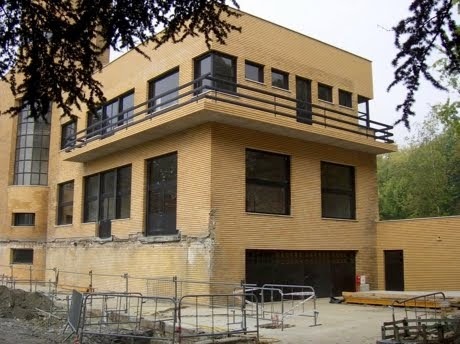 The Second World War began just seven years after the house was completed and between 1940 and 1944 it was confiscated by the occupying German army and sustained damage at the War's end. 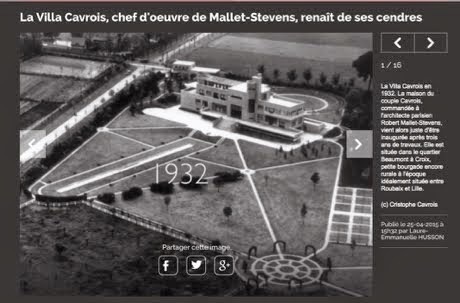 The Mallet-Stevens had died in 1945 and so when the family returned in 1947, Monsieur Cavrois requested another architect, Pierre Barbe to add two apartments for the elder sons. 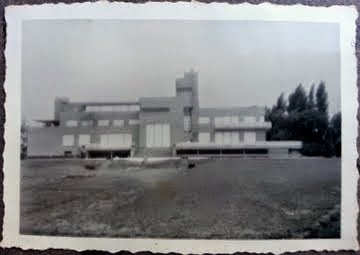 The family remained in the villa until 1985 before it was sold to a real estate company that wanted to subdivide the park. 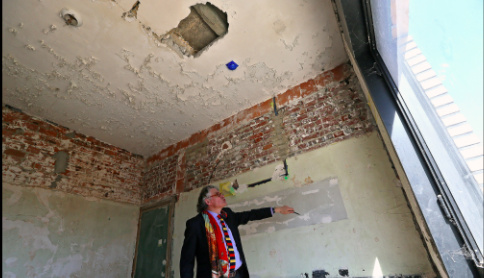 The new owners ceased maintaining the building which became prey to looters and despite being listed as a national monument was allowed to become dilapidated. 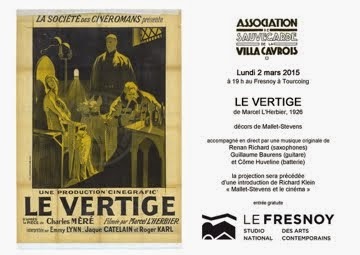 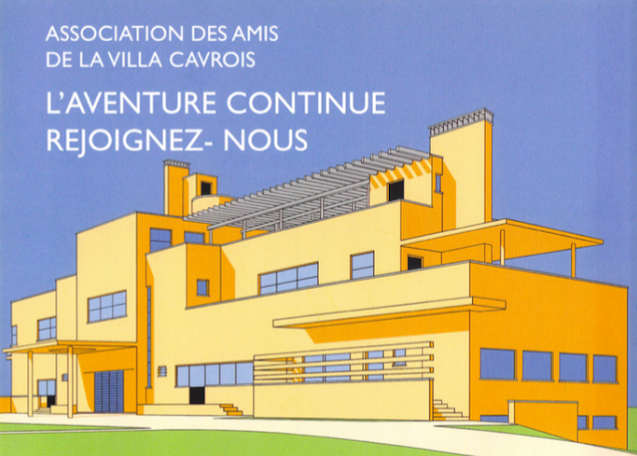 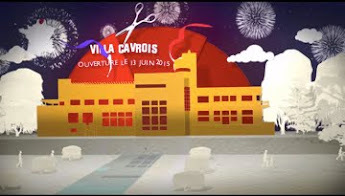 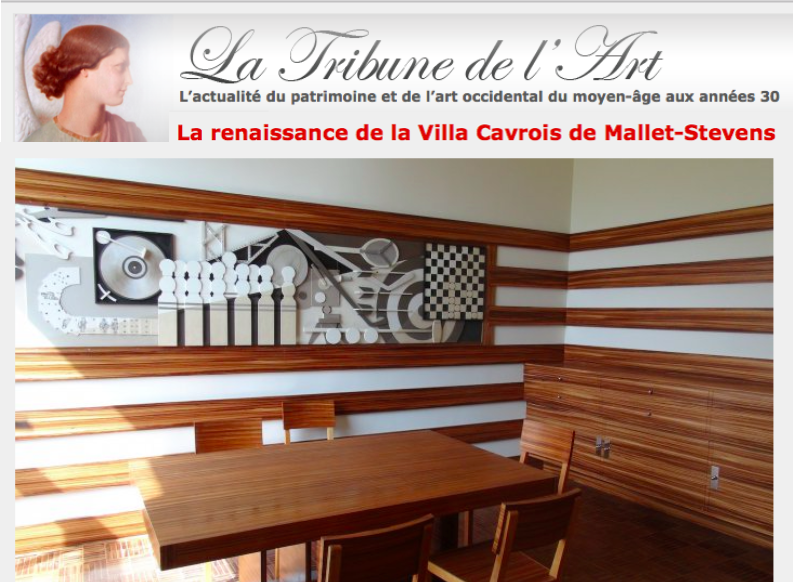 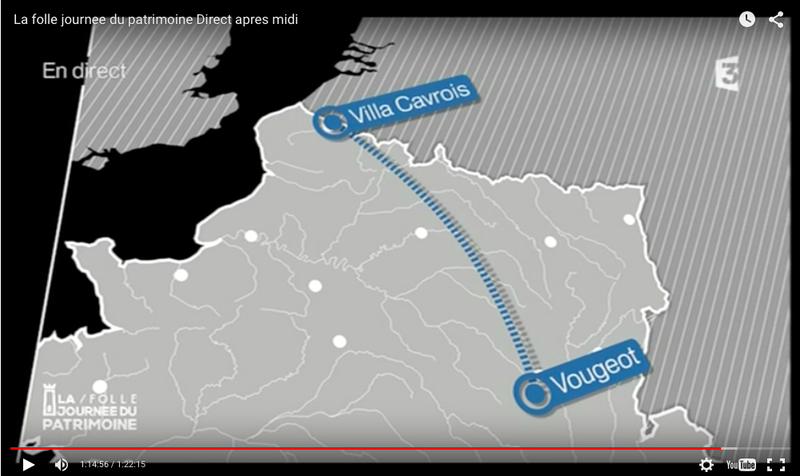 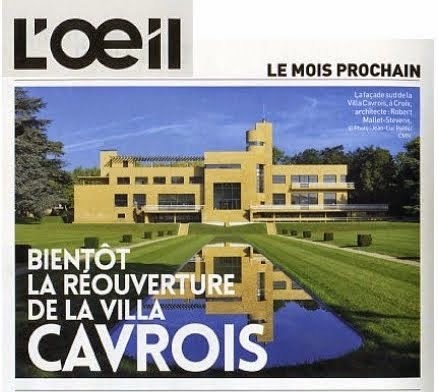 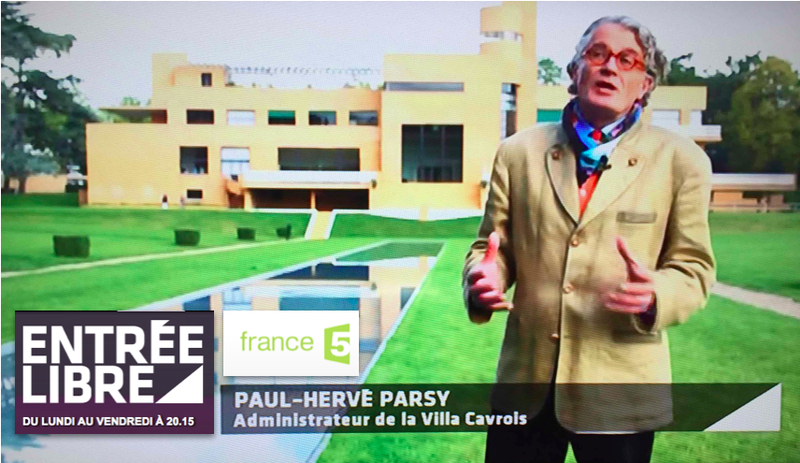 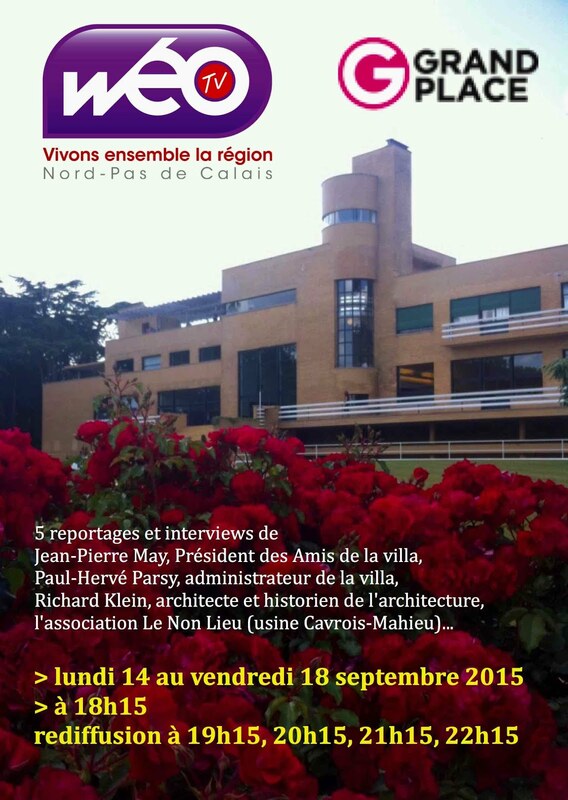 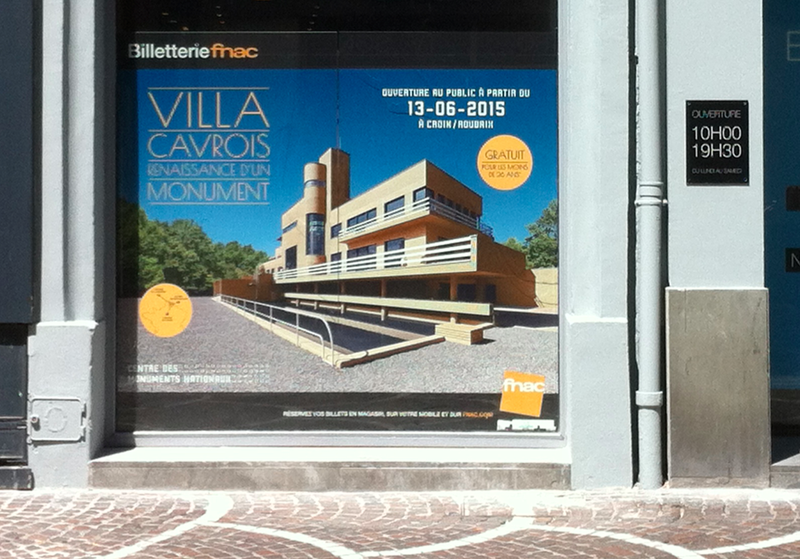 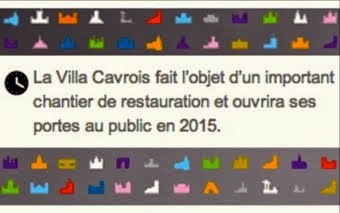 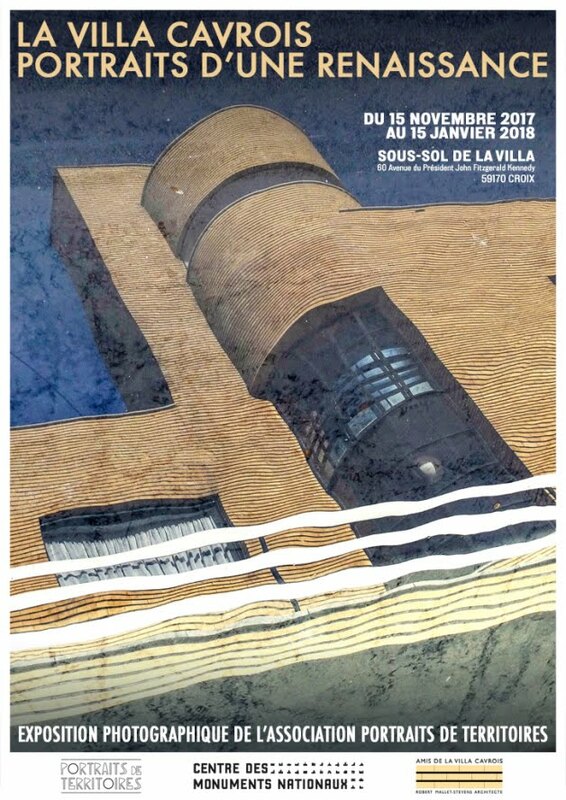 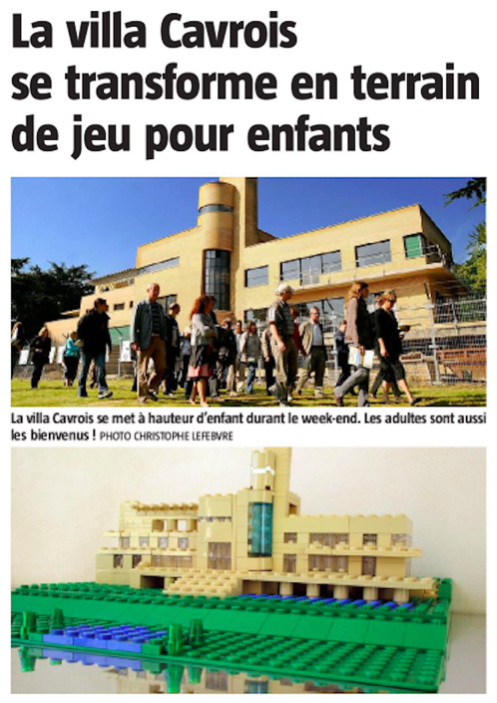 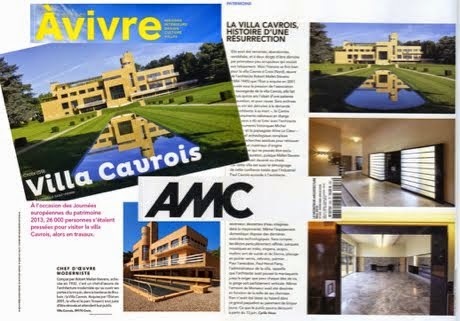 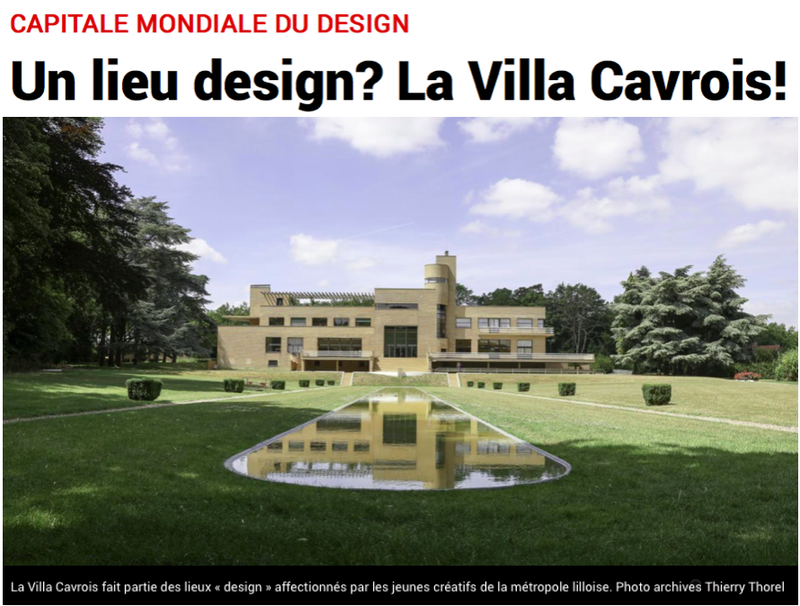 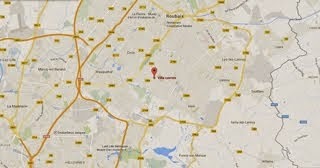 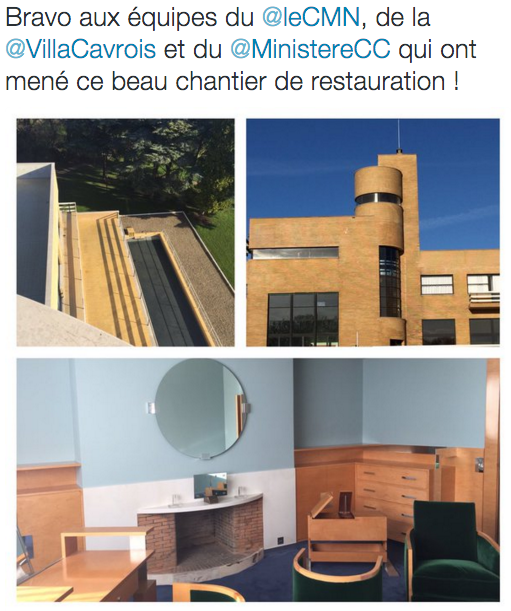 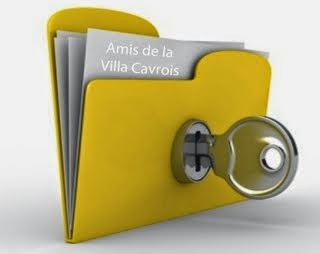 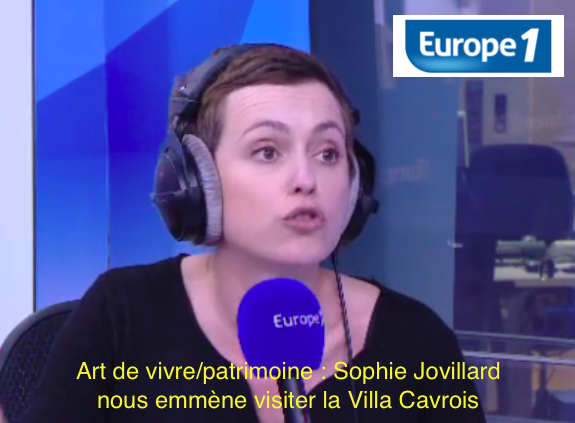 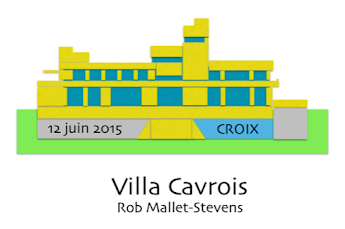 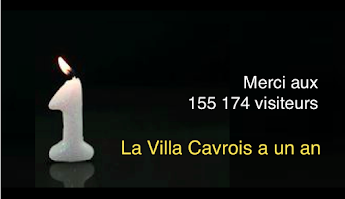 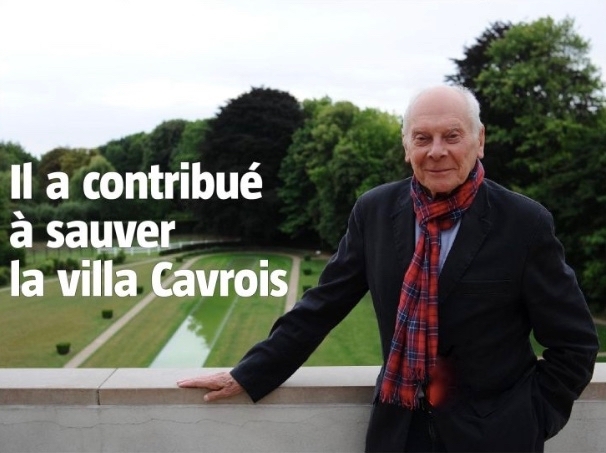 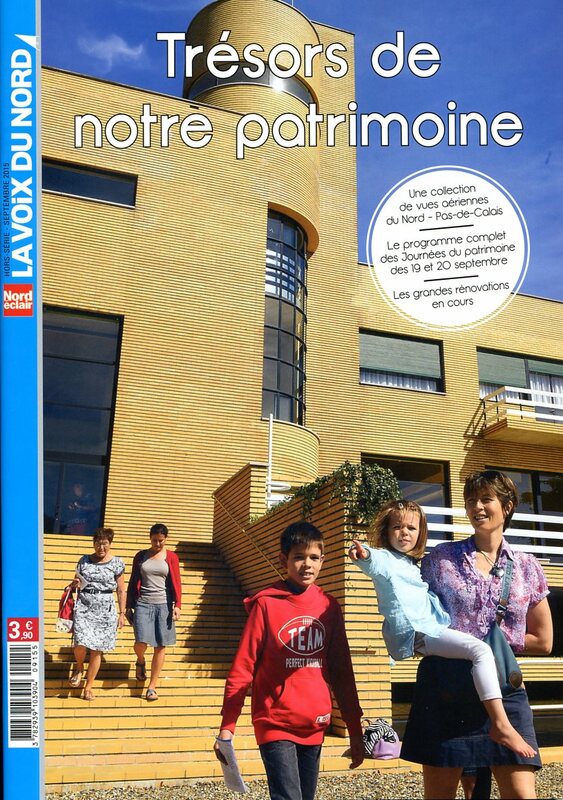 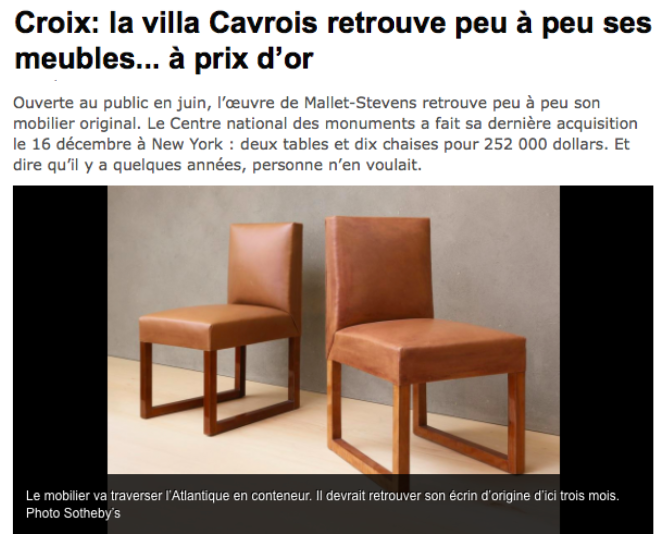 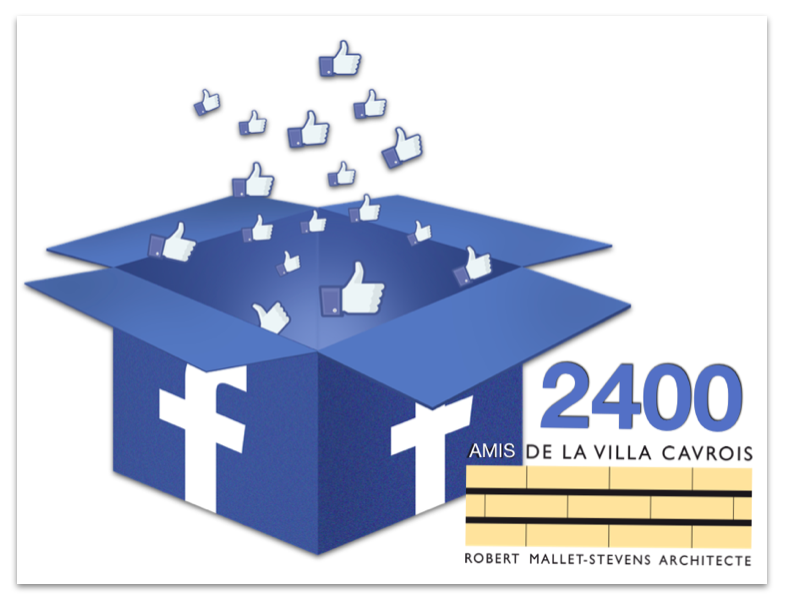 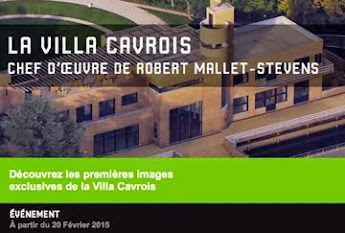 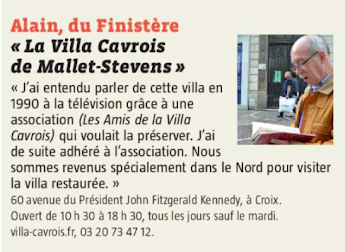 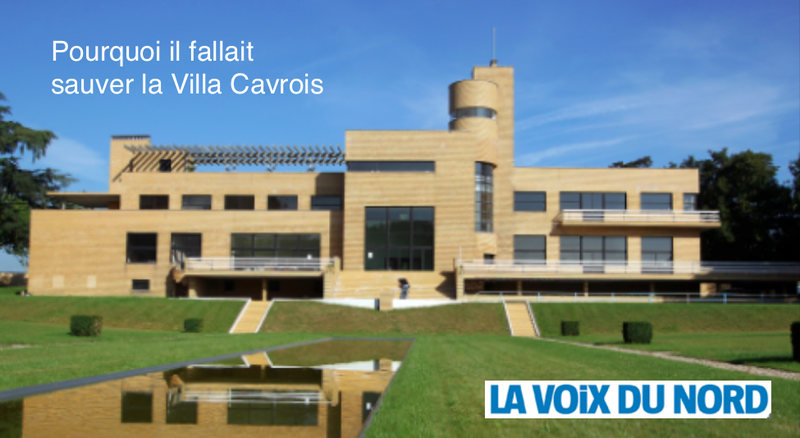 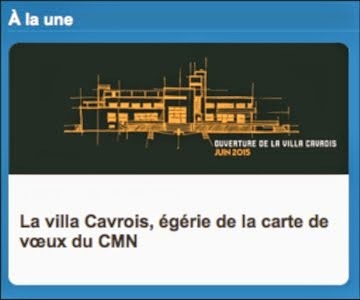 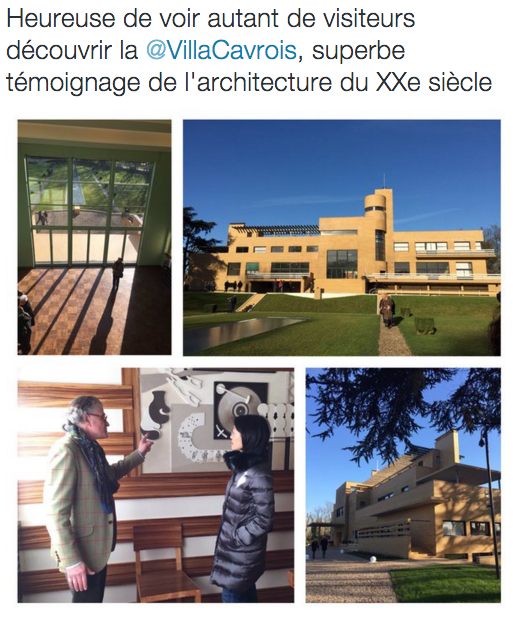 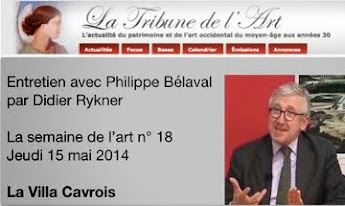 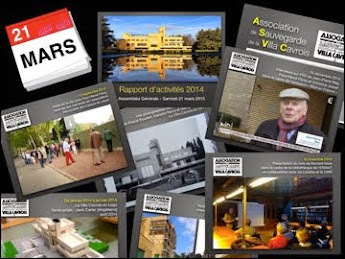 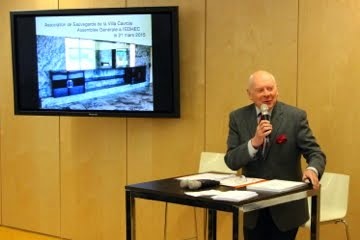 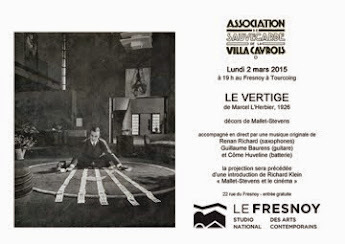 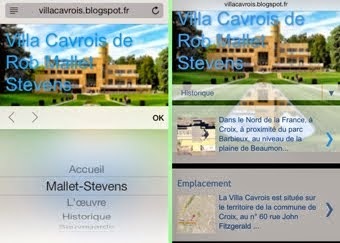 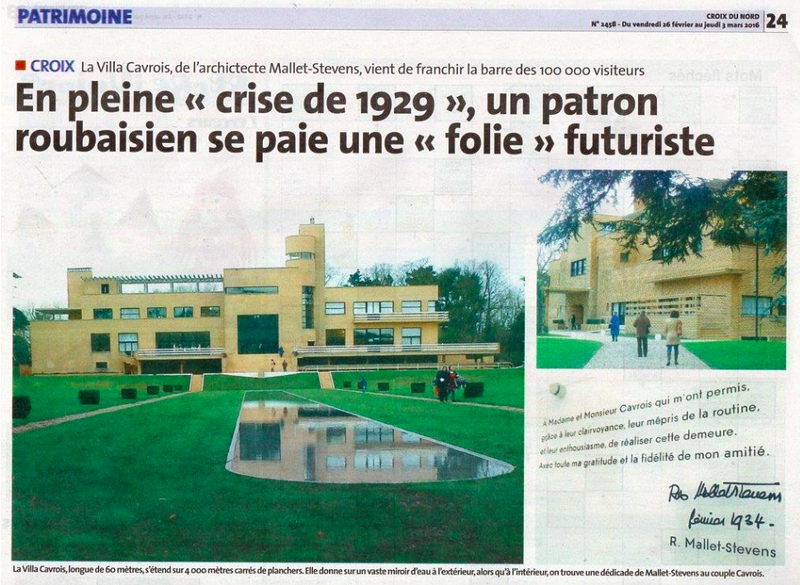 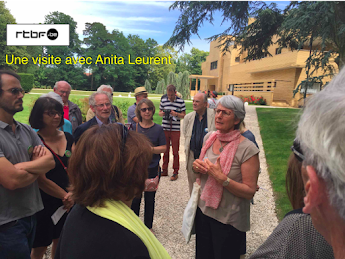 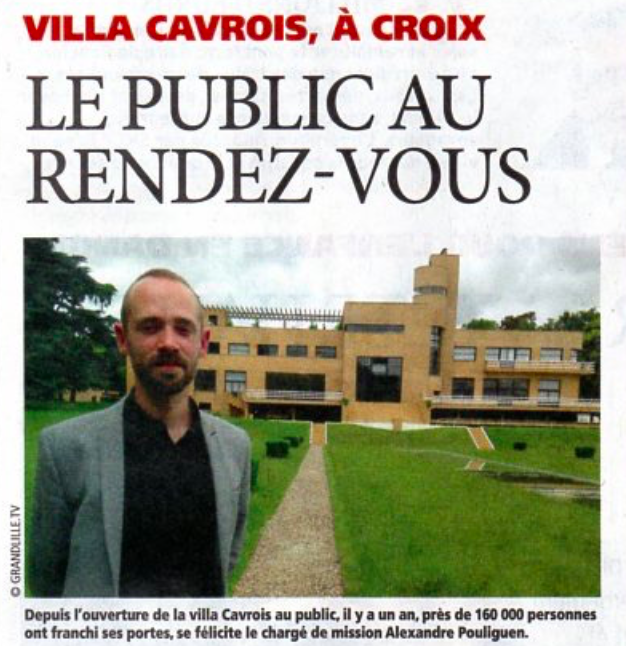 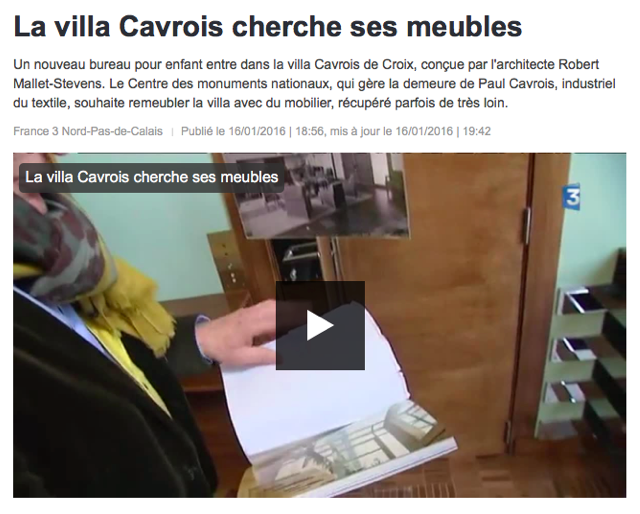 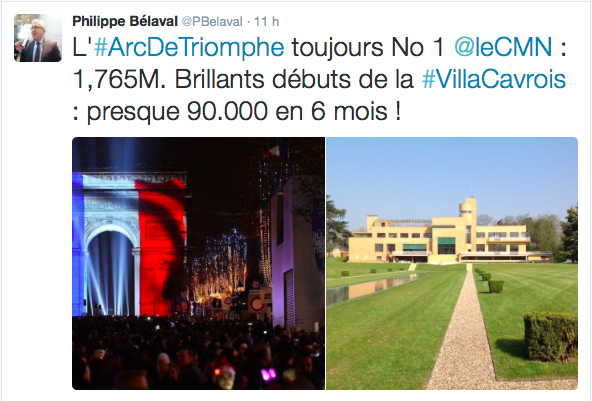 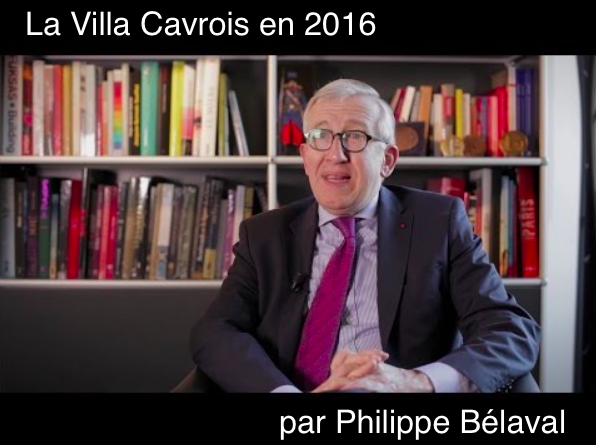 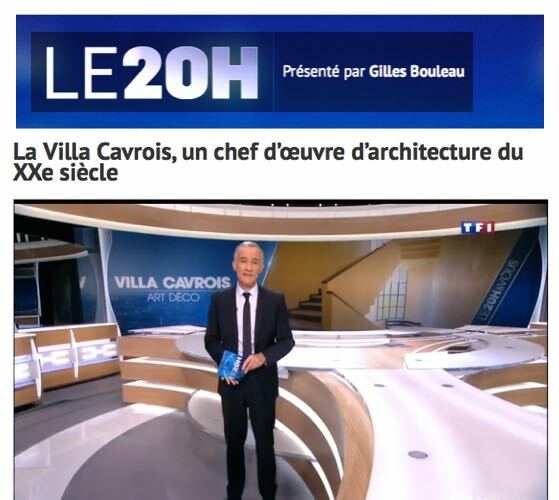 Credit for saving the villa must go to the Association de Sauvegarde de la Villa Cavrois, founded in 1990. 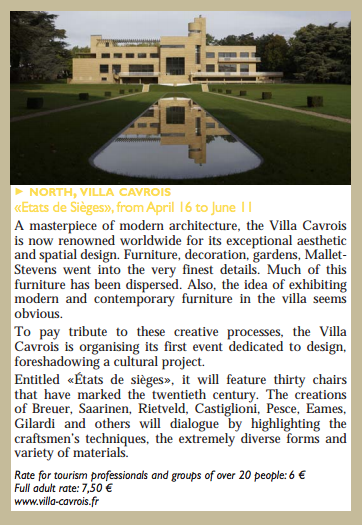 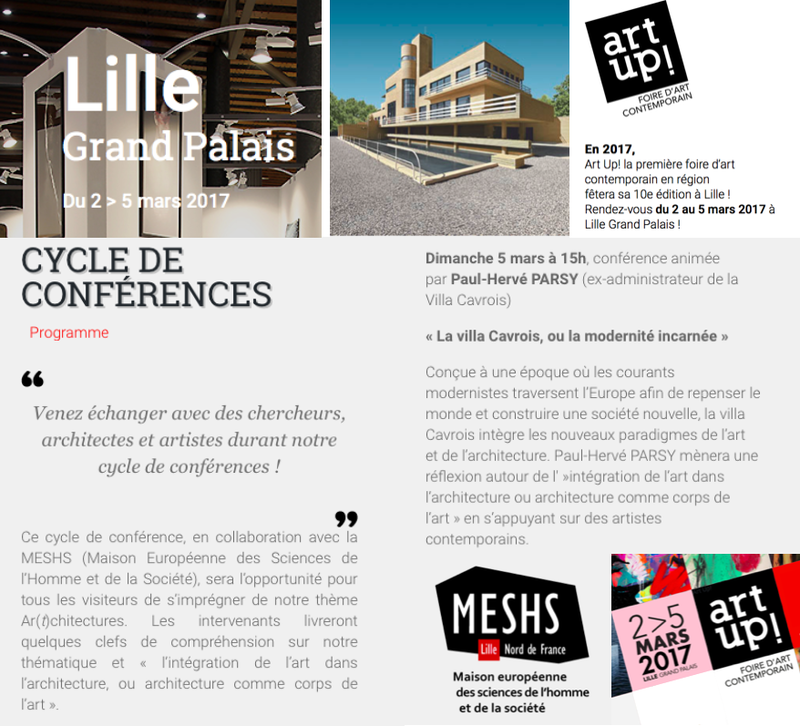 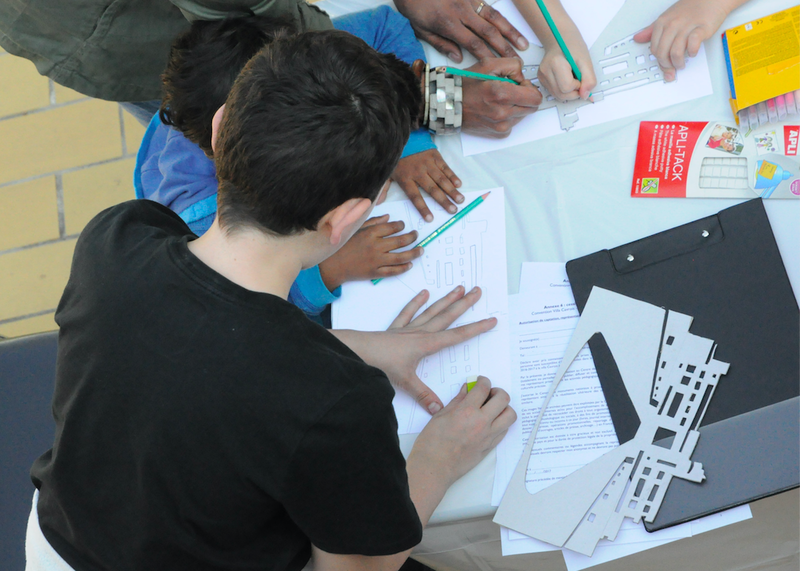 The organisation ran an intensive media campaign supported by several of the world's leading architects including Tadao Ando and Renzo Piano. 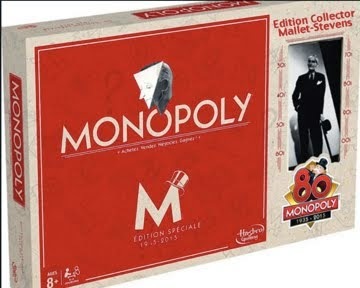 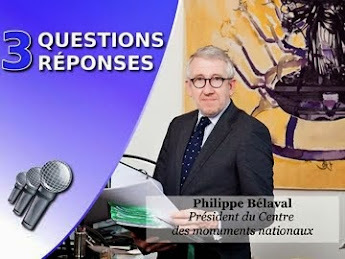 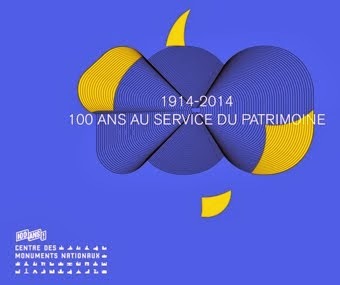 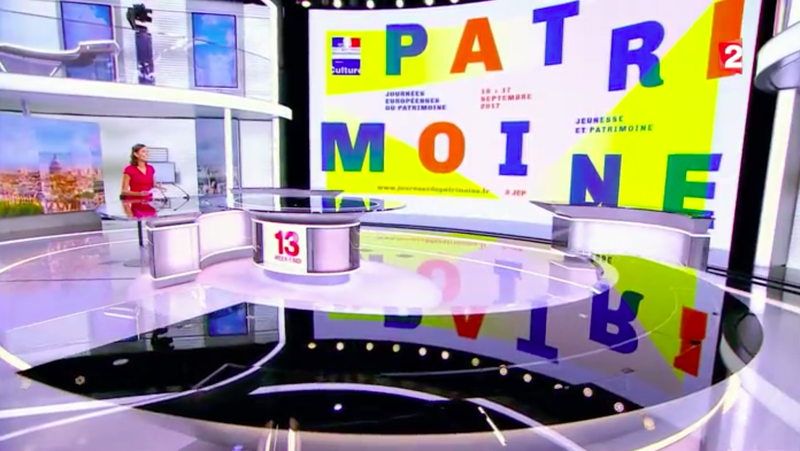 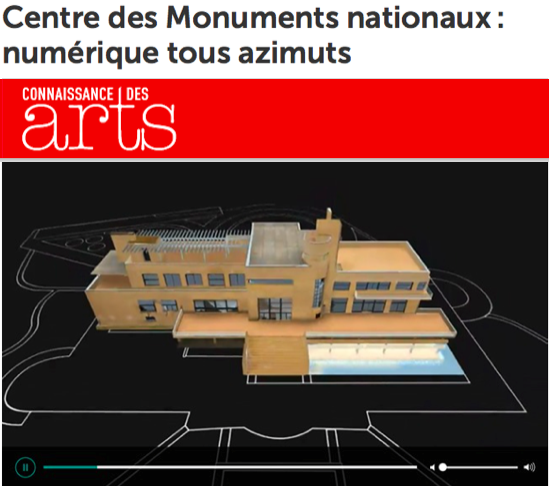 Eventually the state stepped in, purchasing the property in 2001 and handing it to the Centre des Monuments National at the end of 2008. 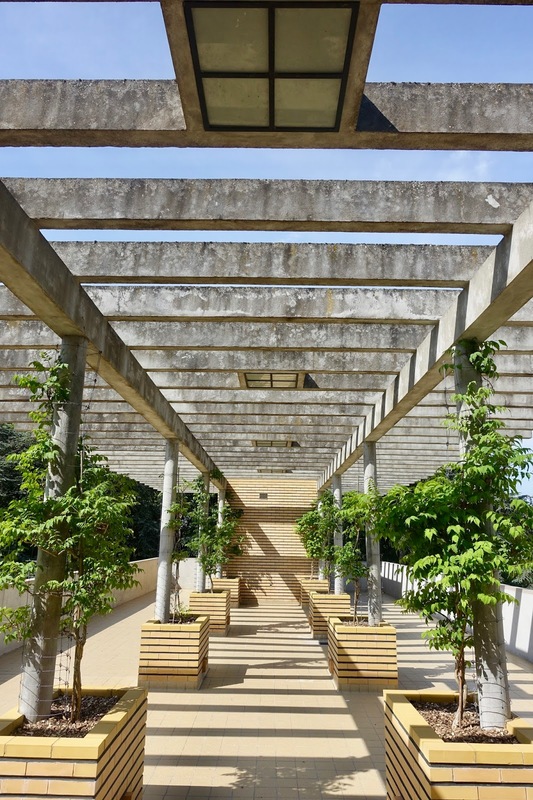 Restoration work began in 2004 and included removing the vegetation growing on the exterior, reinforcing the main structural elements and as far as possible, preserving the original materials. 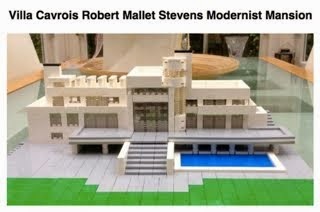 Some of the features added by Barbe as an extension of his 1947 commission were deemed to be detrimental to Mallet-Stevens' work and removed. 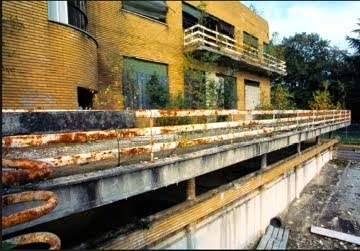 Replacement bricks had to be manufactured for those beyond repair or missing. 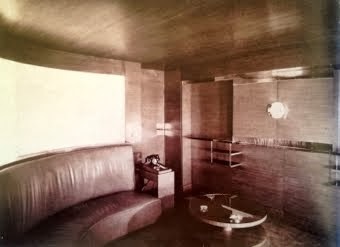 The interior was also in very poor condition but the existence of early documents and photographs aided the work of restoration. 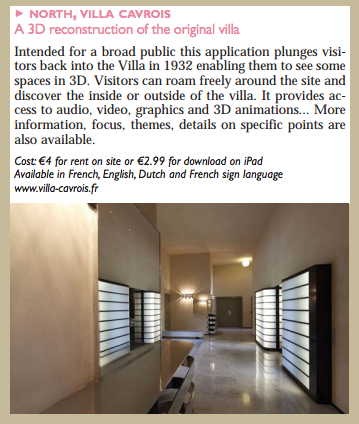 The villa is now open to the public. 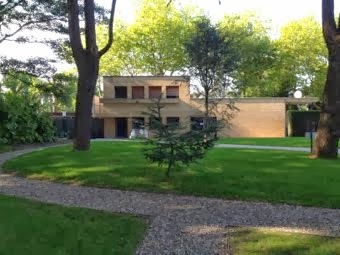 Approaching through the park and the former caretaker's pavilion, the first view of the house and its yellow exterior is quite breathtaking. 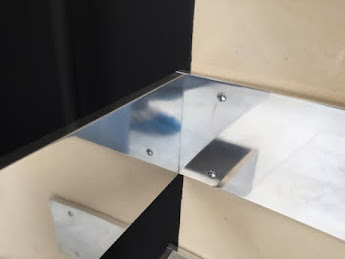 The varying heights and masses, recesses and glazed surfaces make it difficult to know where to look first. 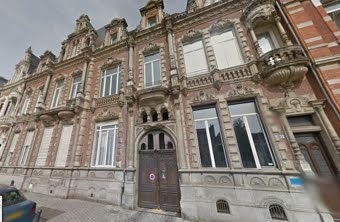 The main doors are flanked by beautiful curved brickwork, reminiscent of the entrance to number 10 Rue Mallet-Stevens in Paris. 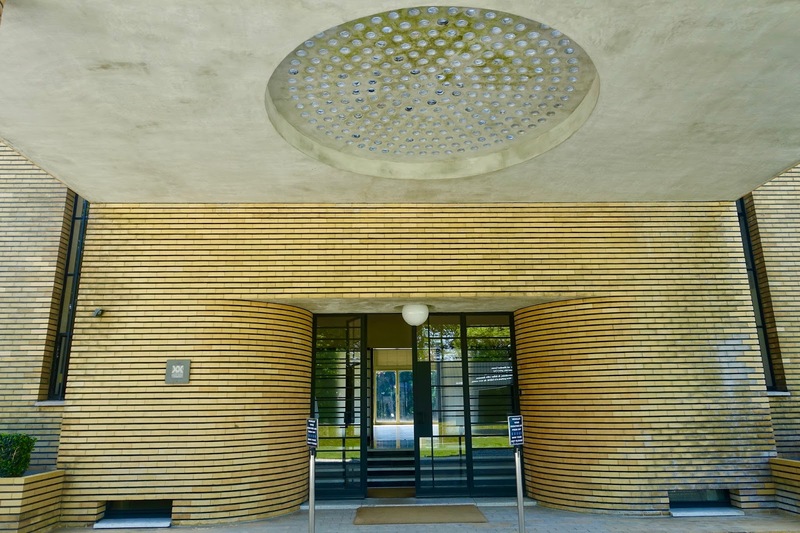 A canopy supported by rounded brick pillars protects visitors from the elements whilst light filters through from above by means a circular glazed element. 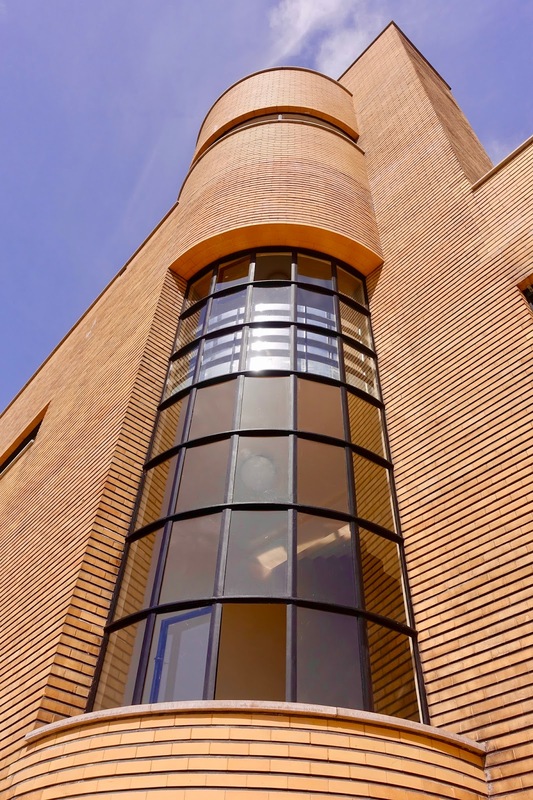 The glazed elements of the facade include both austere, narrow horizontal windows in the "box" shaped sections as well as a "thermometer" at the rear which runs the length of a staircase connecting all floors. 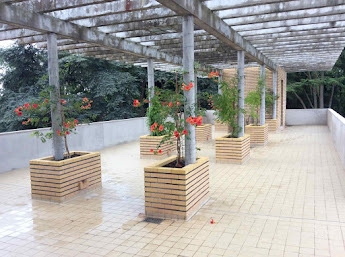 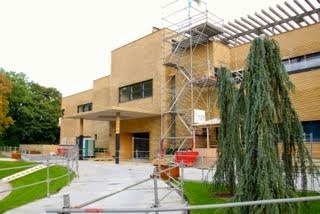 The roof terrace includes a long pergola and even here, the yellow bricks are in evidence, being used as tree planters. 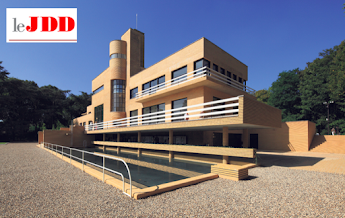 Other elegant features include the concrete diving boards and white hoop ladder for the pool at the rear of the house - although the pool looks rather shallow for diving today! 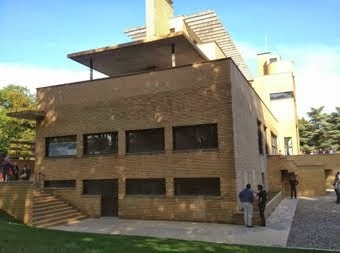 This feature demonstrates nicely the play of light and shadow on the villa with the hoops reflected on the bricks. 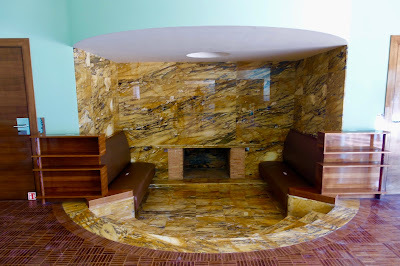 The interior is equally striking. 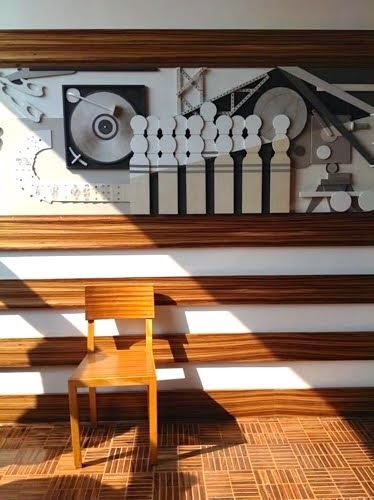 Materials used include opaline glass, white marble for the stairs with black marble for the risers, aluminium wall covers, pear wood and ceramic tiles. 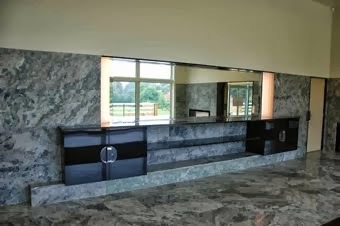 The salon-hall is especially impressive, occupying a large space and overlooking the park. The showstopper is the yellow Sienna marble fireplace and built in bench seats. 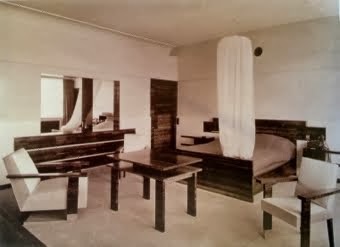 Several of the rooms contain original furnishings all of which were designed by the architect. 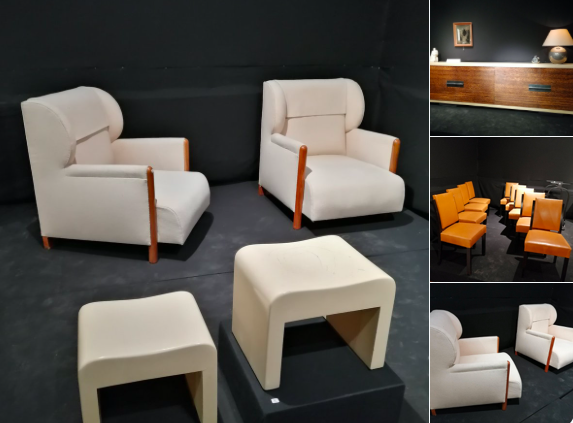 Much of the furniture had been sold in 1987 but the original inventory made it possible to recover some items which are now on display. 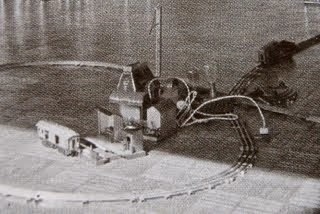 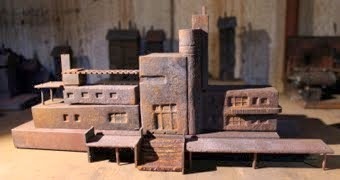 They have been placed according to the layout shown in photographs from the 1930's. 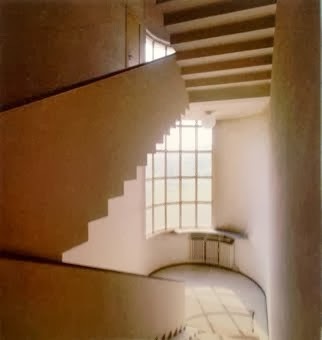 Much as I like that fireplace, my favourite internal feature has to be the staircase linking all of the floors at and above ground level. 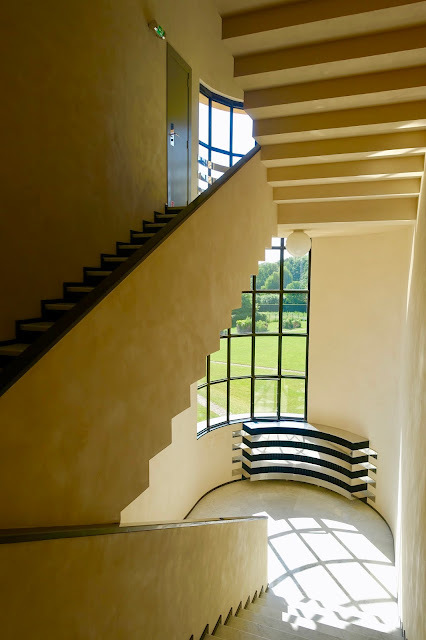 Despite being encased with a curved glass thermometer, the staircase is not of the spiral style, rather a more conventional angled backwards and forwards design that lends itself beautifully to the zig-zag patterns on the risers and under the steps. 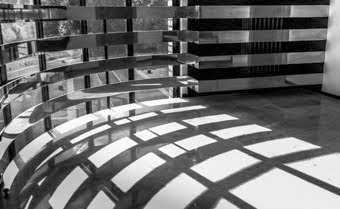 This is a sharp contrast with the shapes caused by the play of light on the rounded landings, reflecting the window-frames. 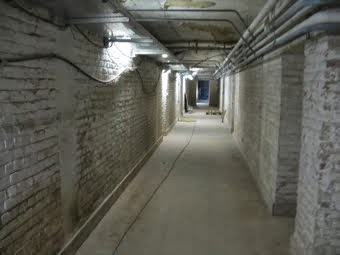 The works were completed in 2015. 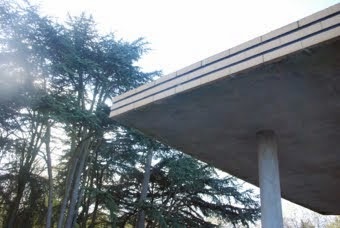 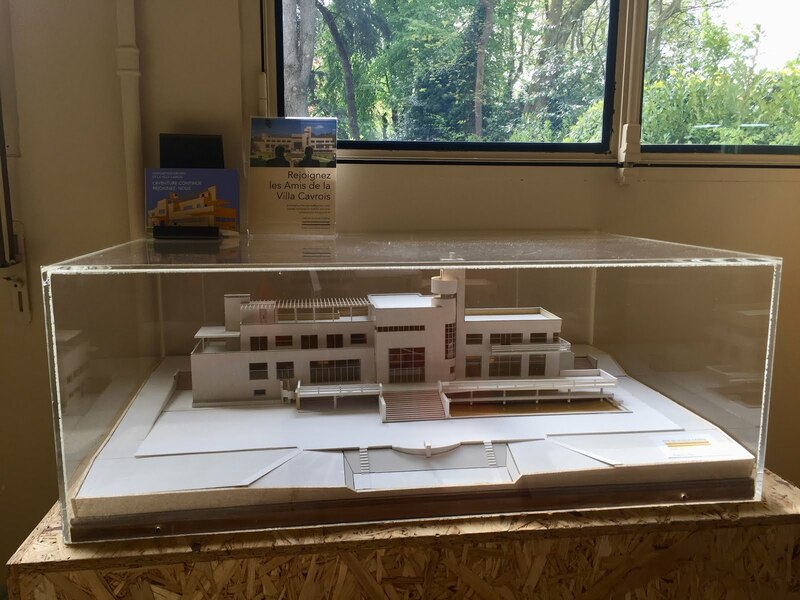 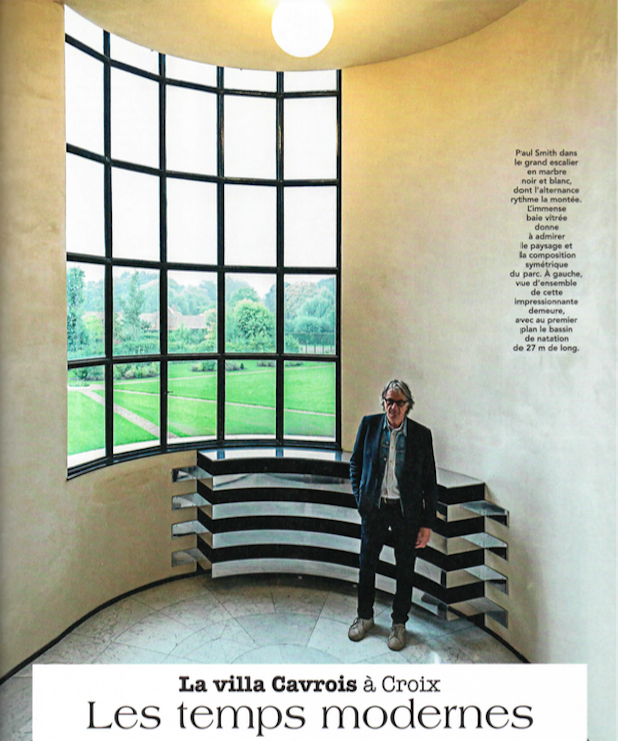 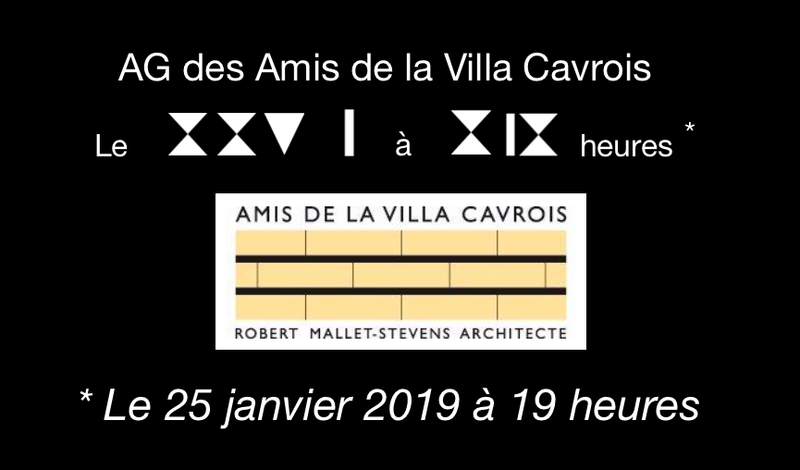 Since 2012 Villa Cavrois has been part of an international conservation programme designed to protect important 20th century houses - the Iconic Housesprogramme, furthering assuring the future of Mallet-Stevens' wonderful work. 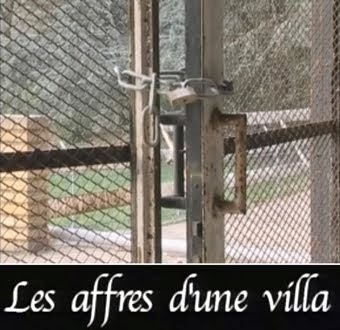 Details of when the Villa is open for visits can be found here.